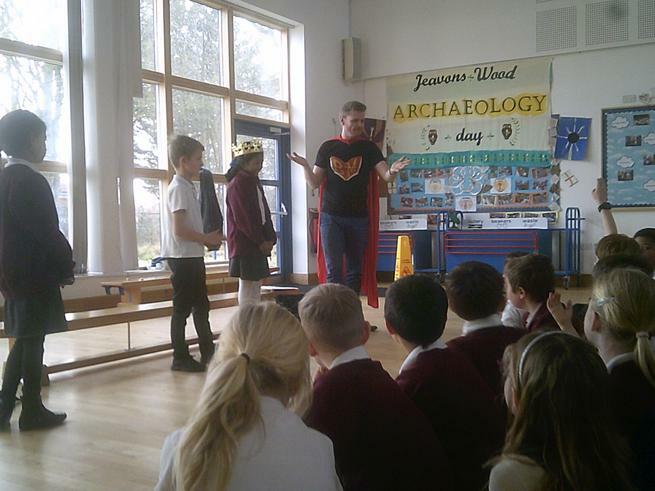 This week we had a visit from Bookman and discussed all of our favourite stories. 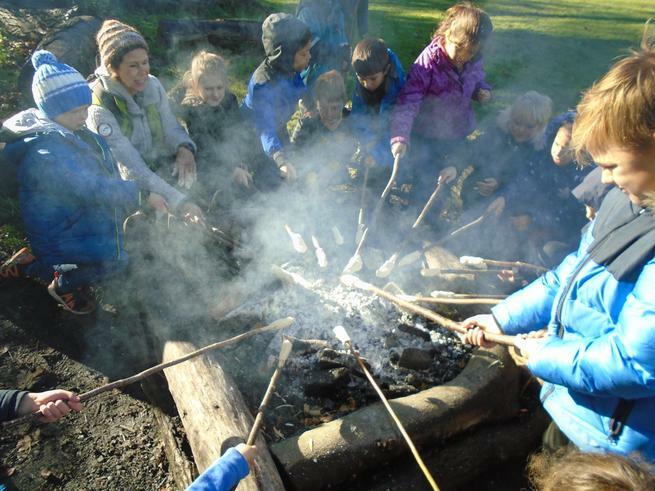 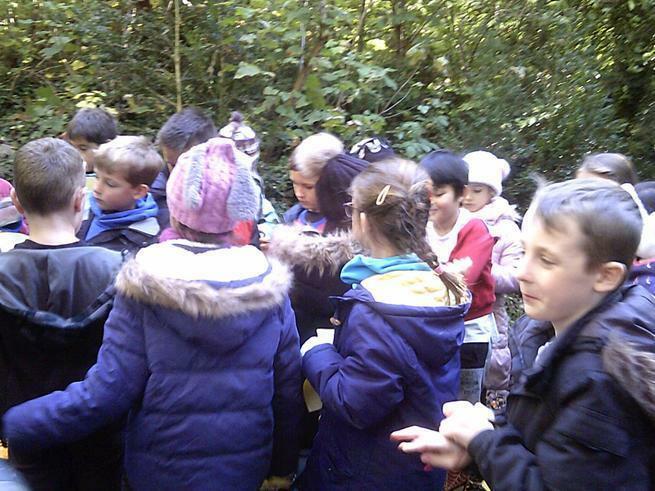 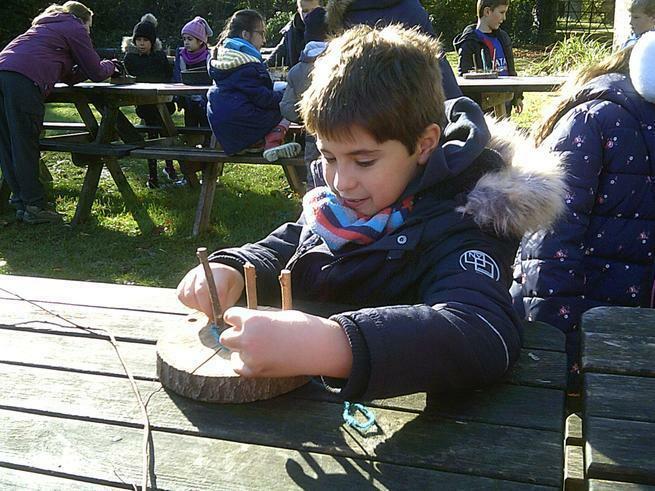 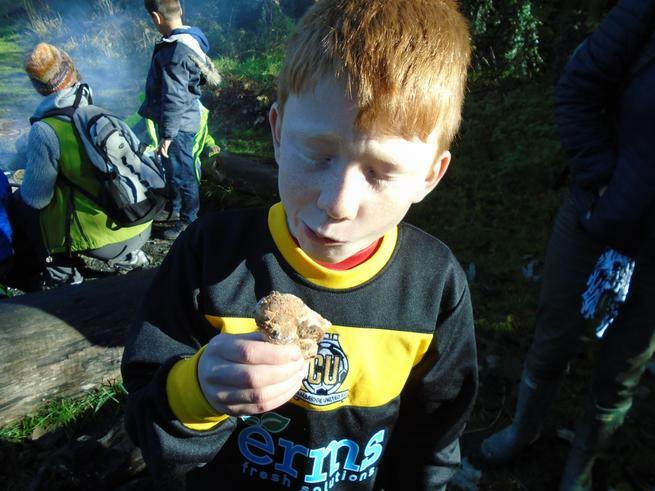 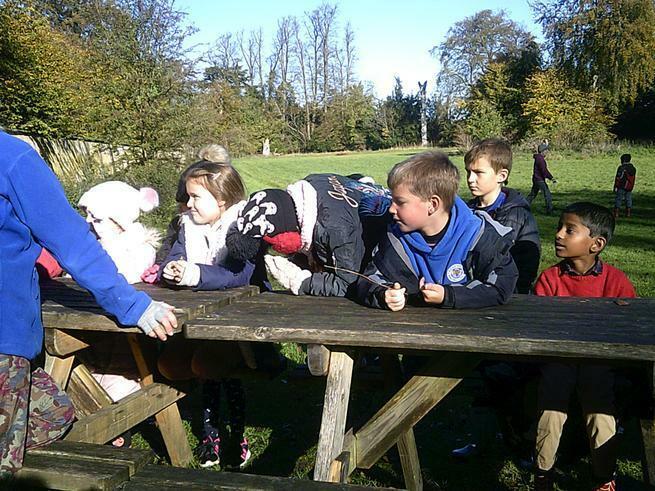 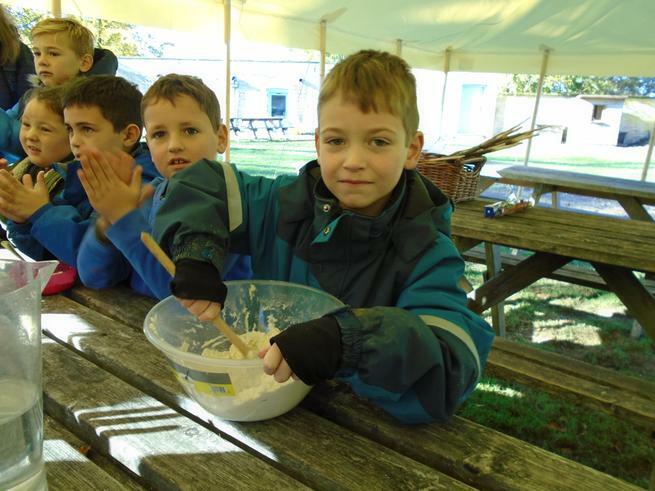 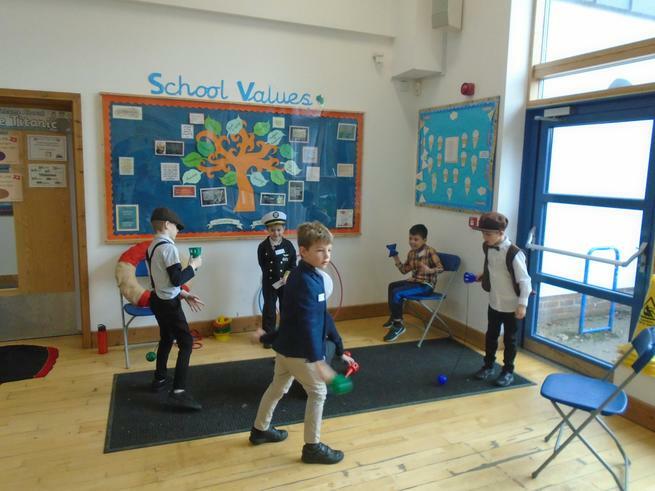 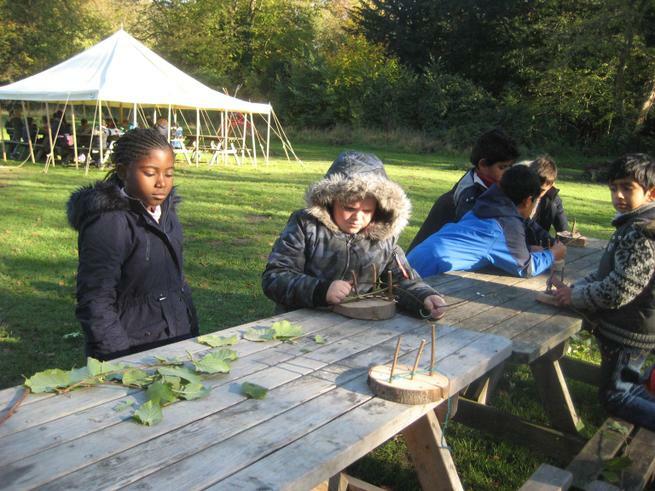 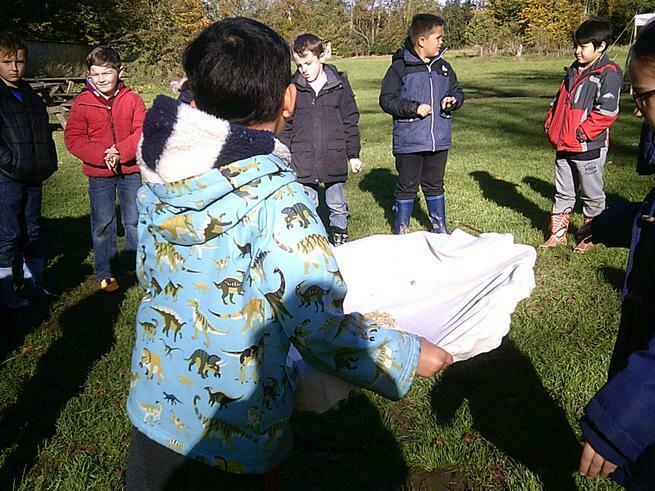 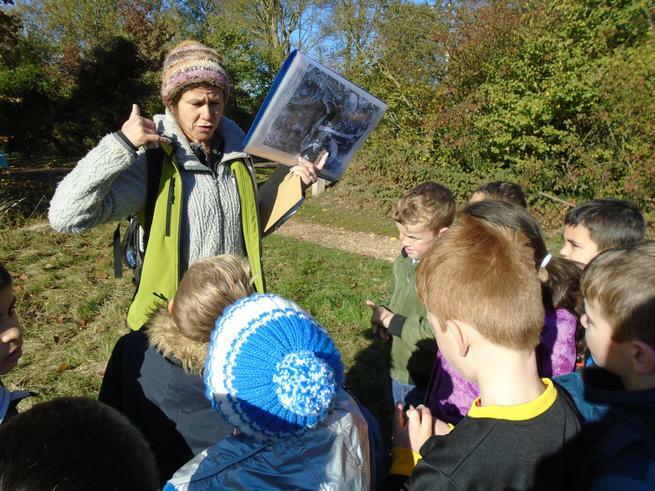 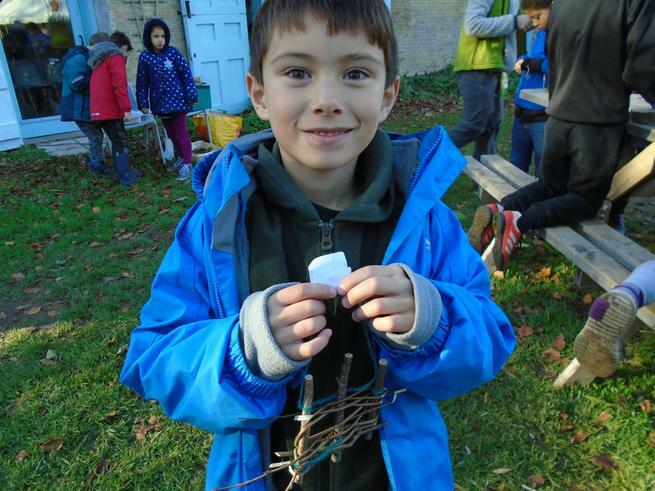 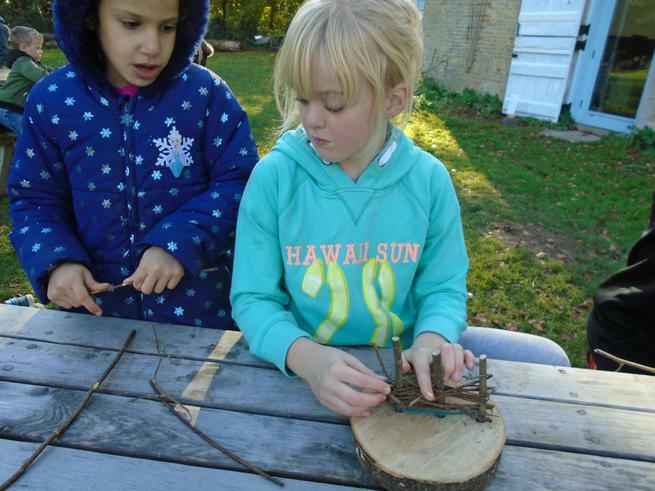 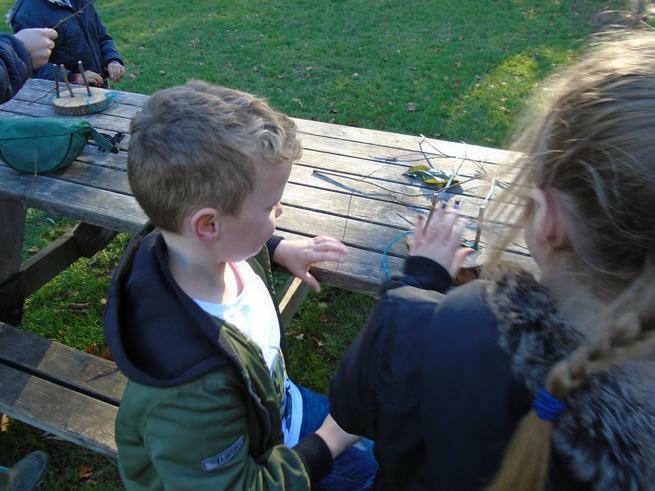 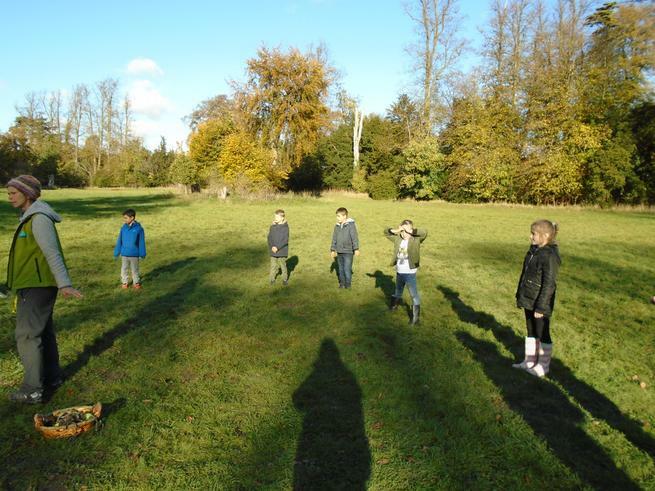 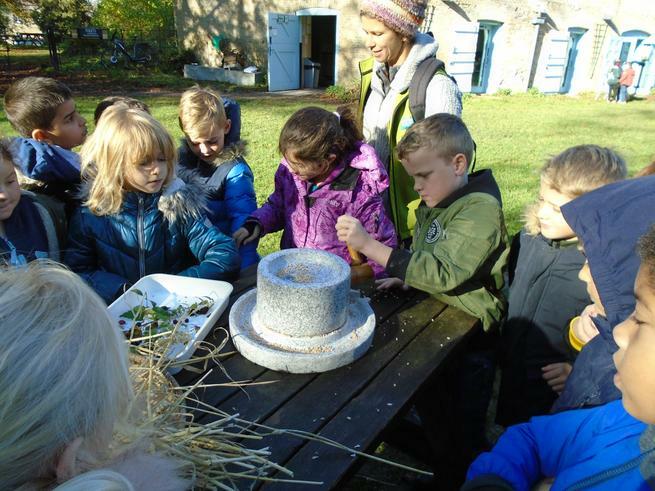 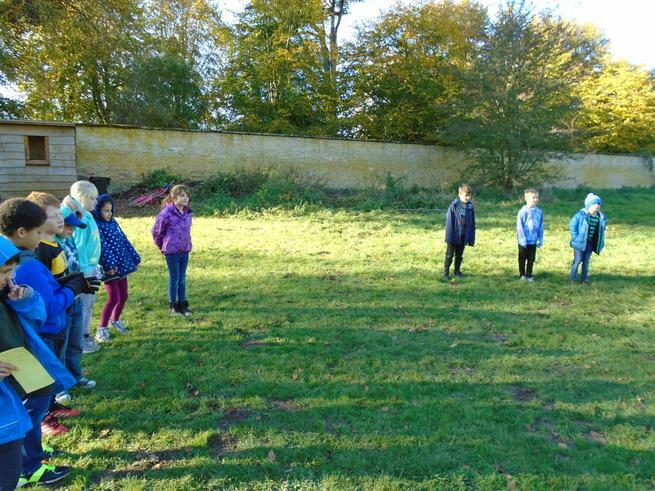 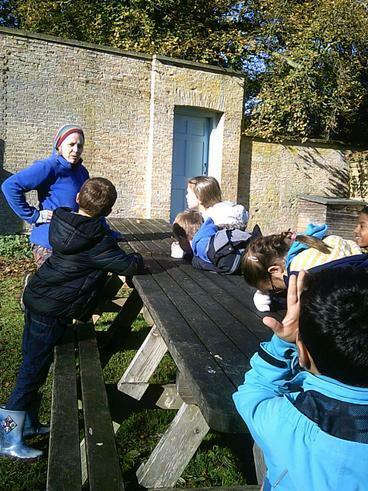 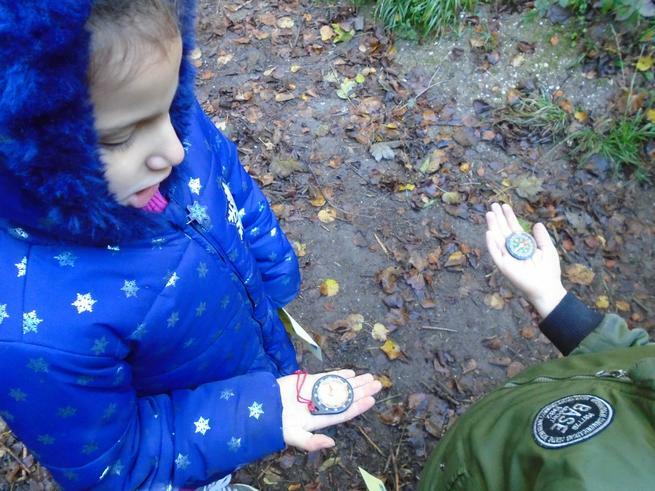 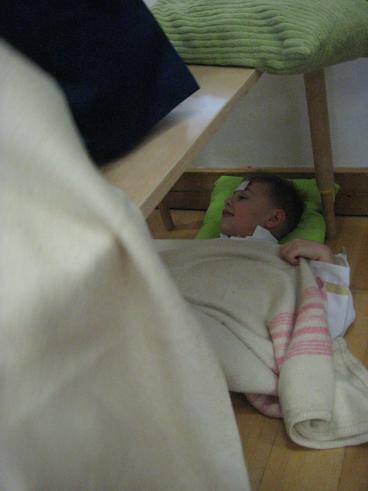 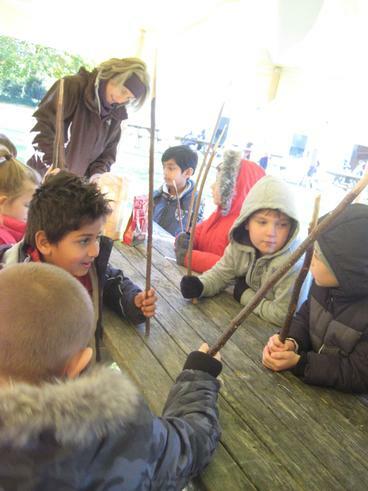 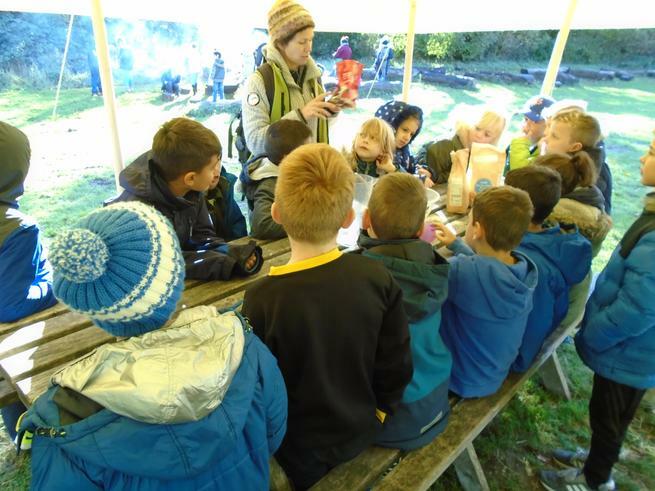 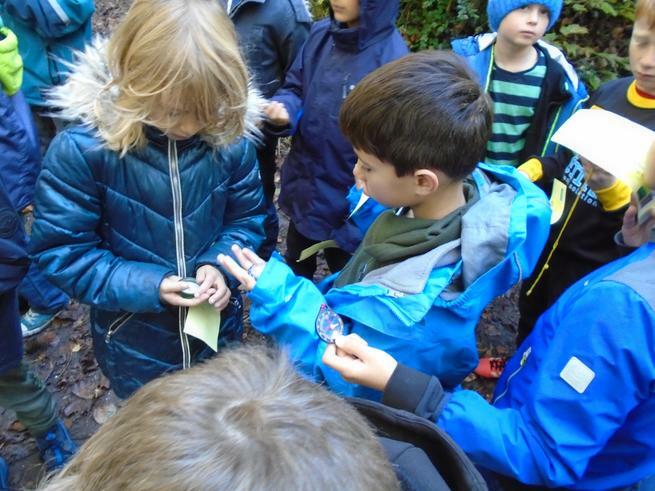 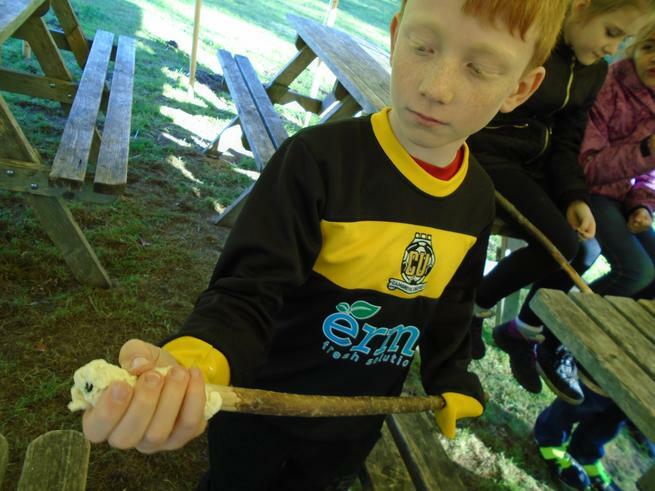 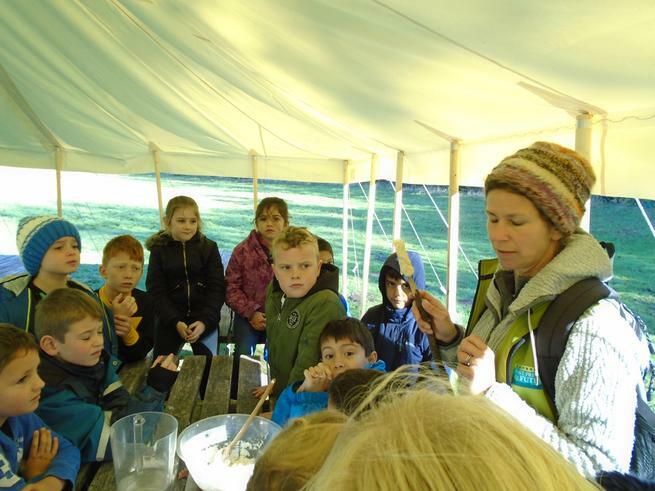 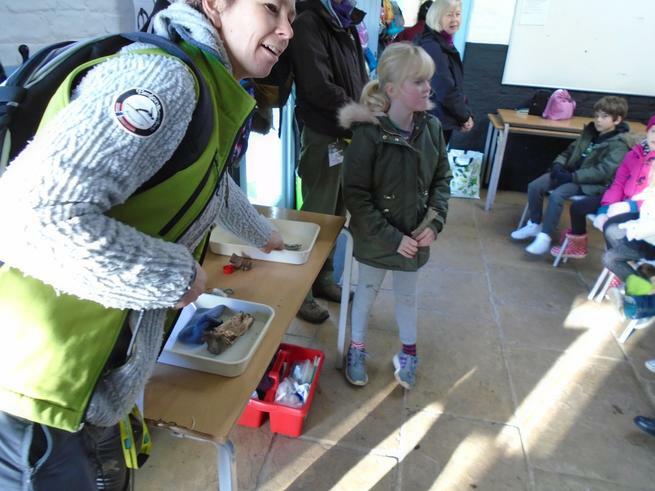 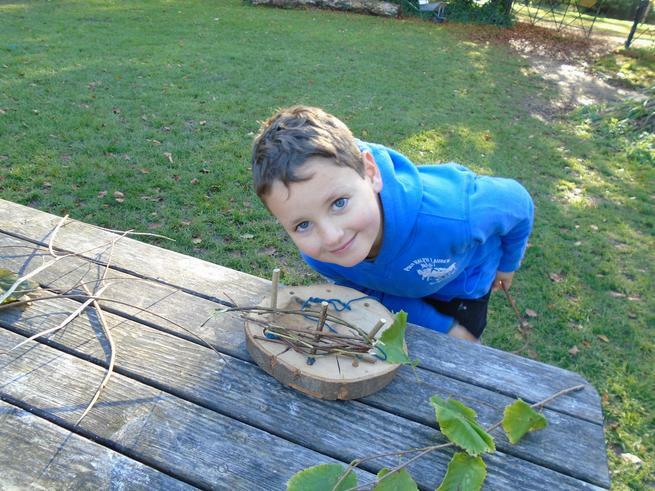 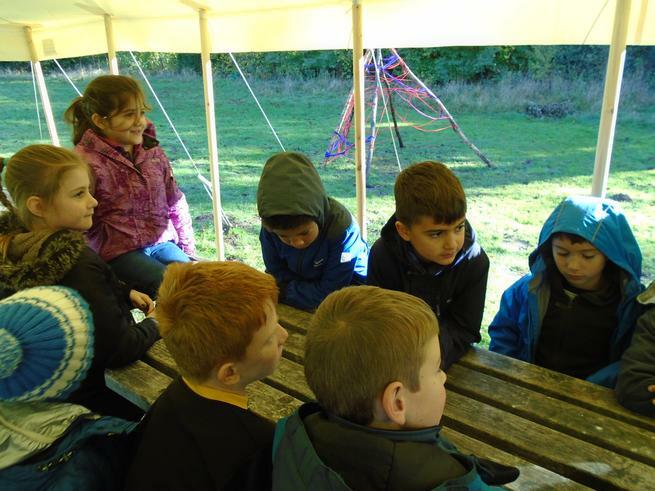 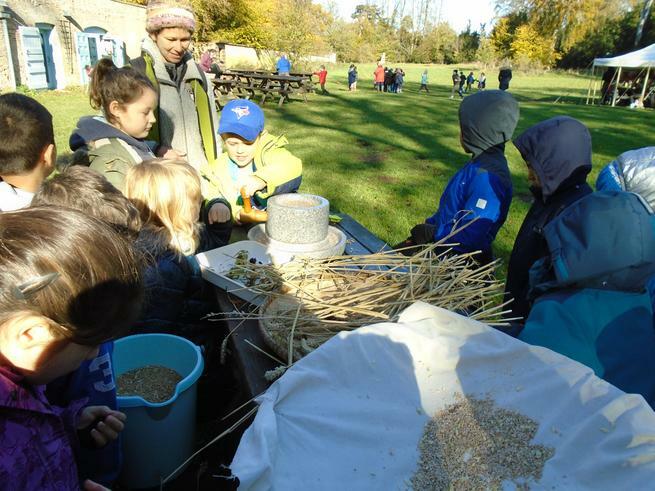 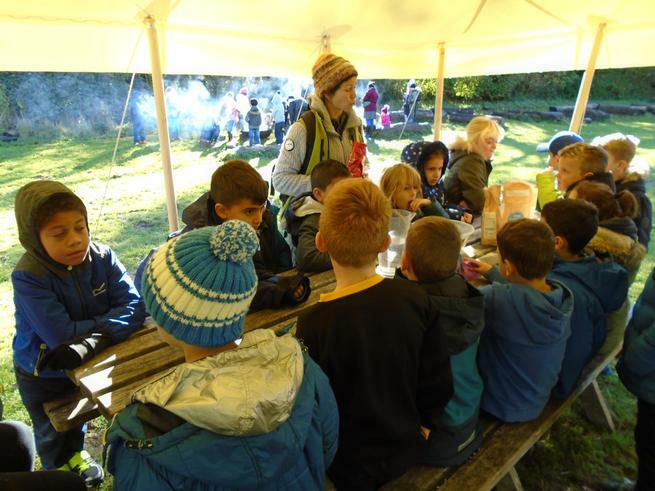 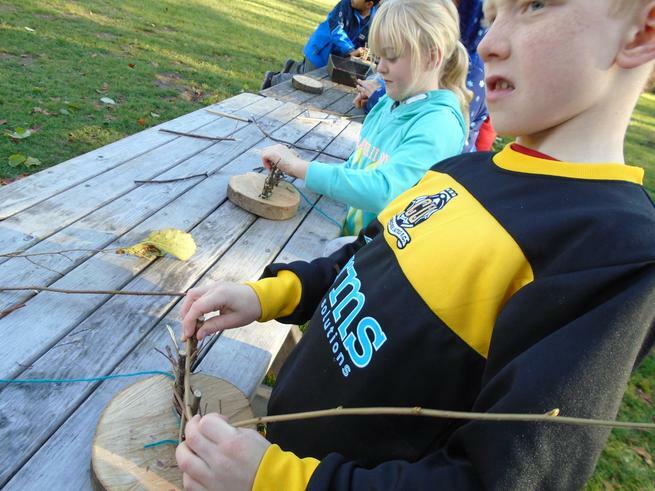 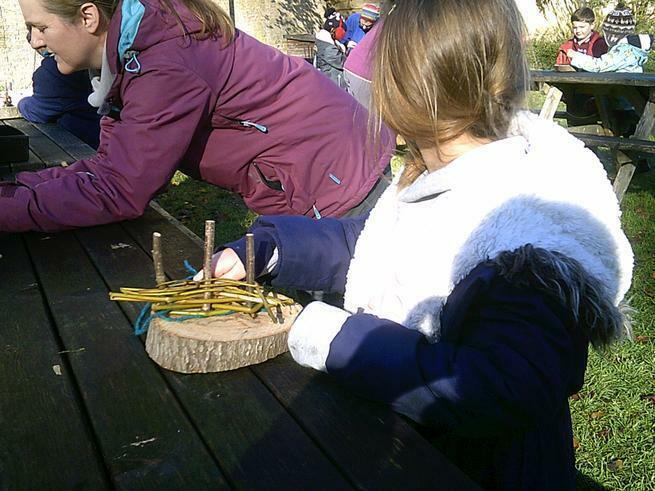 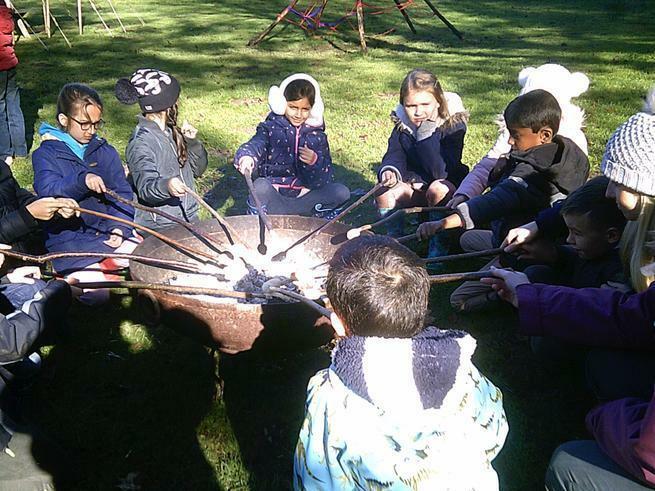 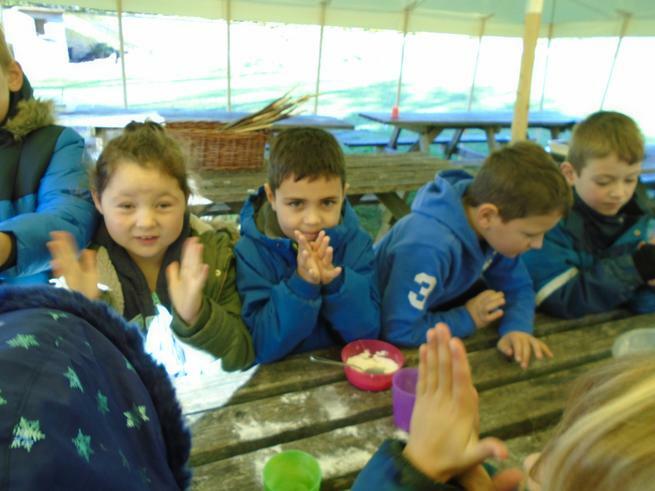 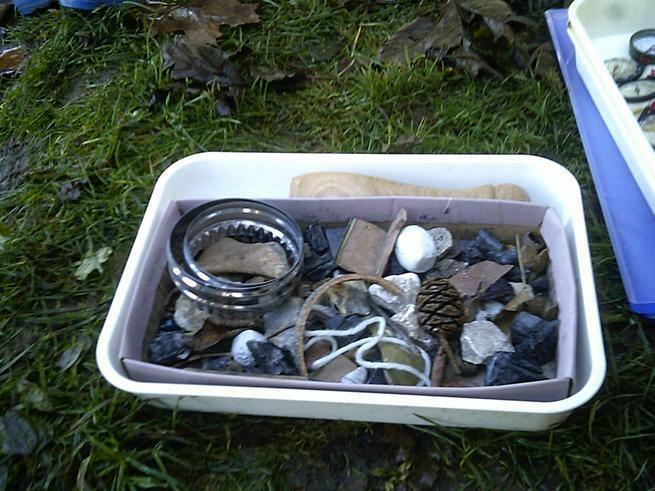 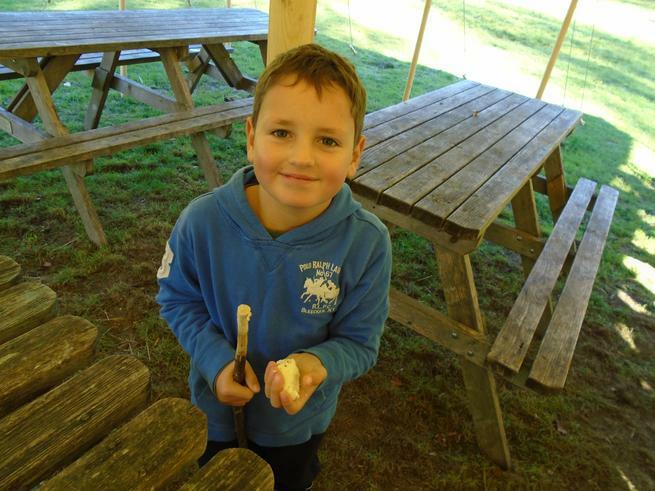 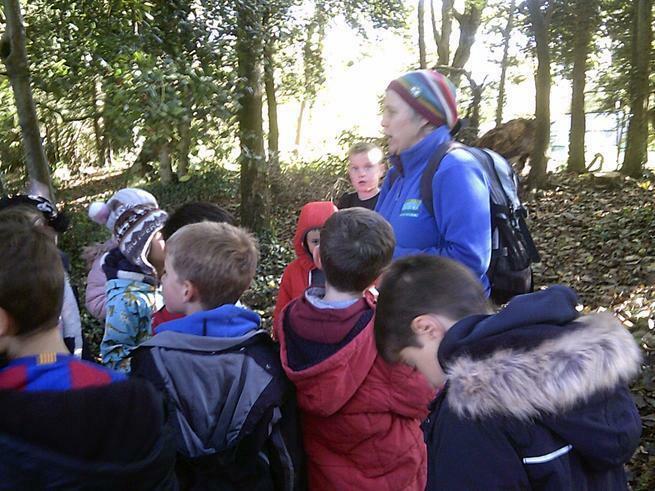 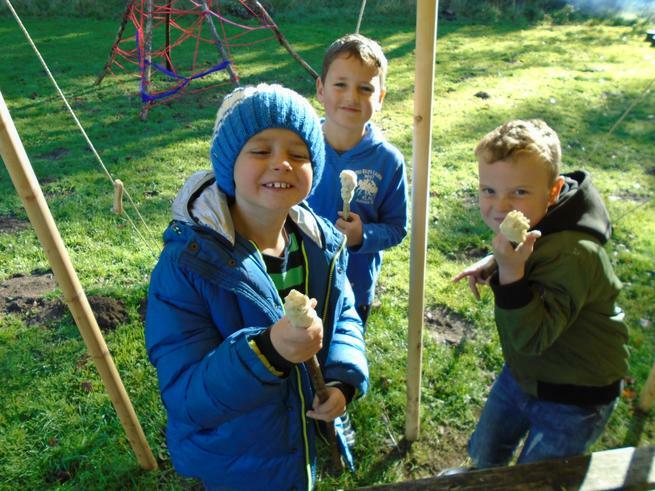 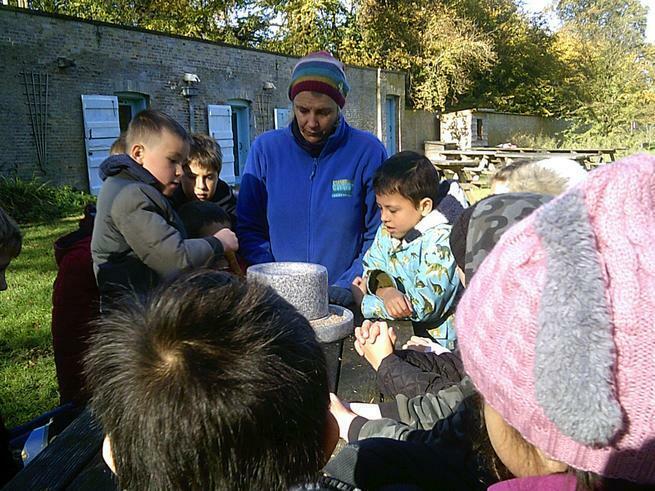 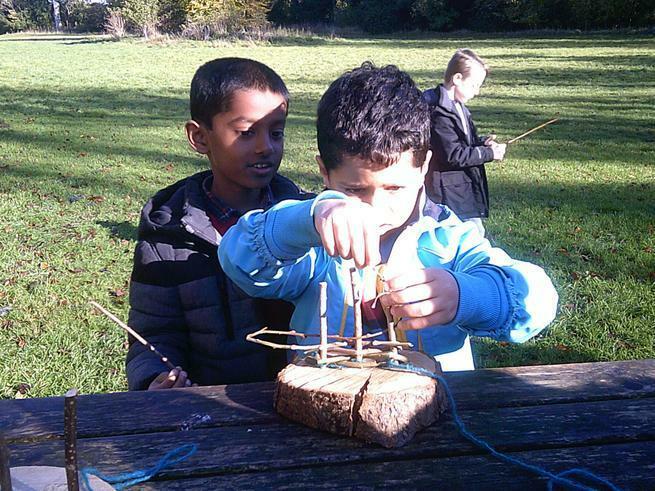 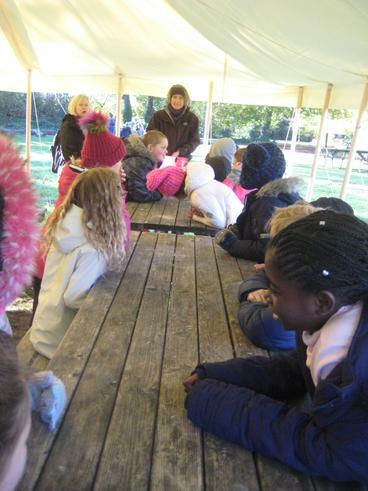 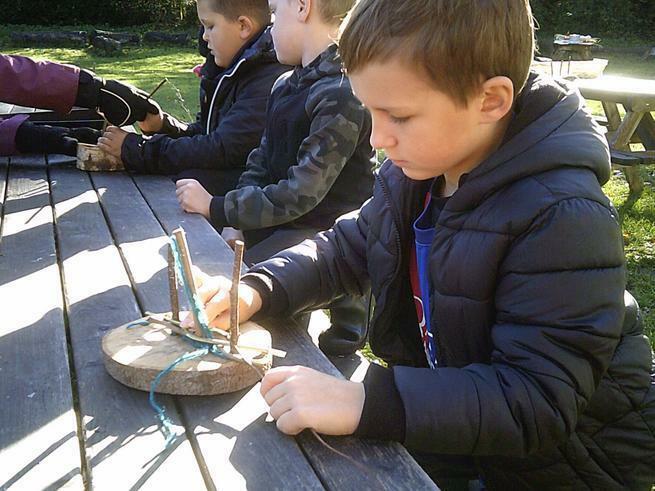 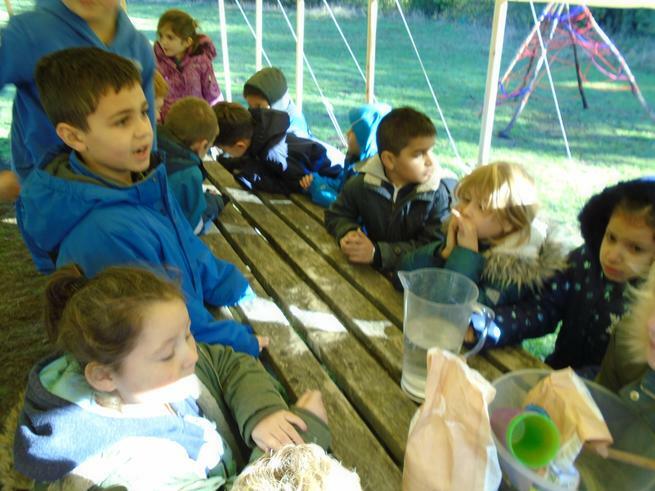 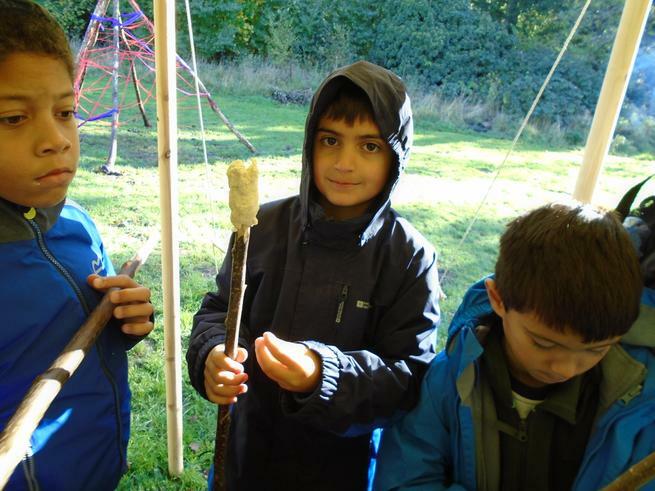 The children were really engaged in the activities and had lots to talk about afterwards. 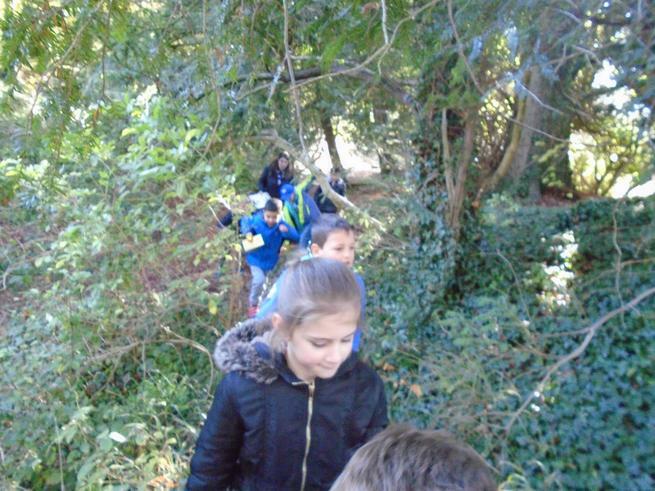 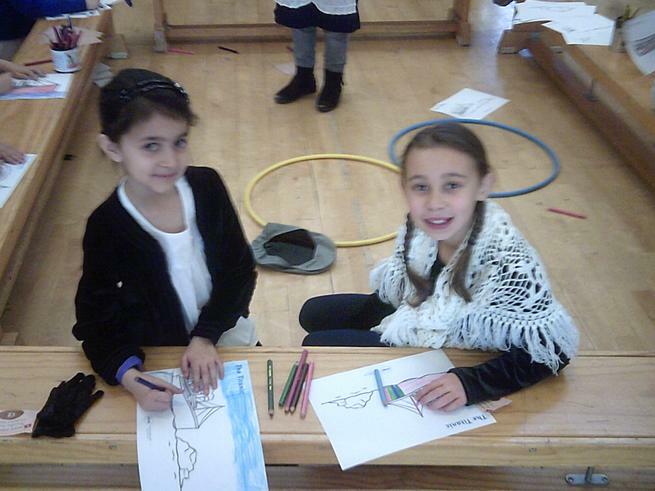 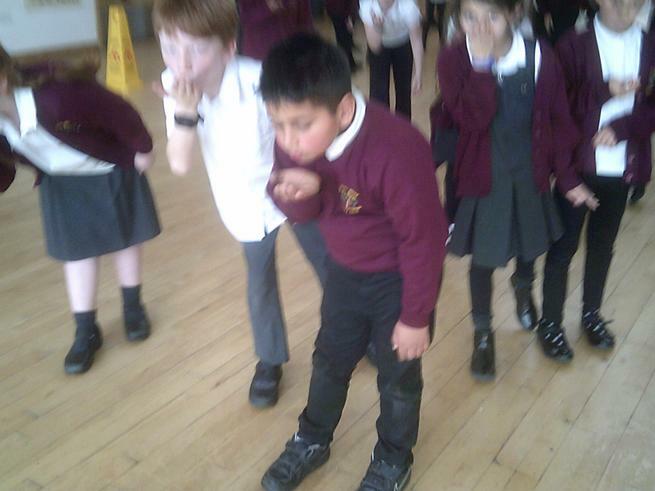 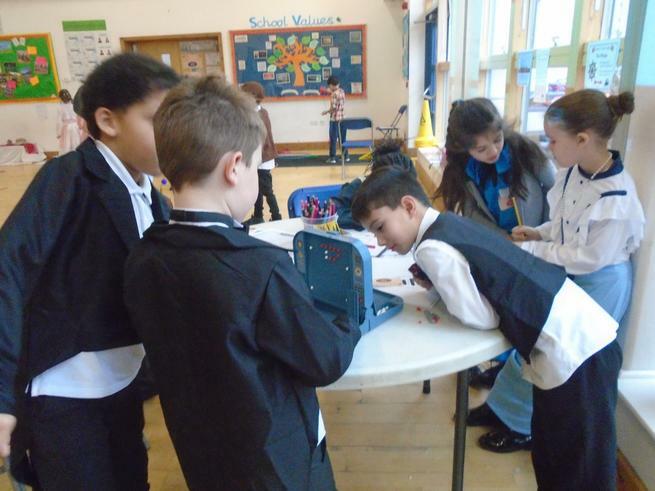 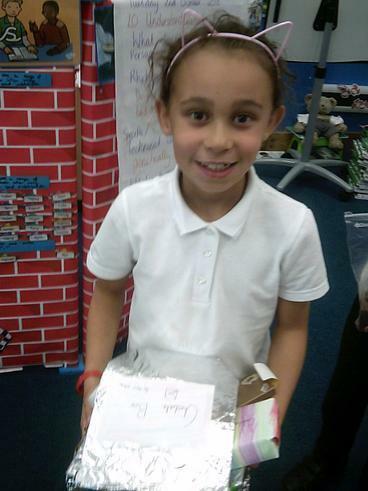 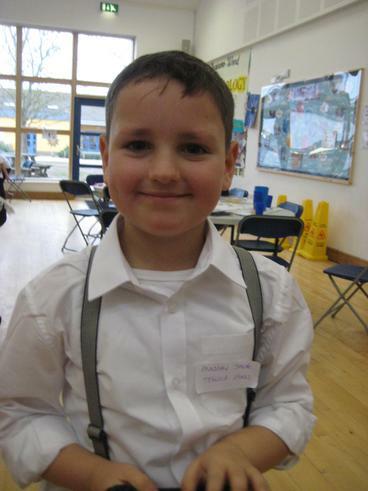 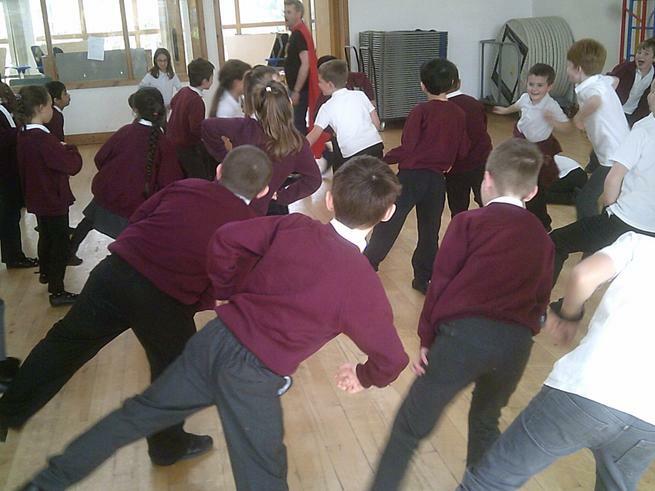 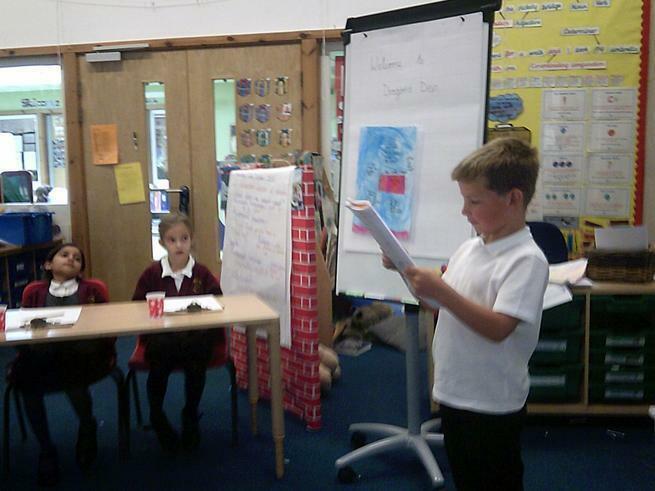 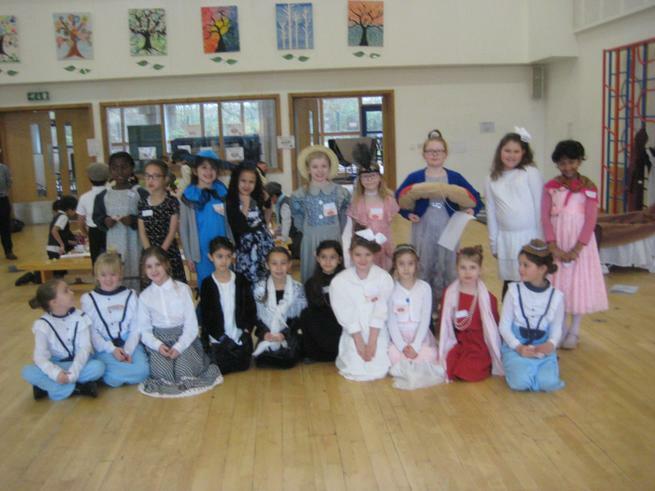 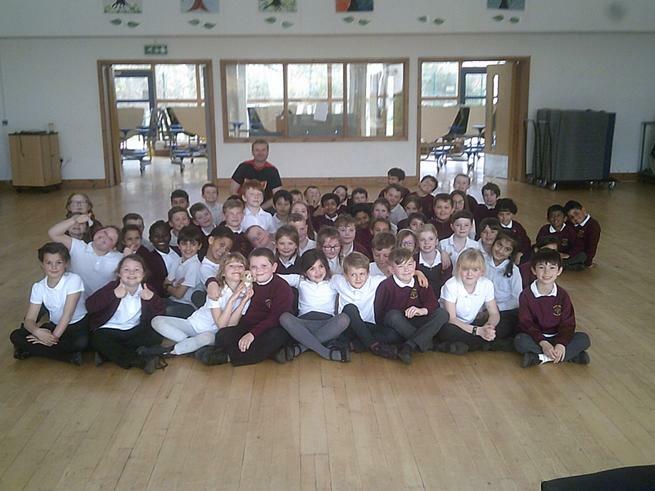 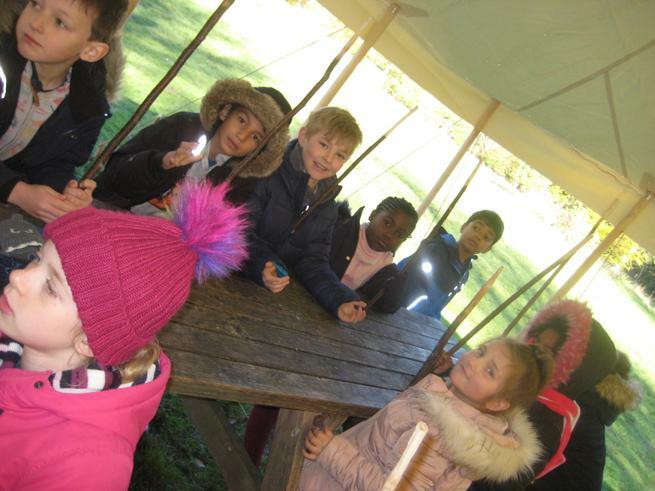 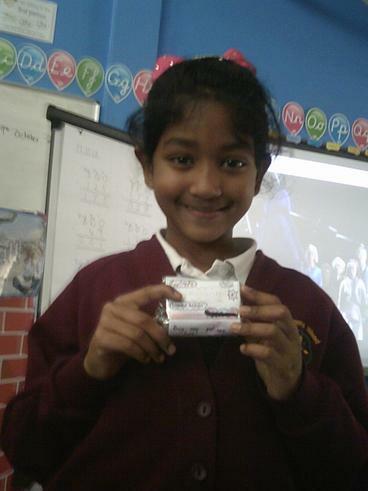 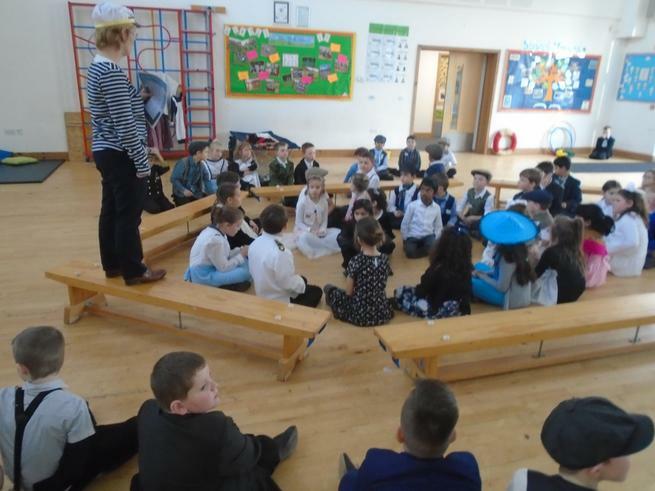 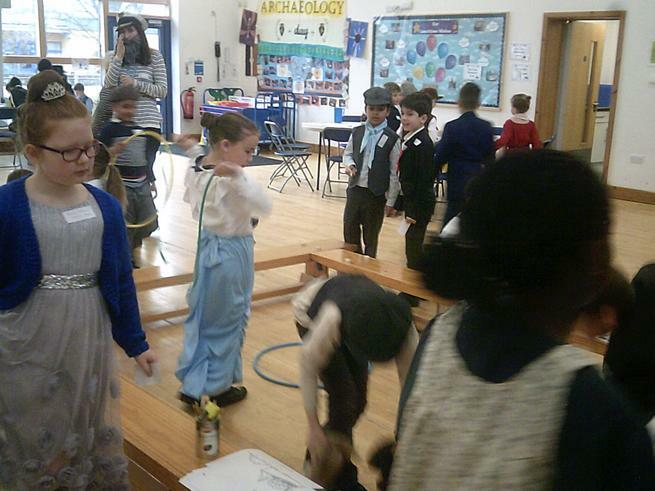 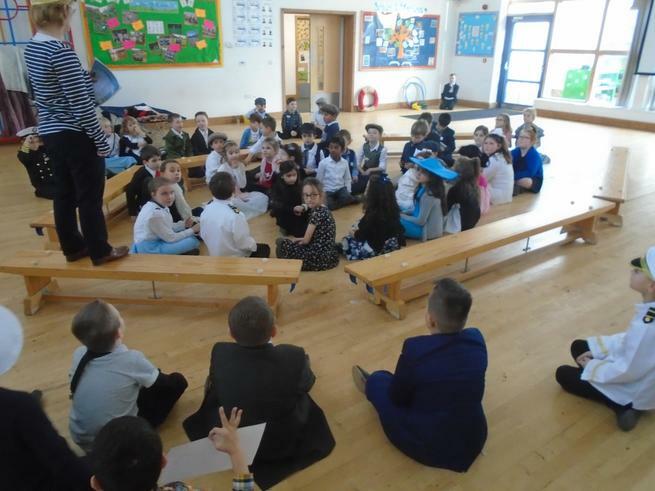 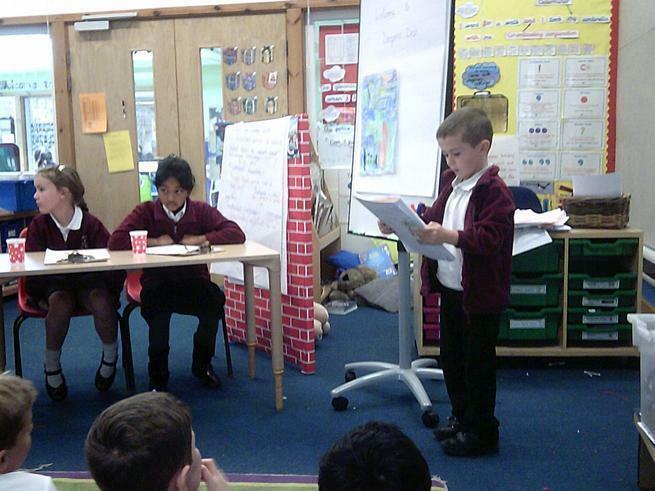 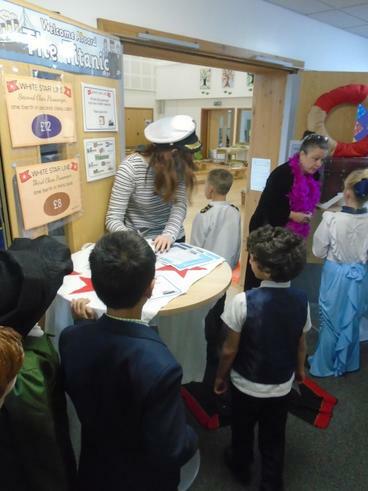 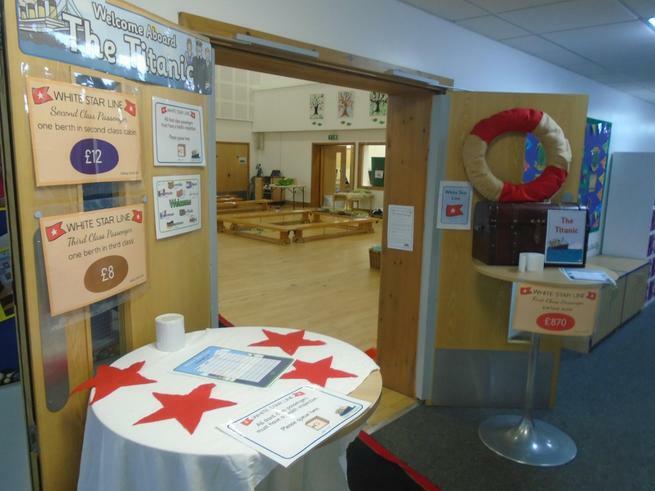 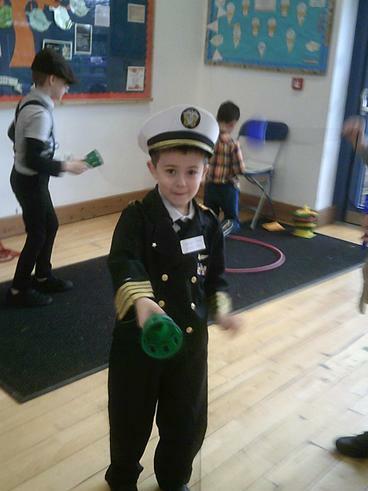 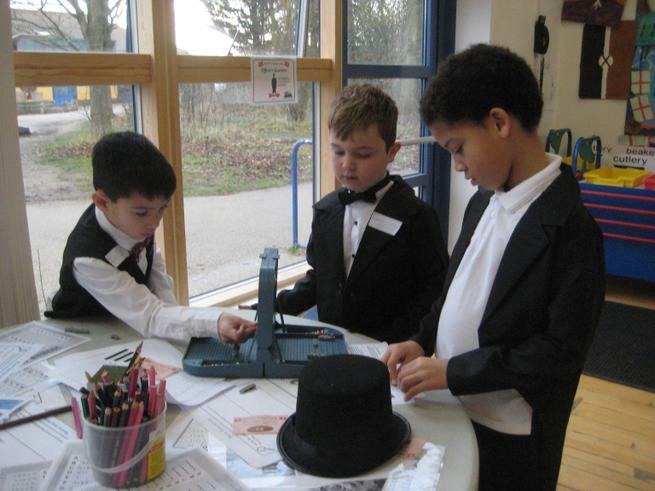 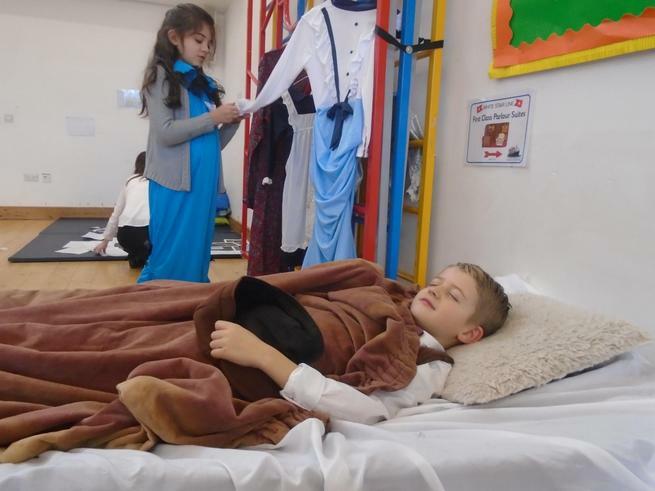 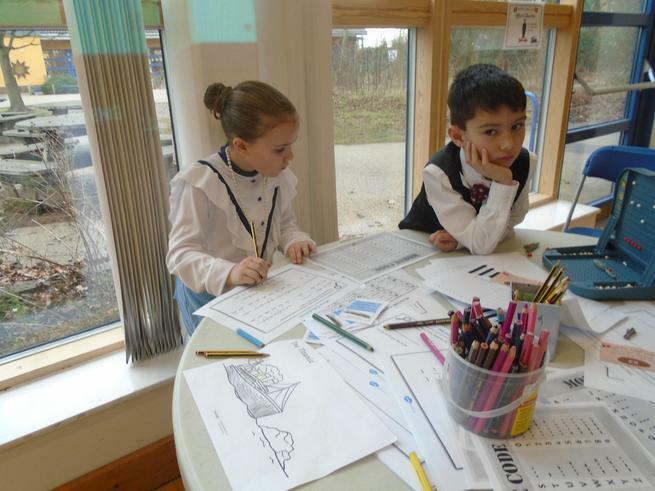 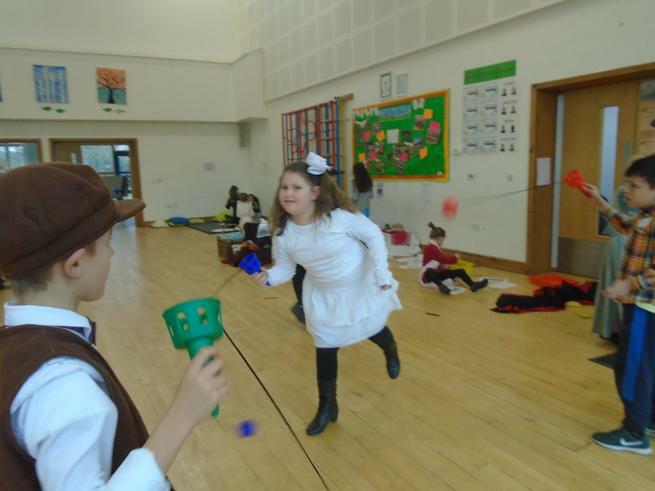 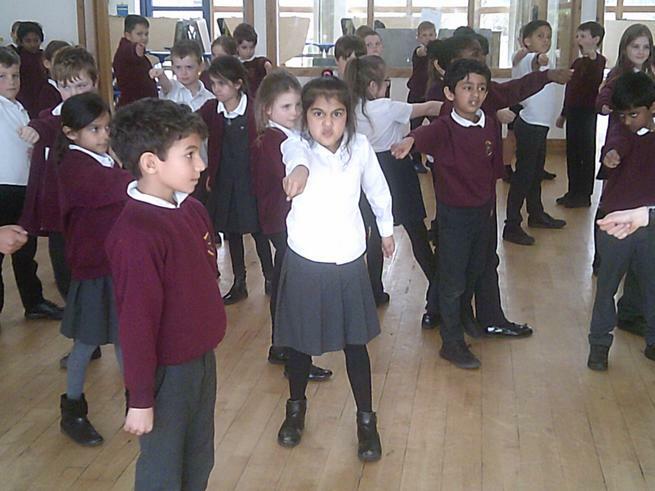 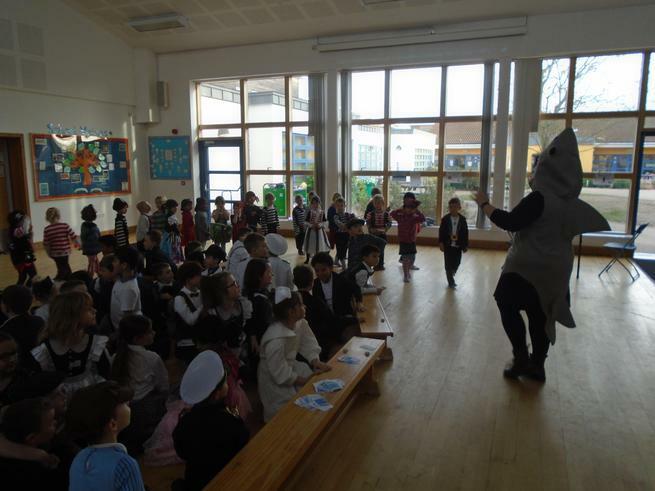 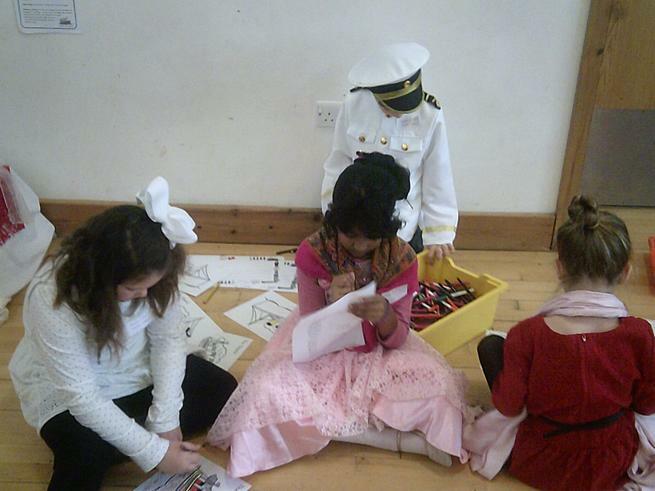 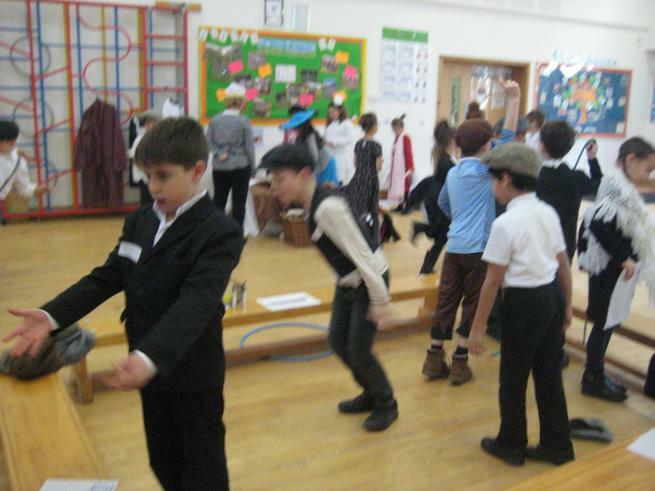 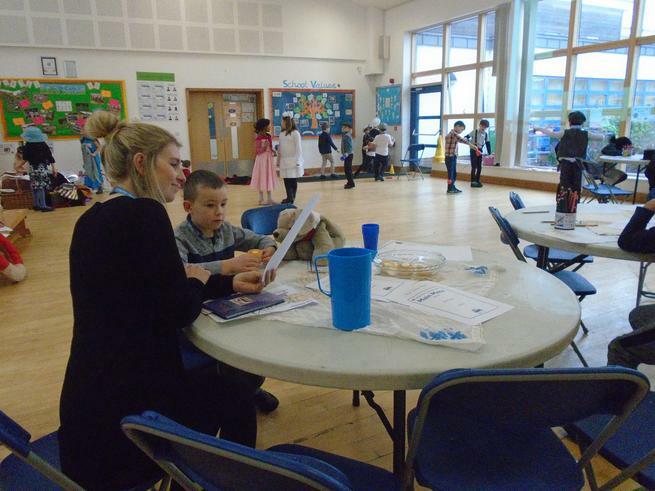 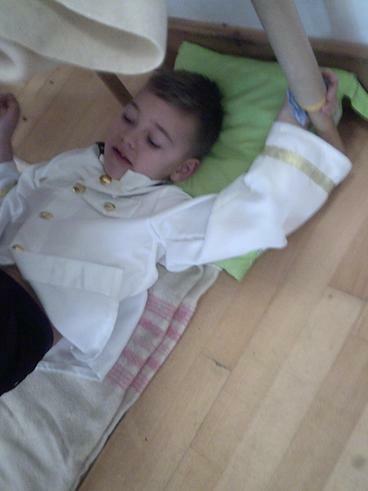 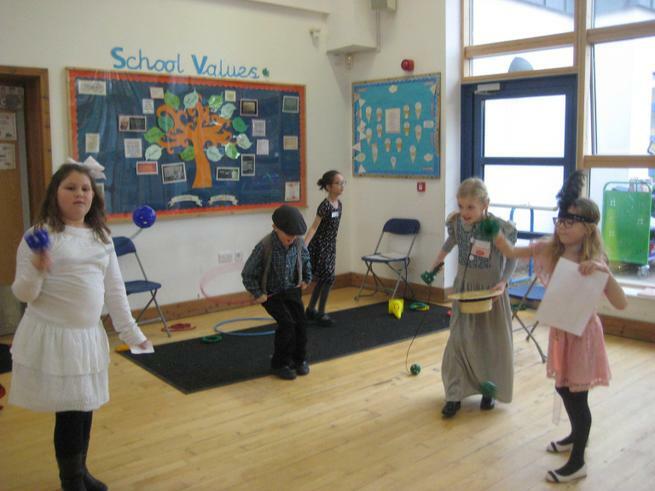 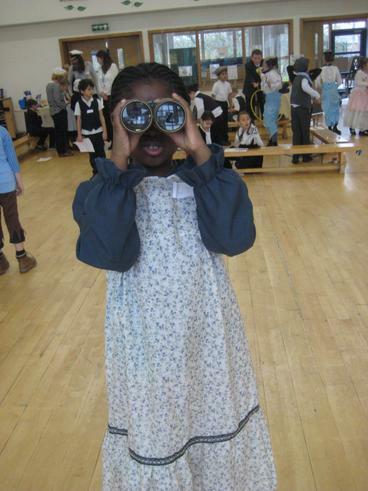 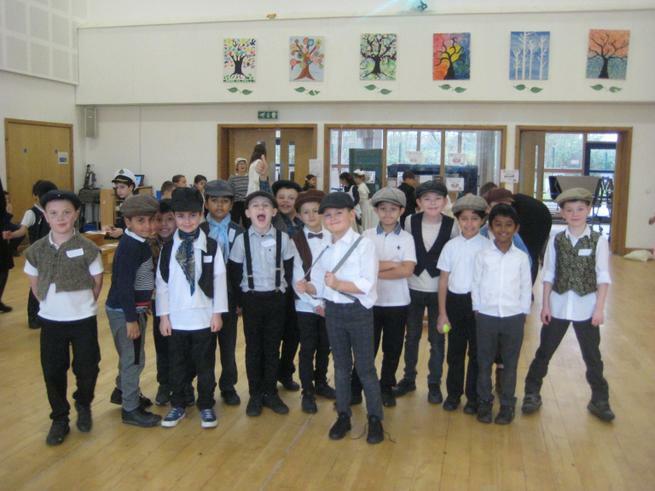 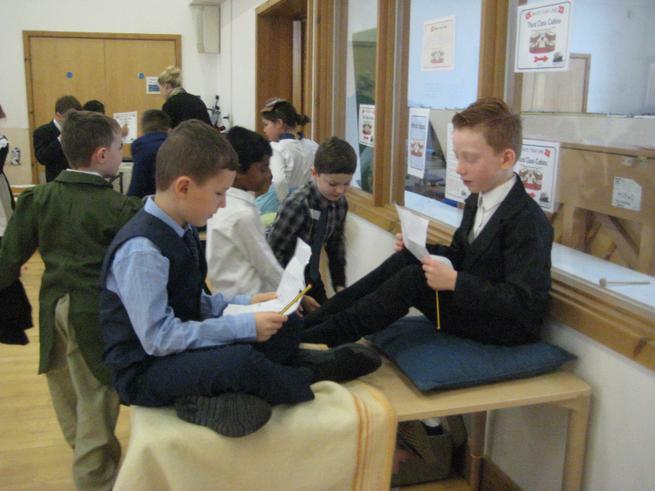 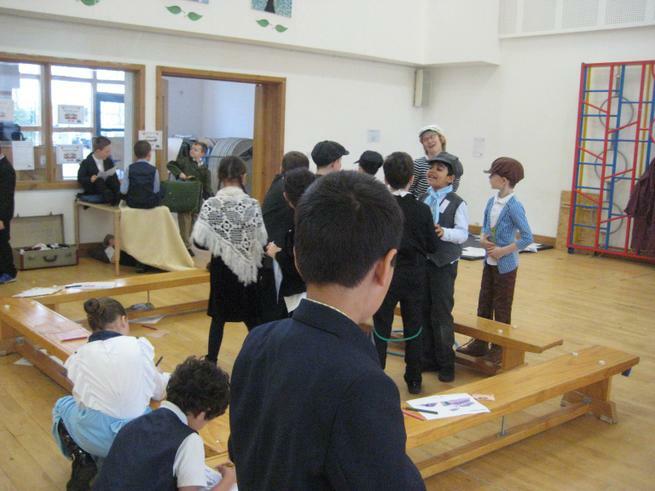 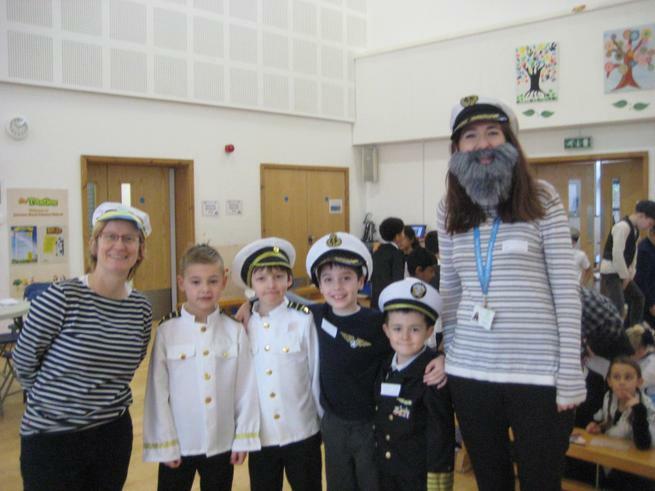 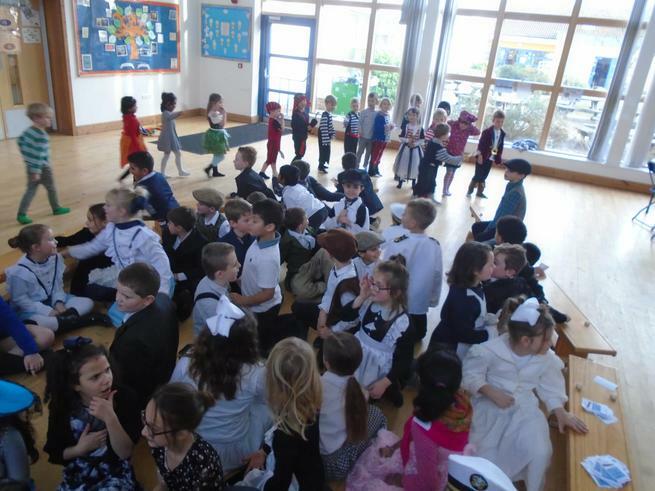 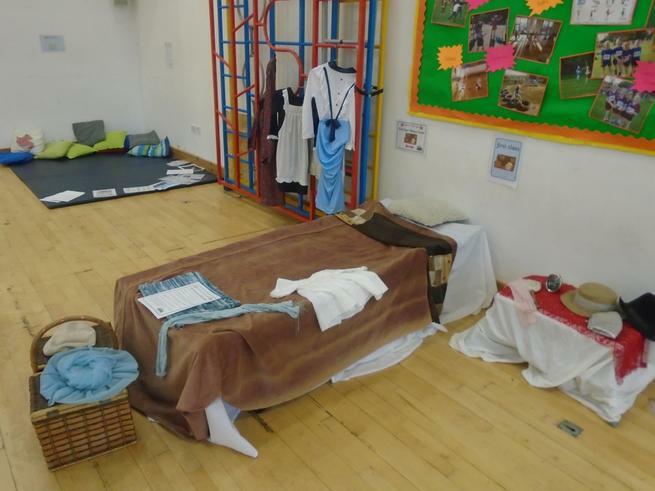 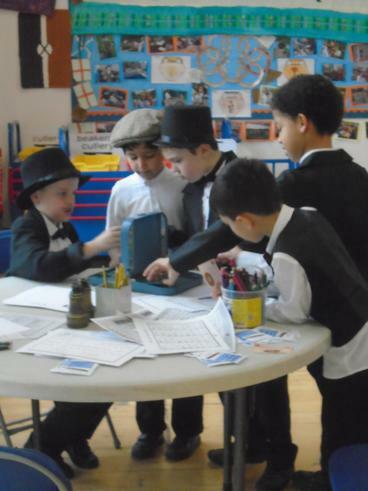 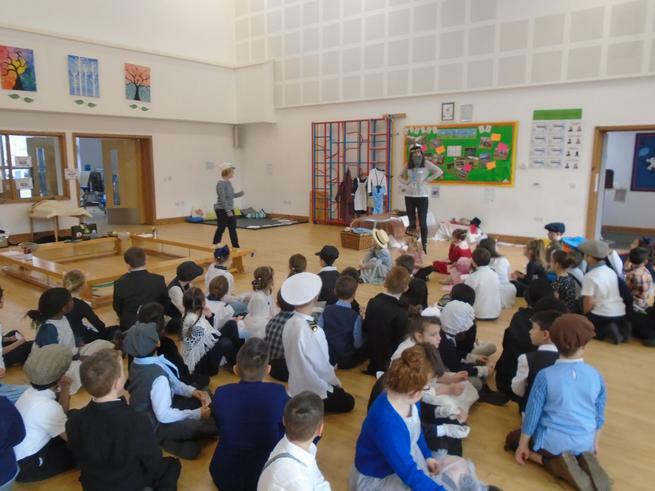 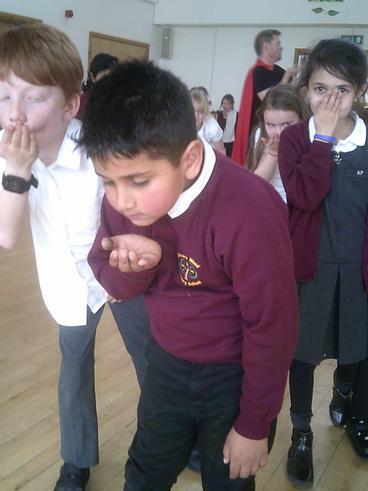 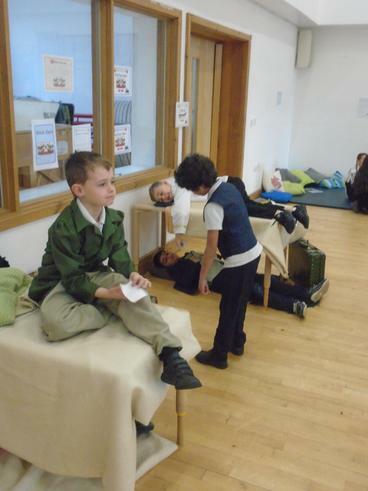 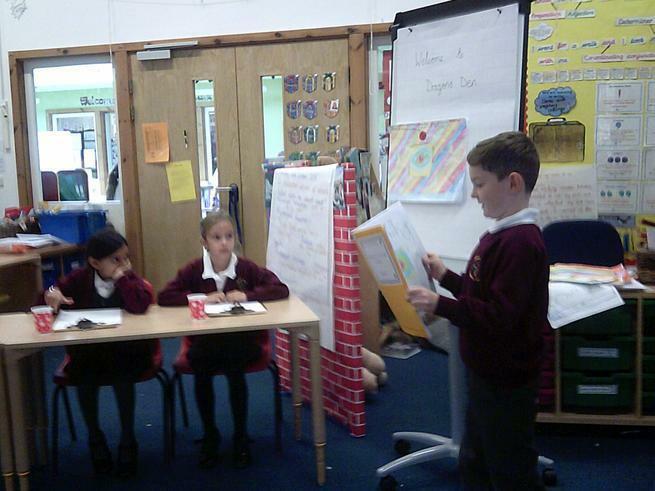 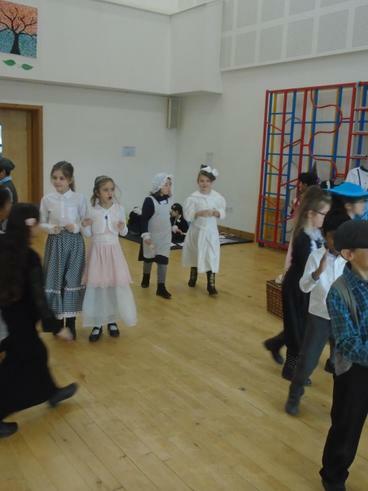 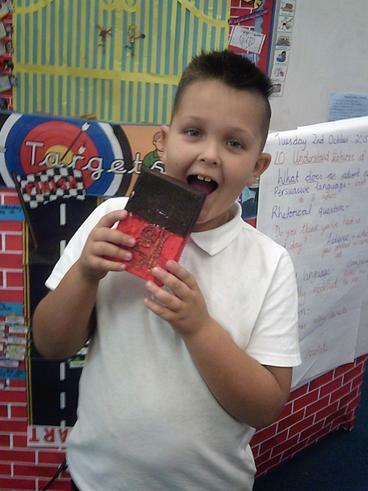 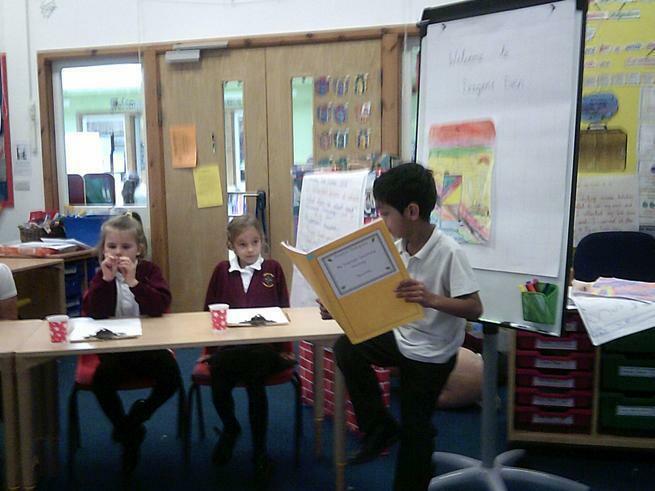 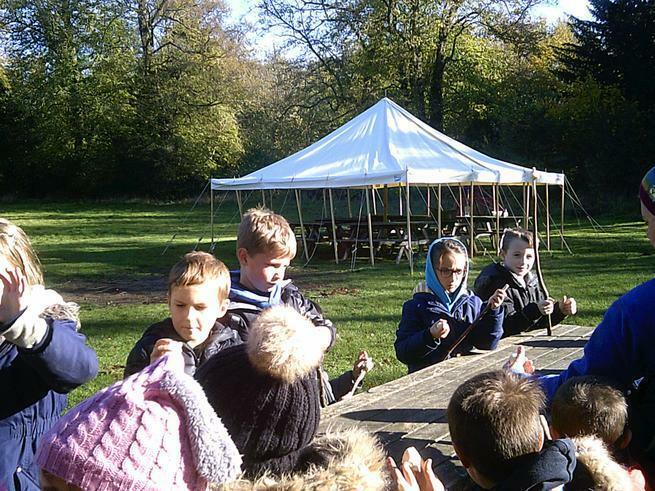 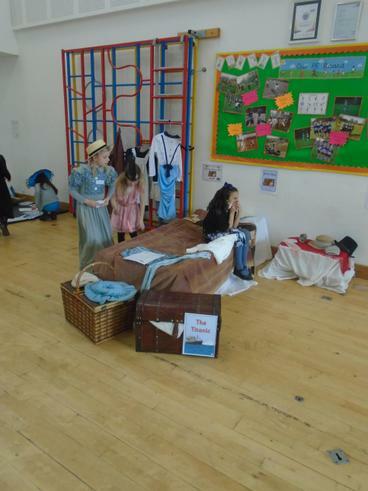 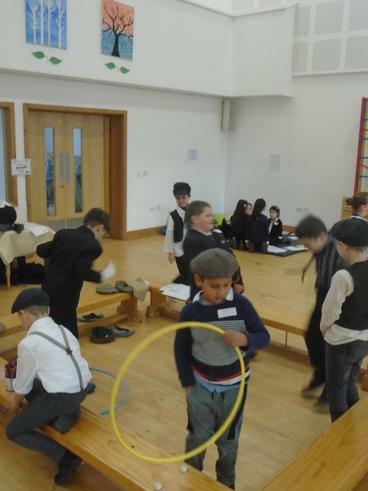 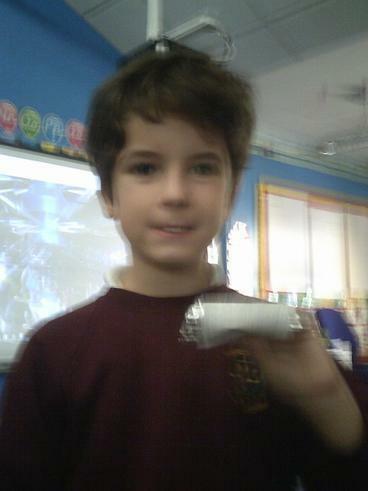 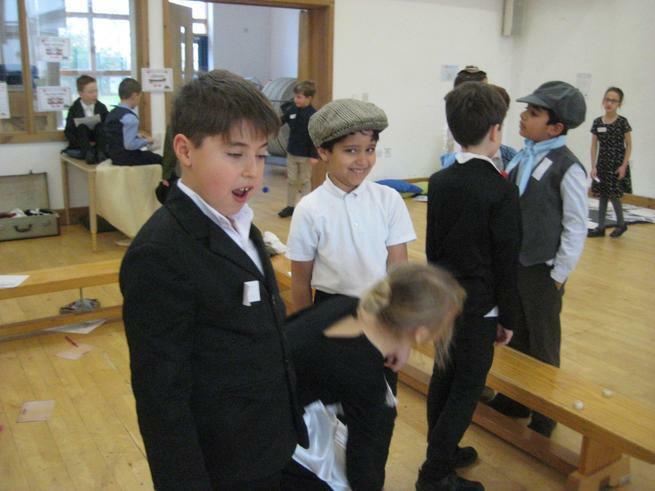 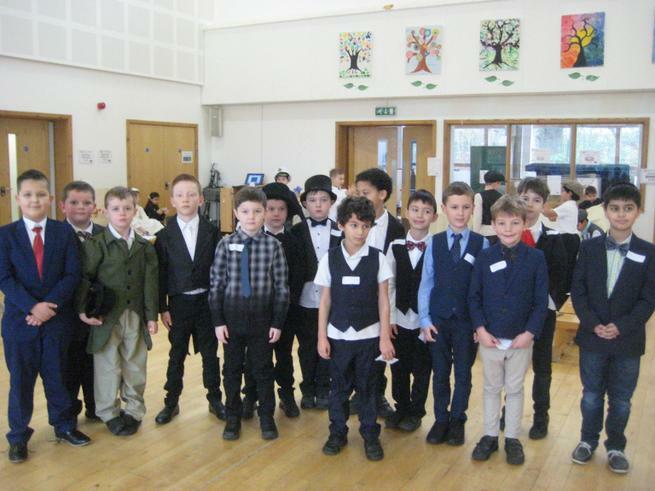 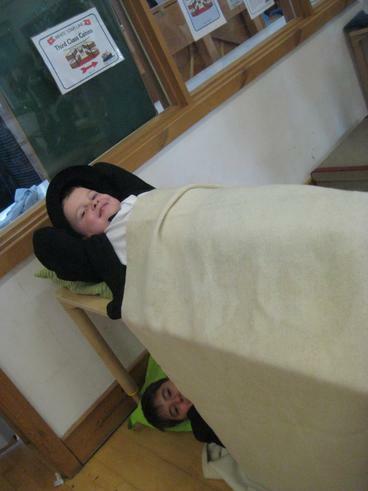 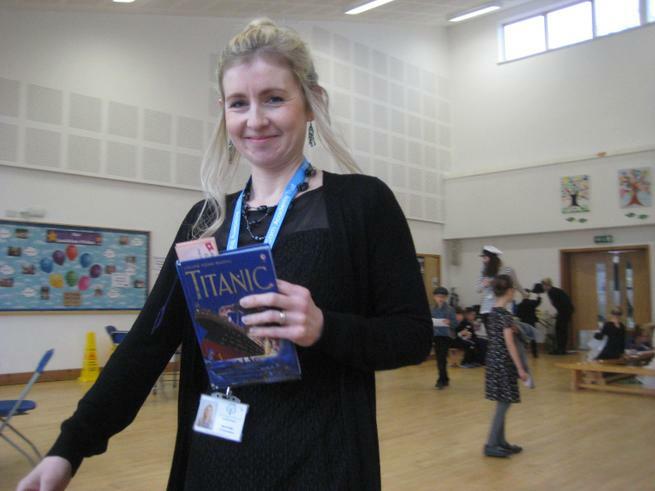 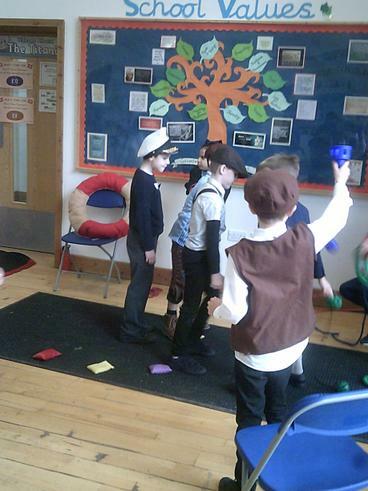 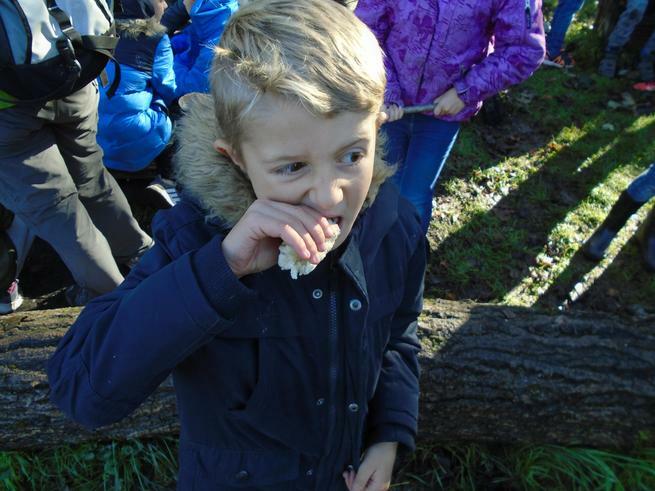 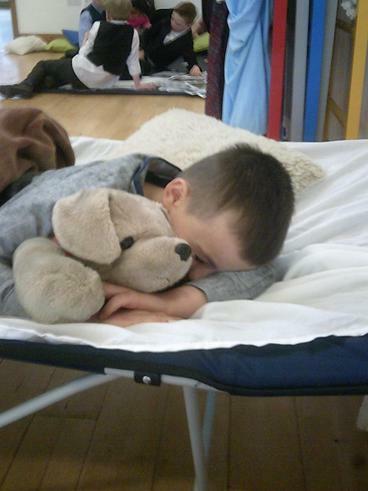 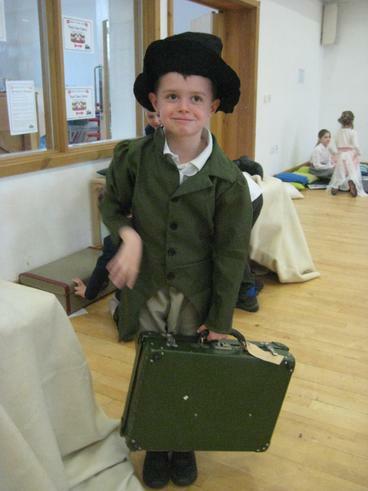 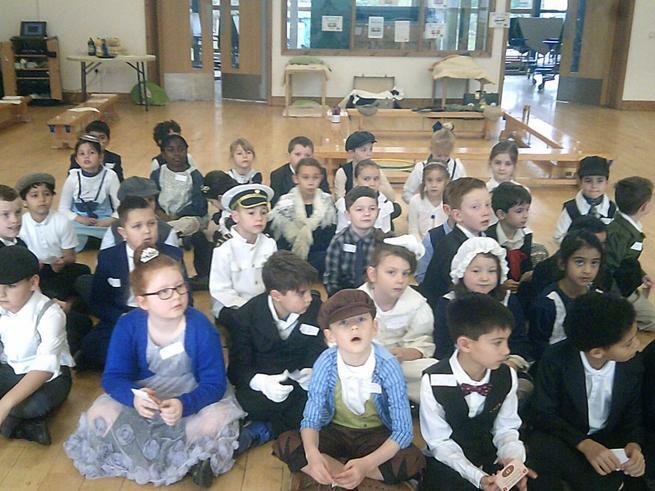 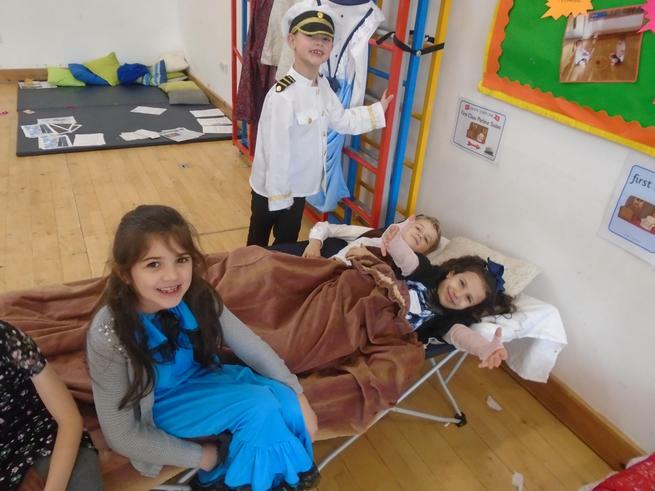 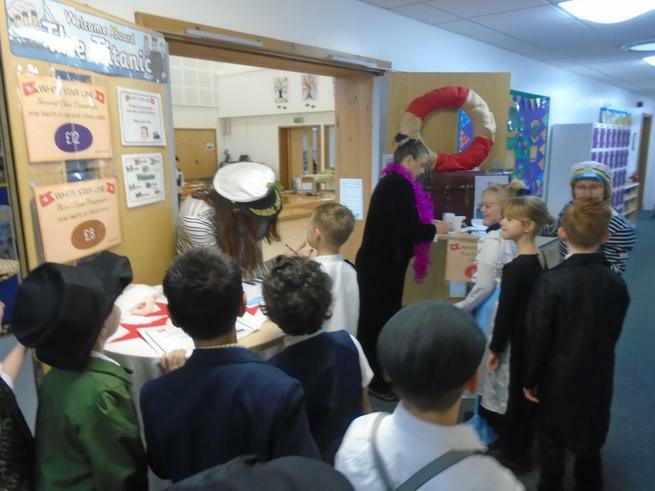 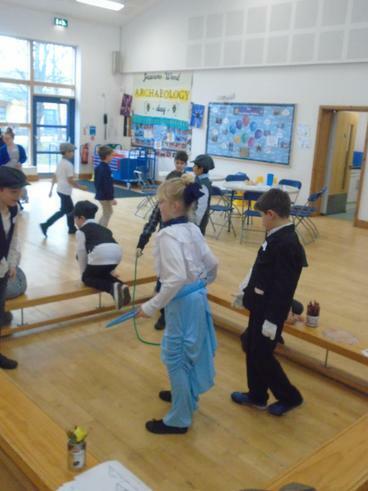 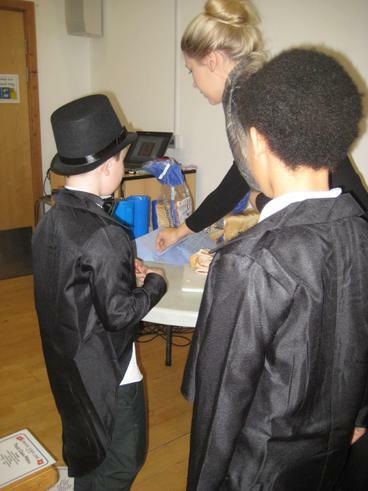 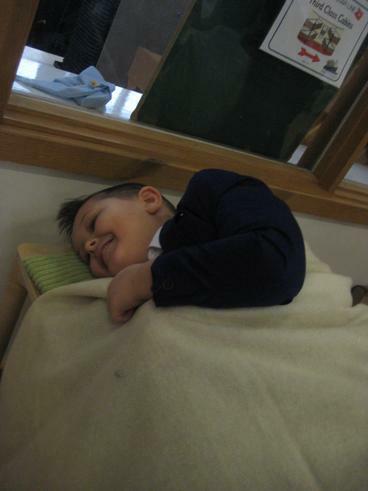 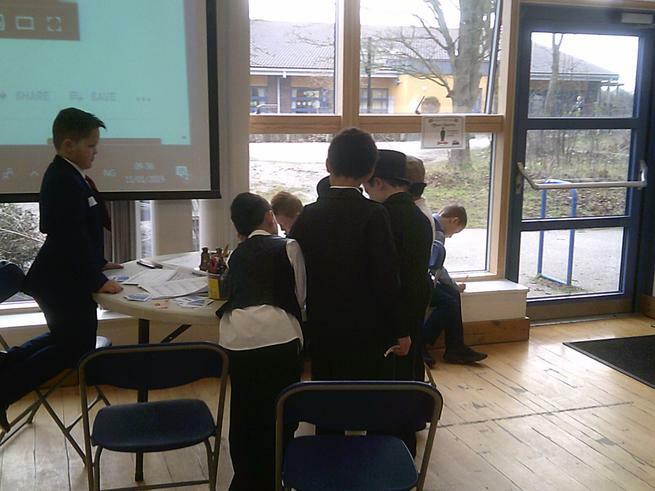 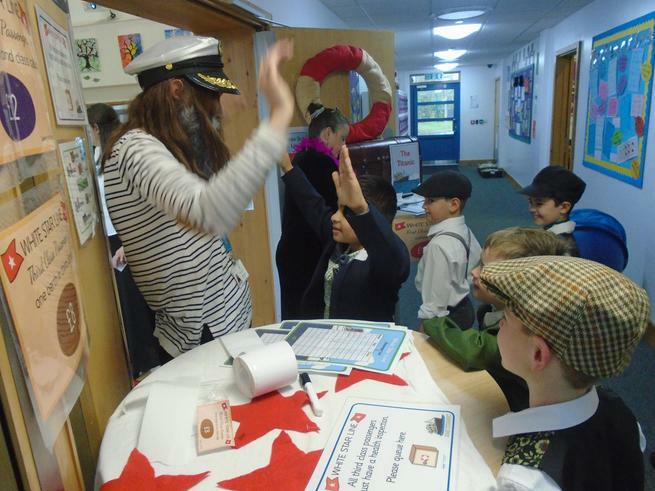 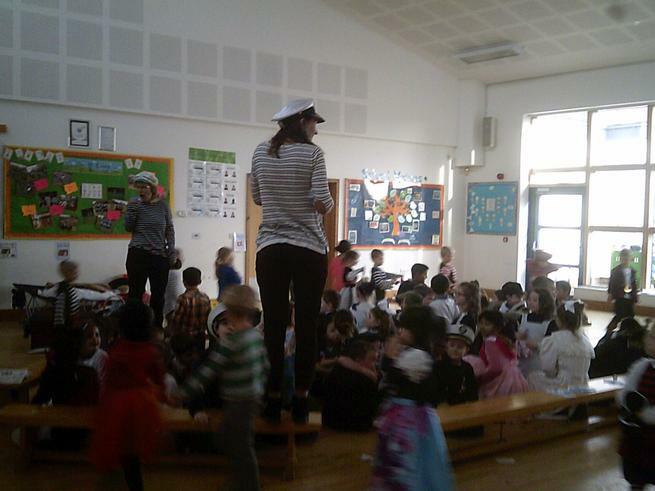 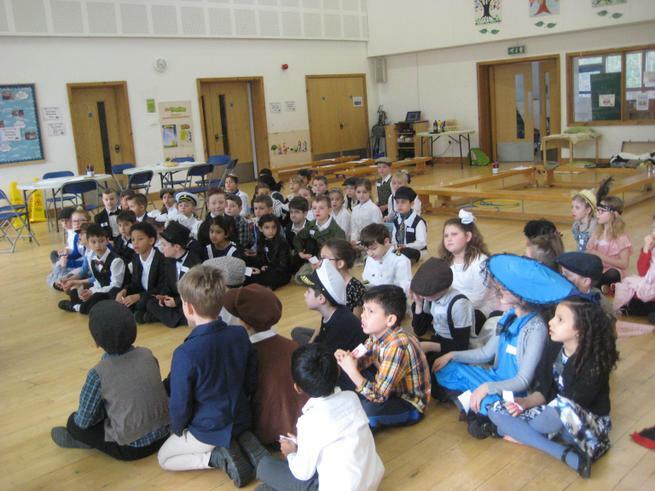 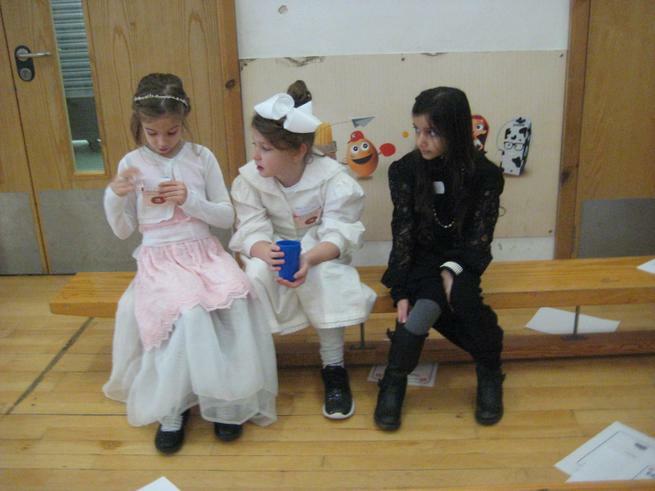 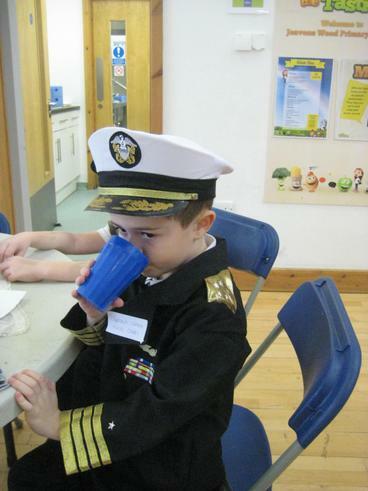 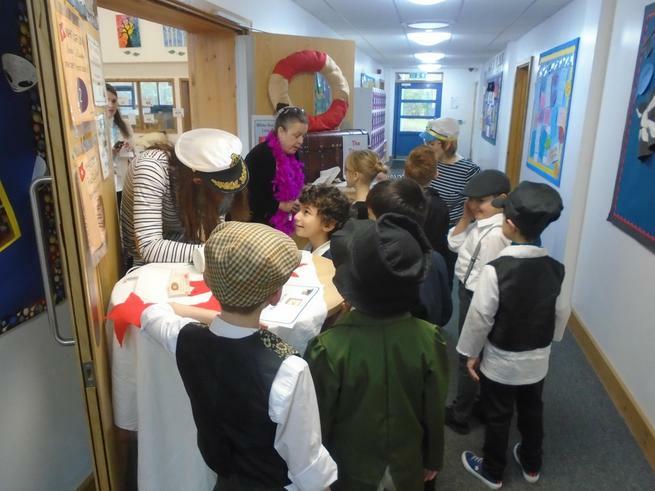 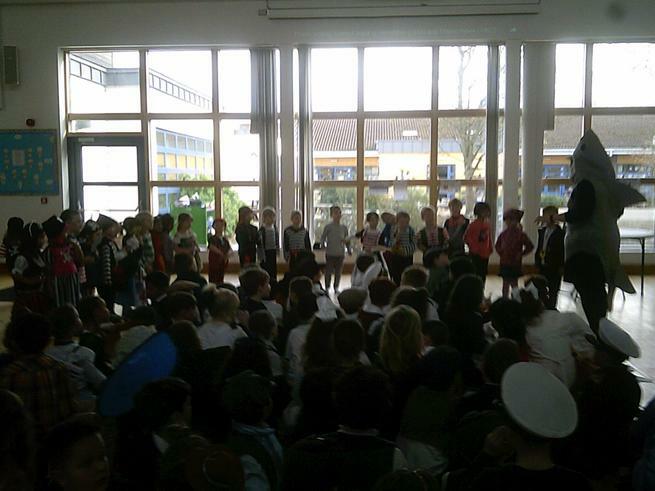 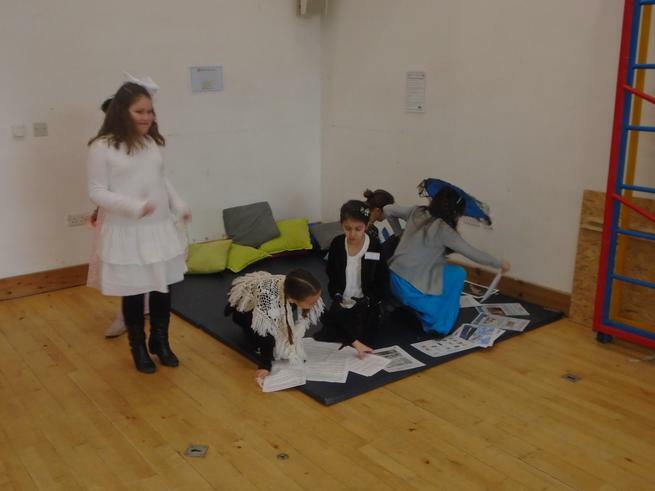 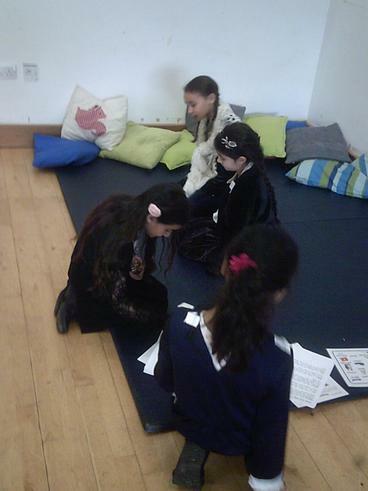 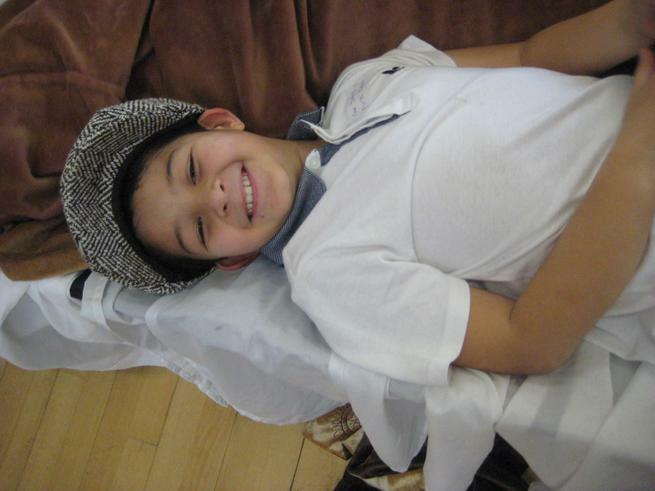 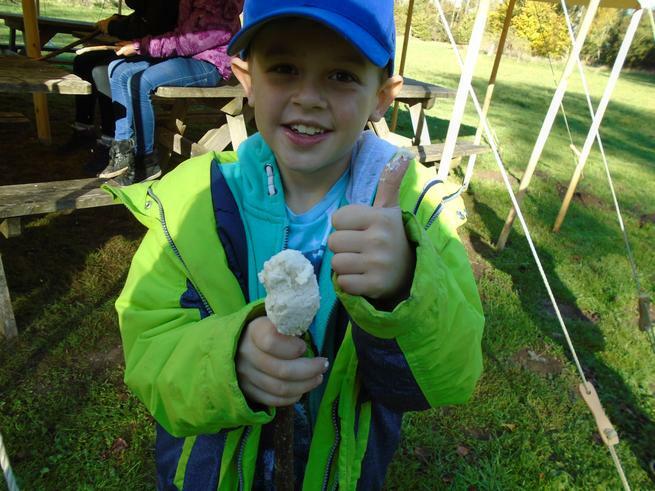 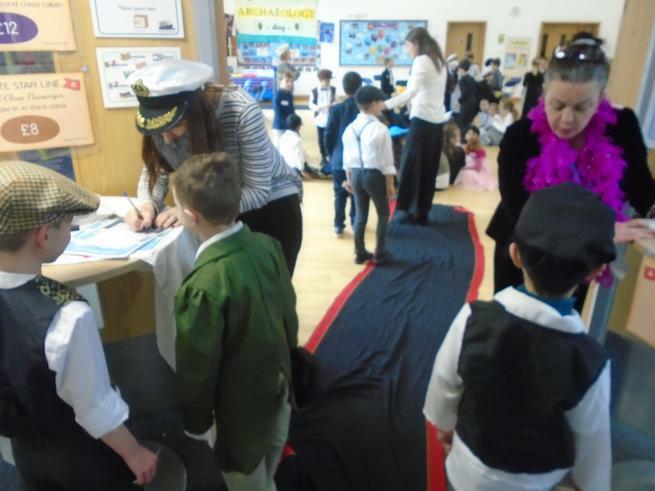 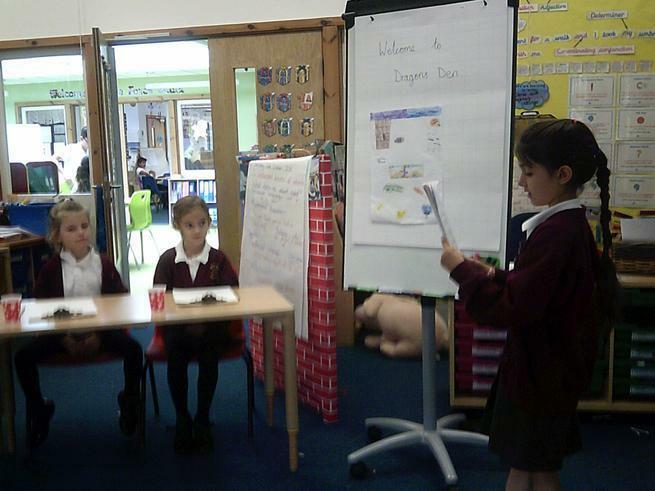 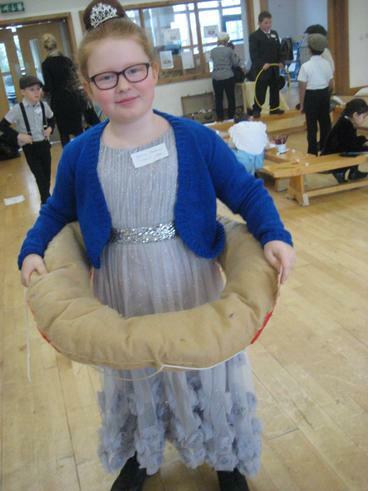 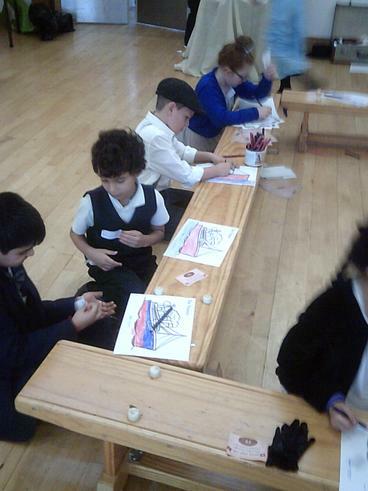 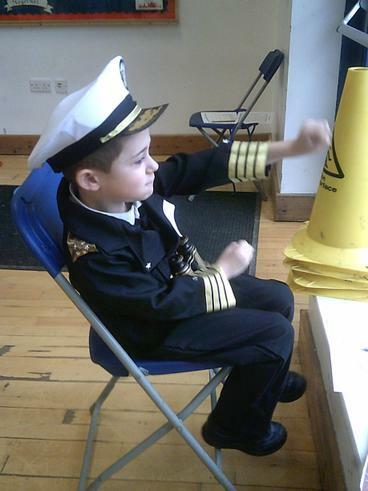 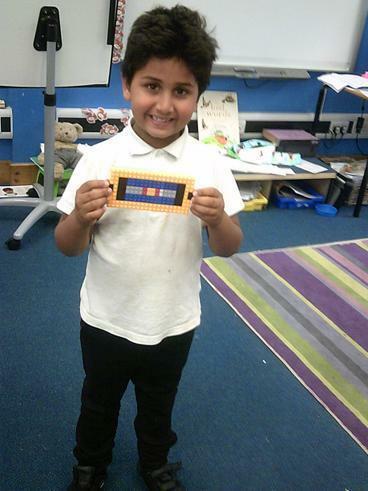 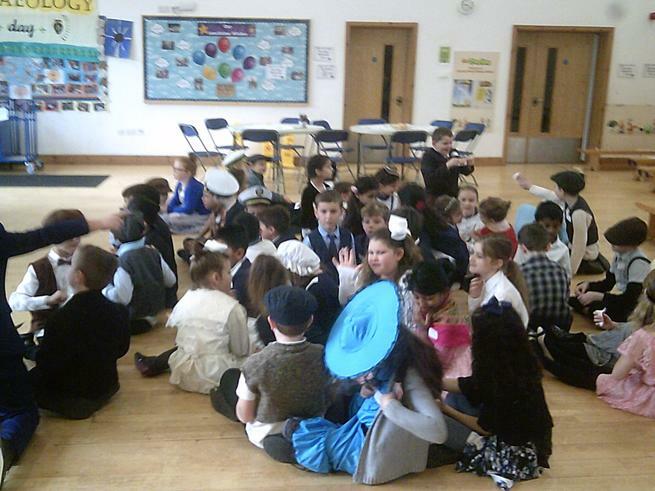 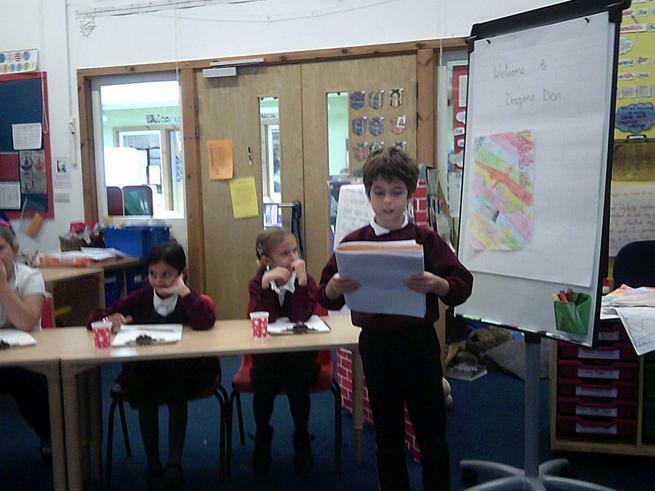 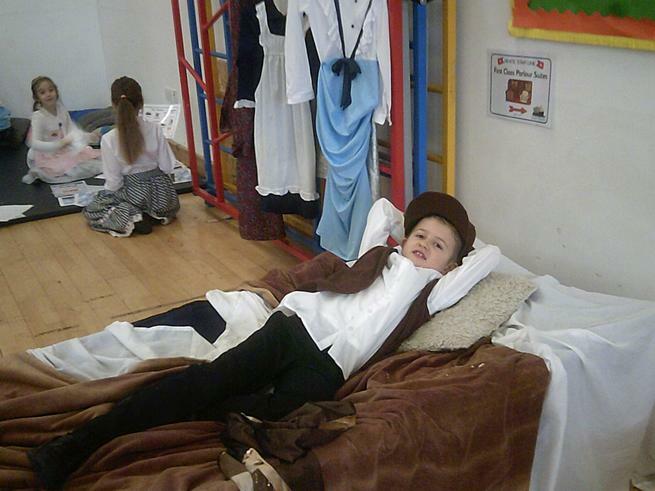 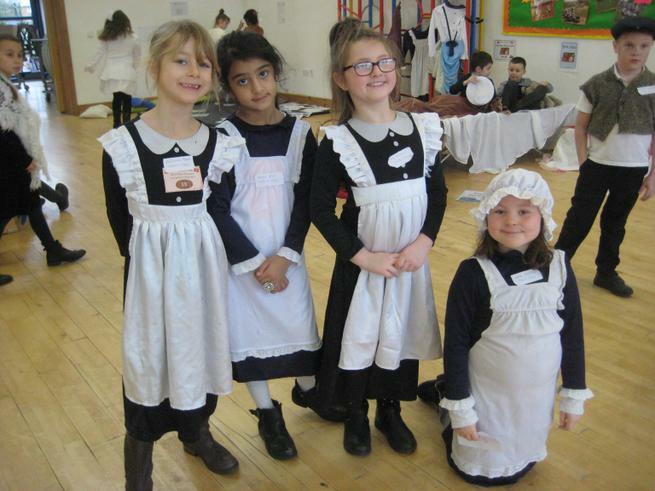 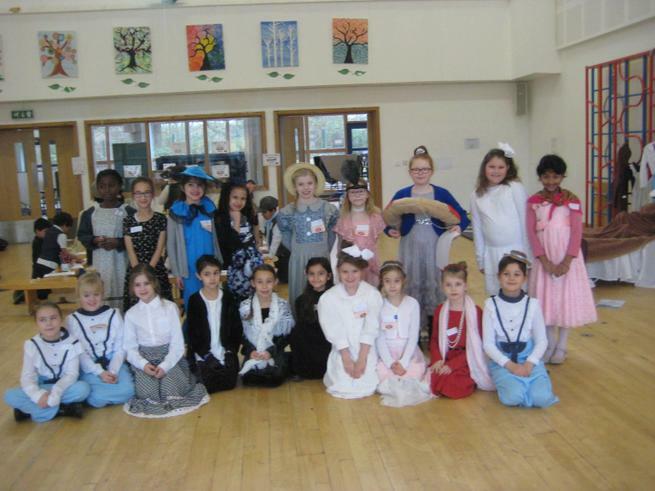 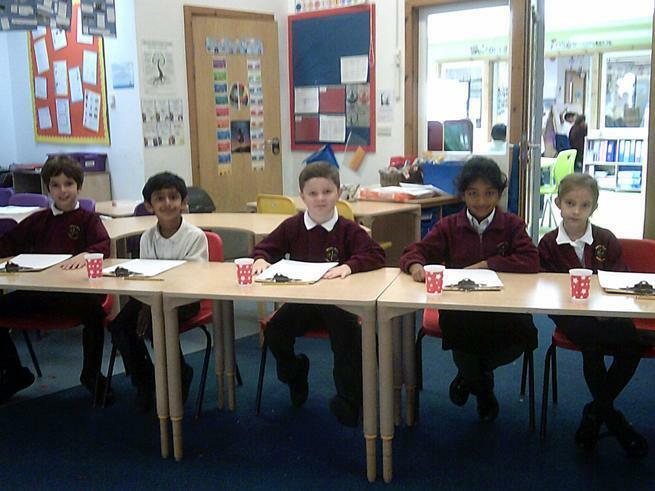 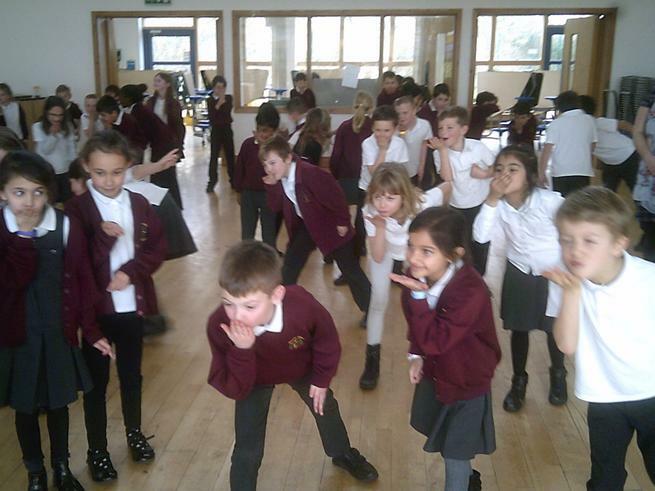 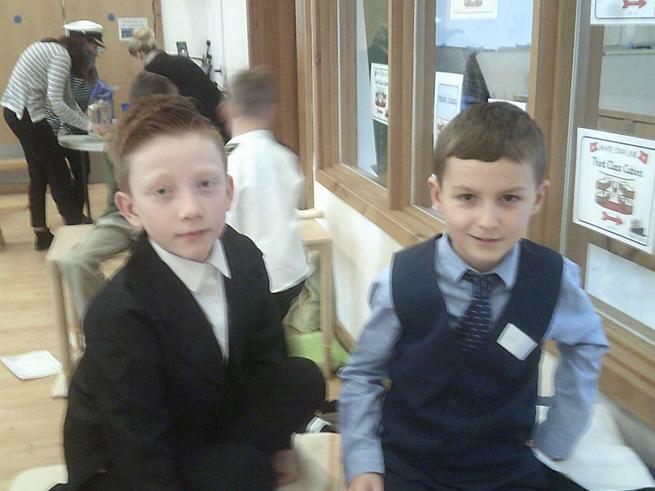 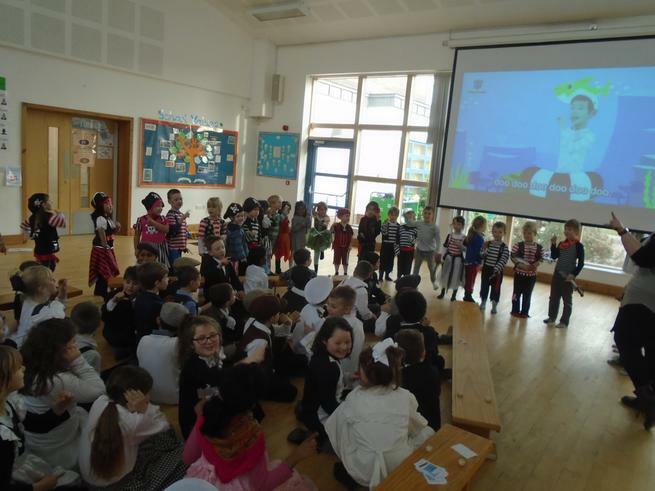 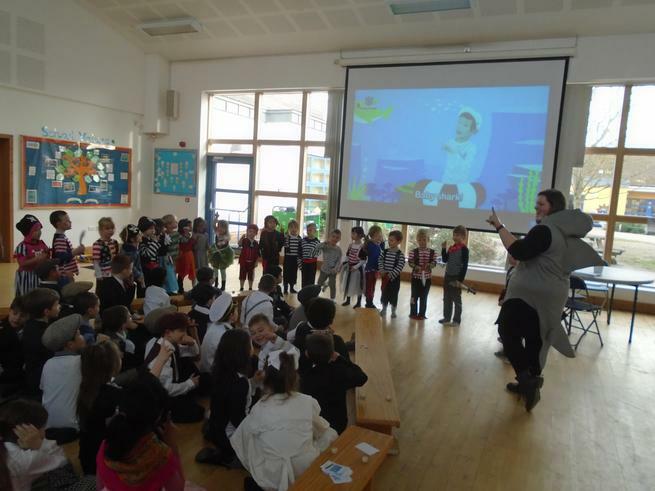 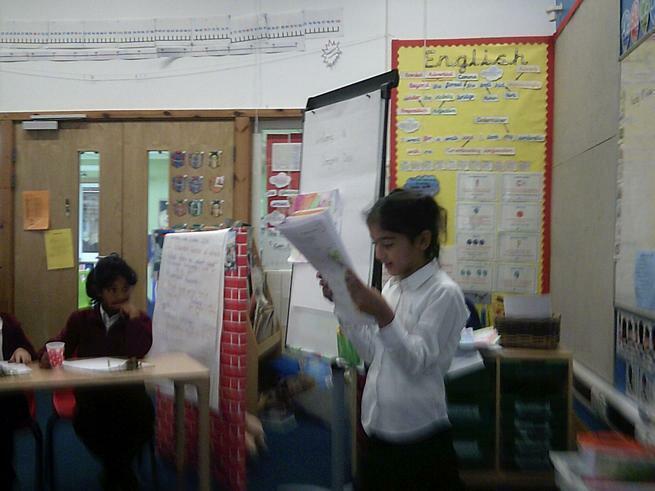 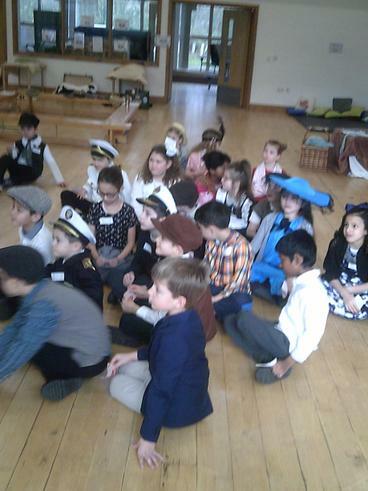 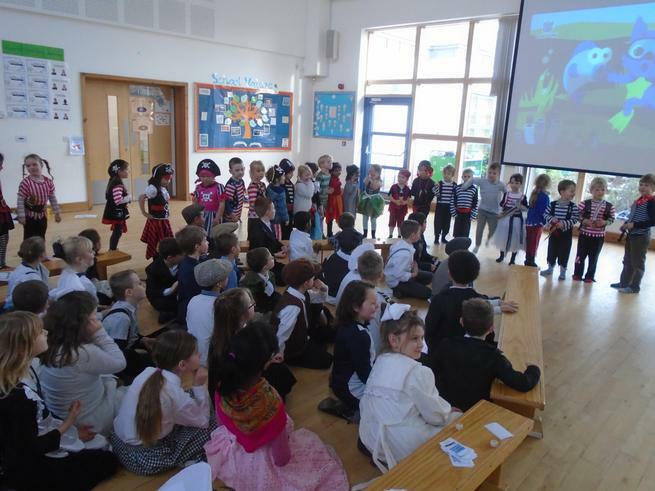 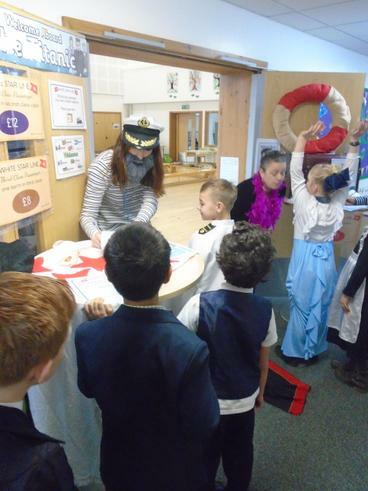 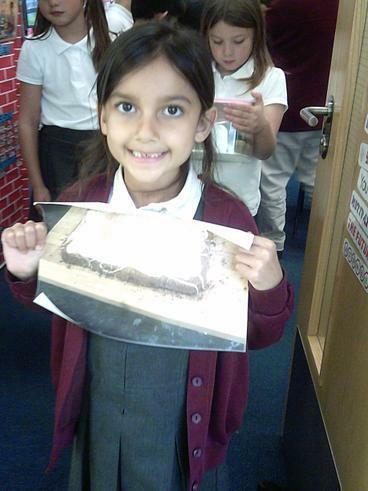 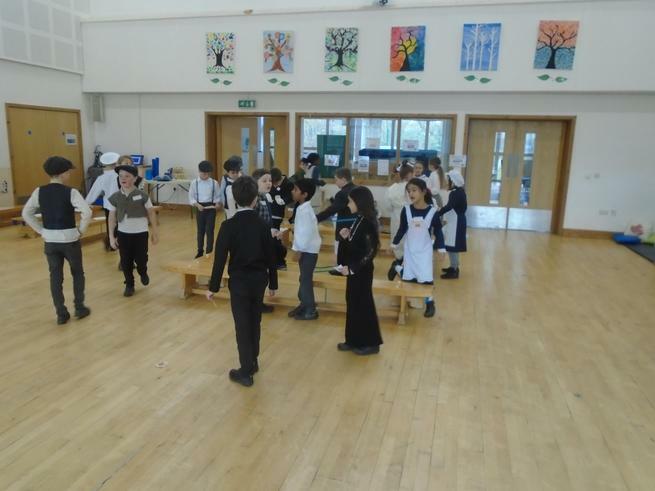 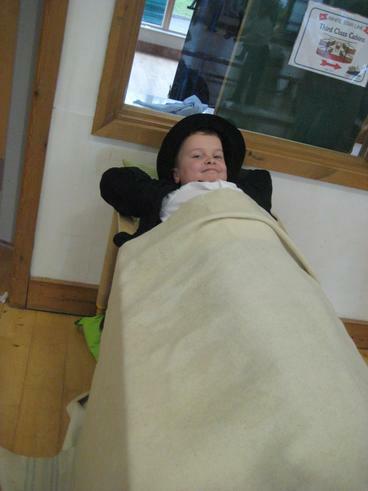 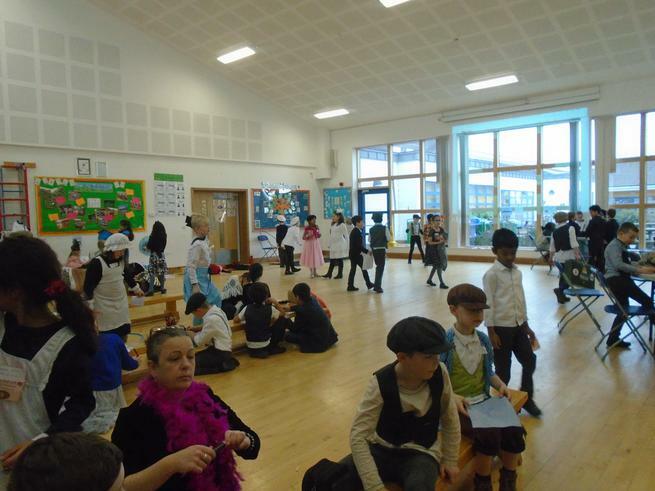 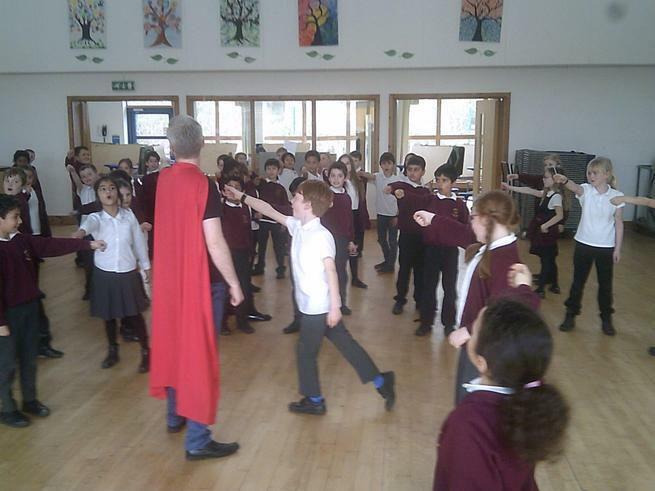 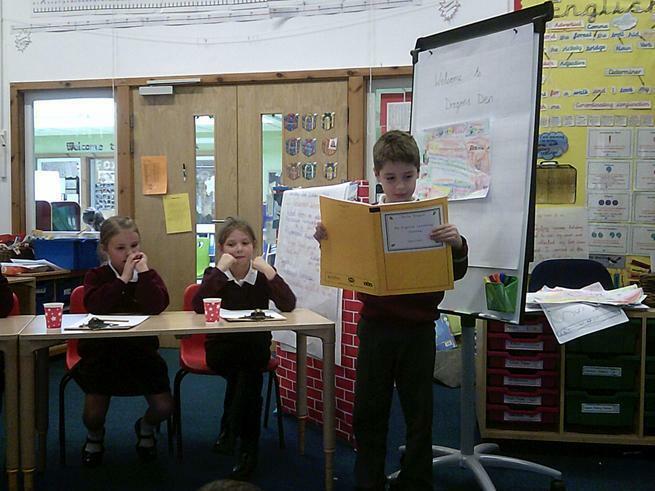 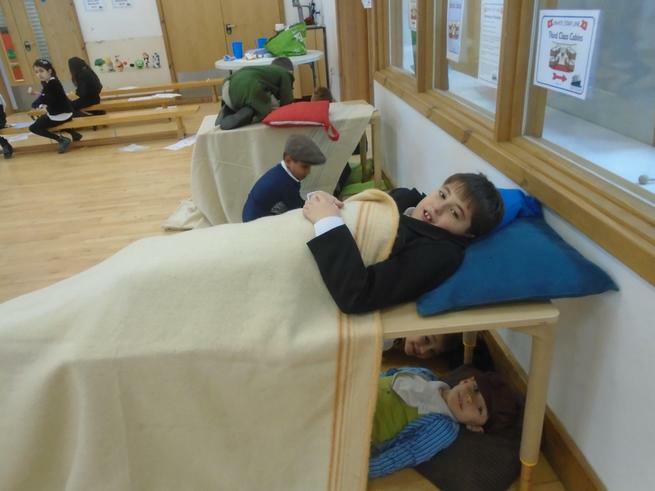 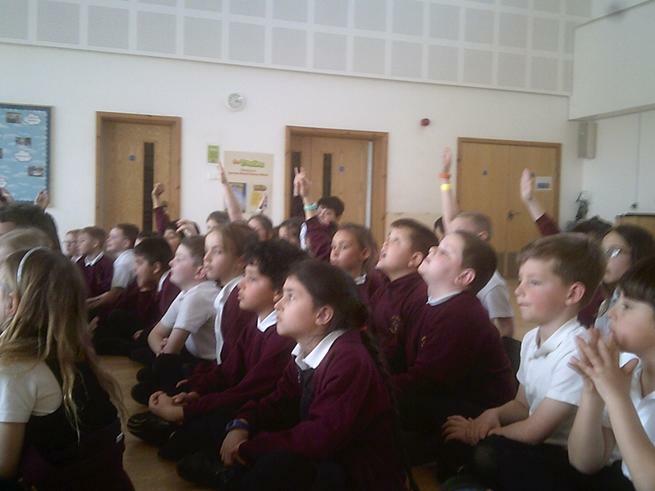 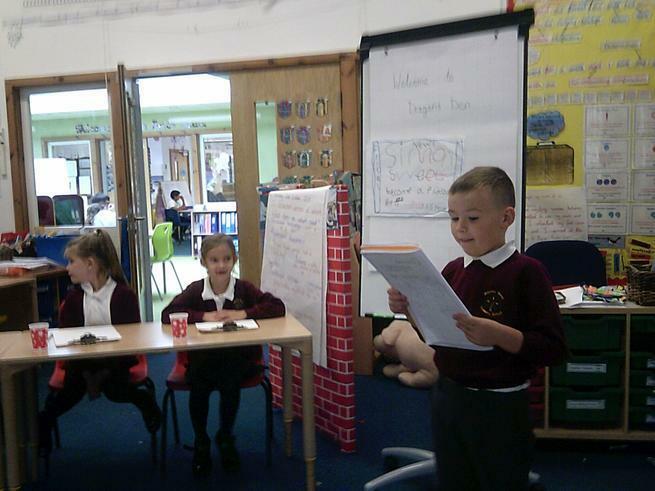 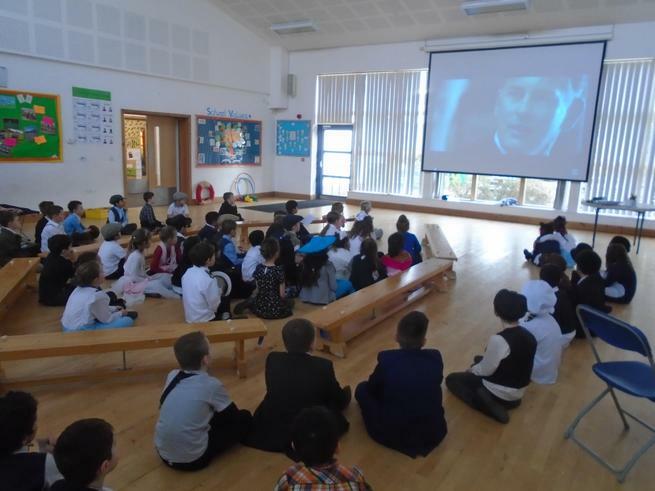 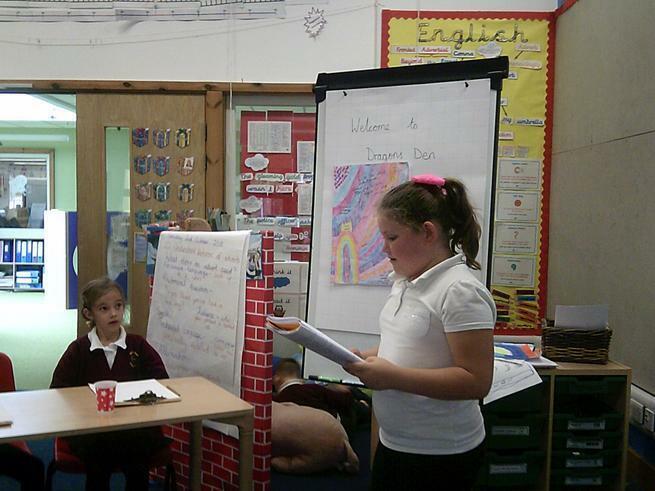 Year 3 had the most fantastic day for this term's WOW day all aboard the ill-fated Titanic. 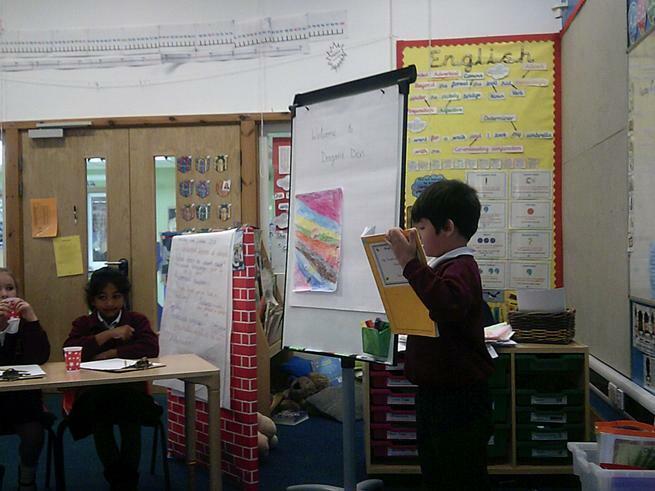 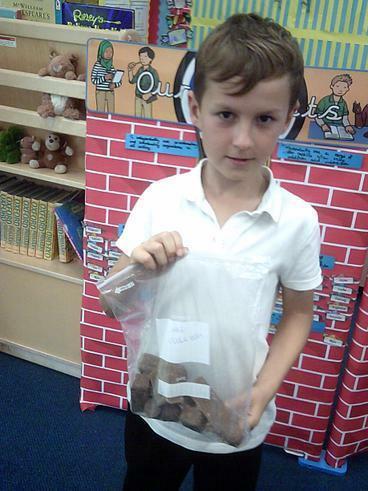 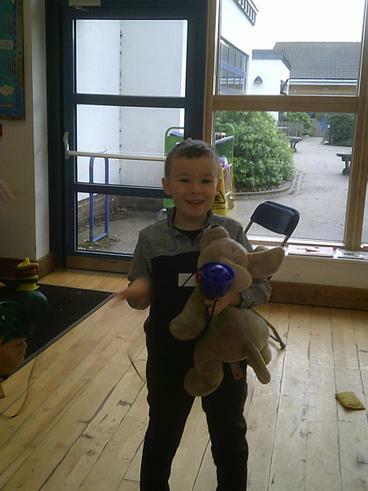 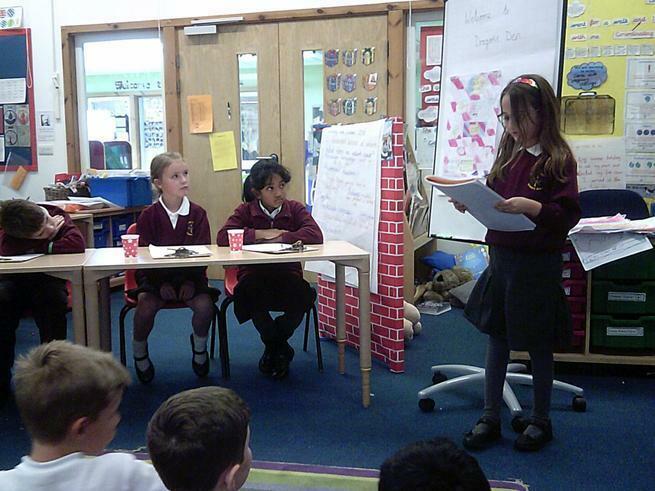 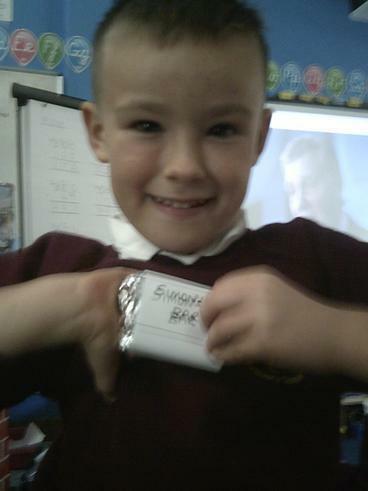 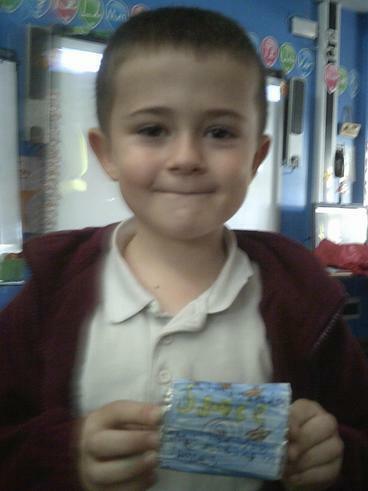 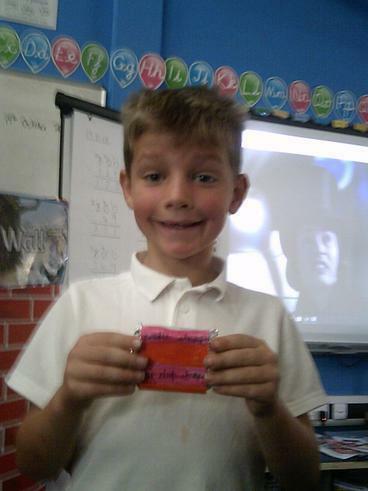 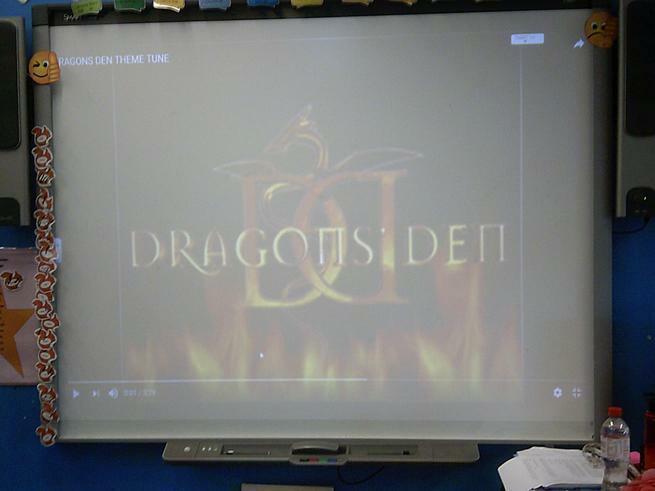 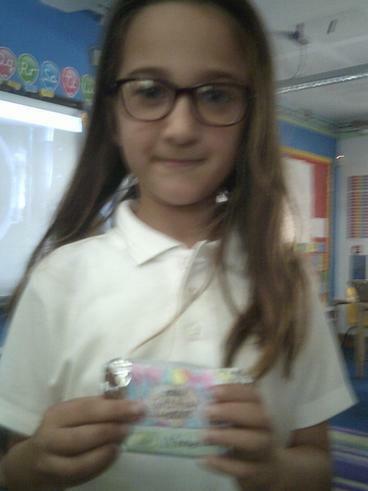 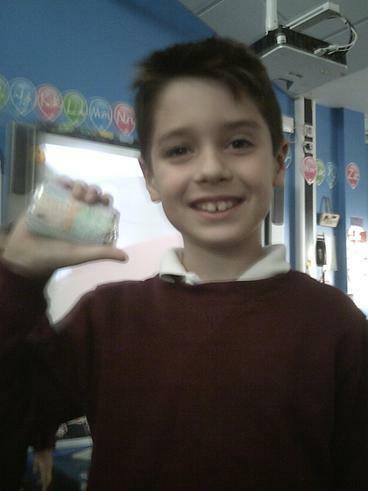 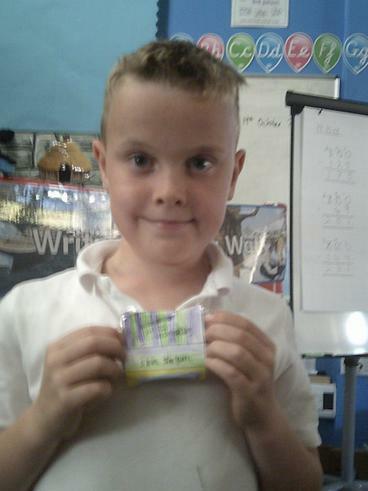 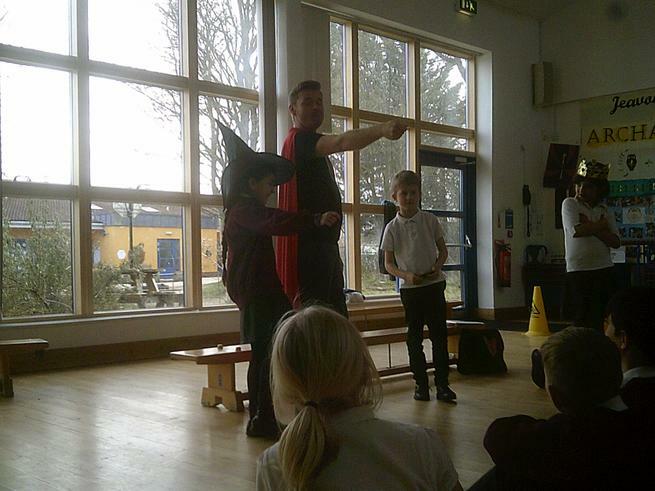 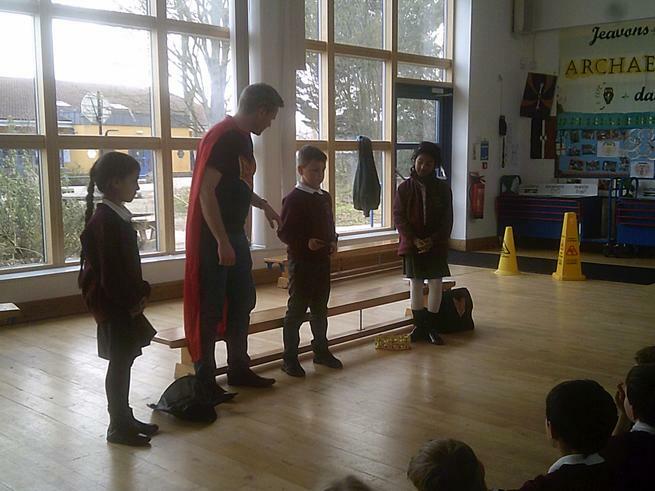 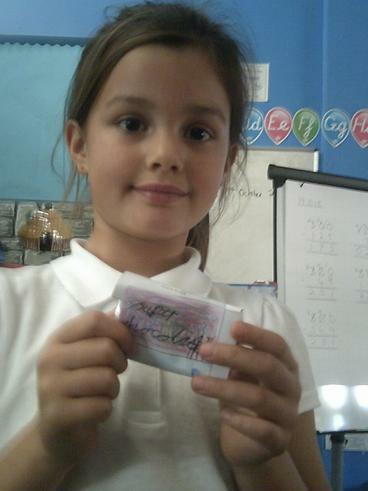 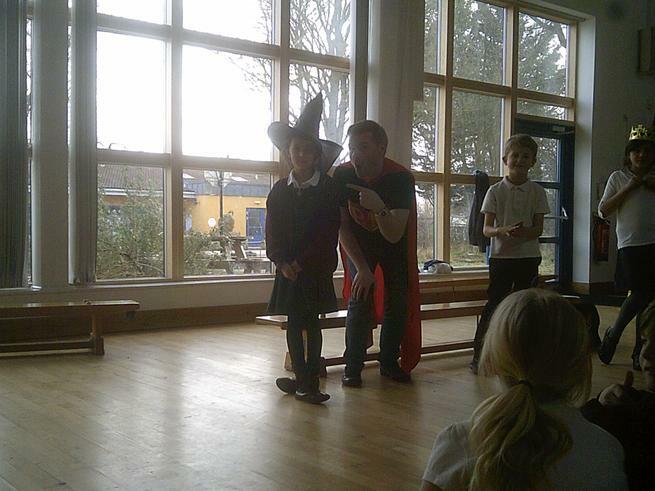 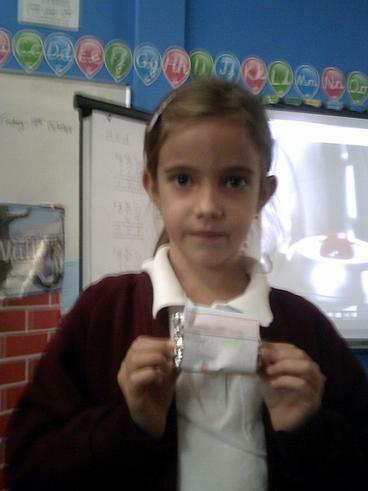 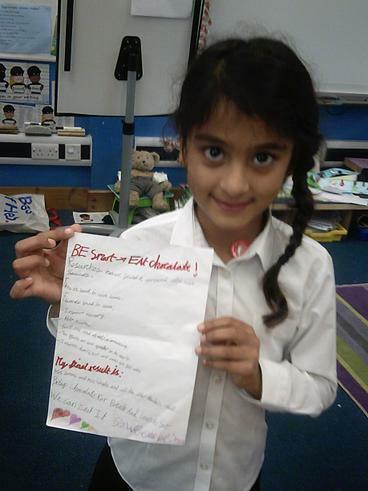 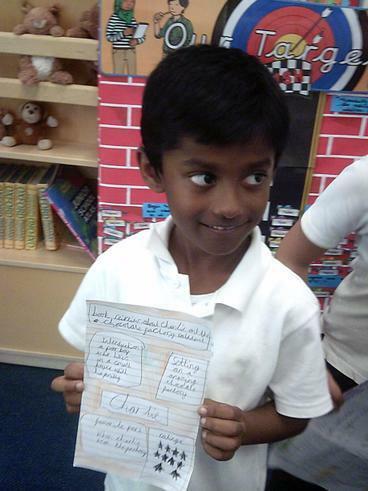 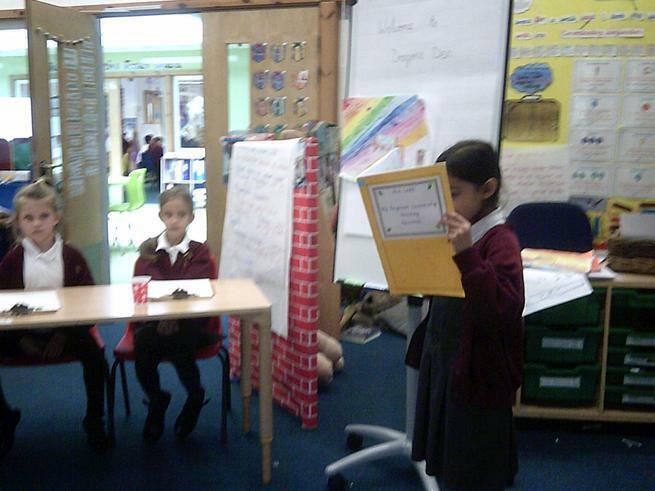 Children were given a 1st or 3rd class ticket and decided on a character name. 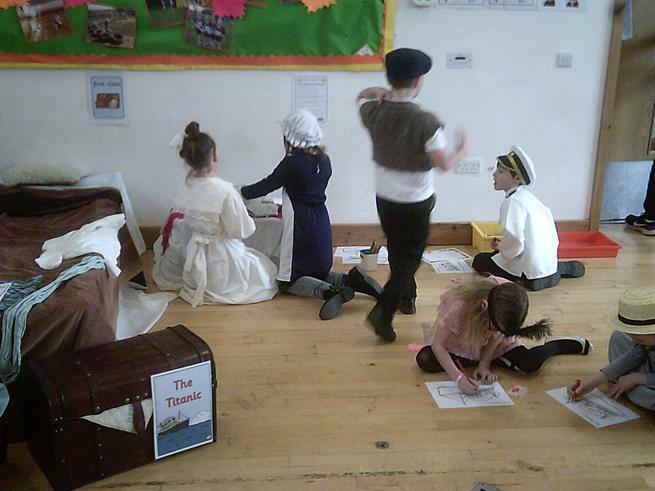 They then had the opportunity to explore the grand ship itself taking part in many different activities. 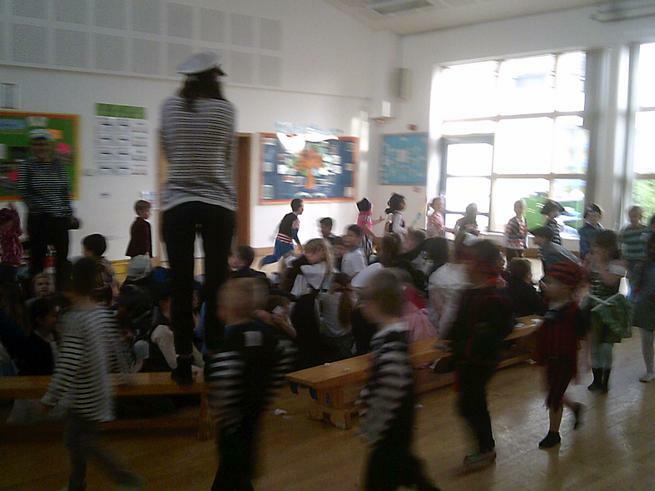 We did have some unexpected guests during the afternoon when Dragonflies (who were having their pirate day) briefly invaded the ship before singing us Baby Shark. 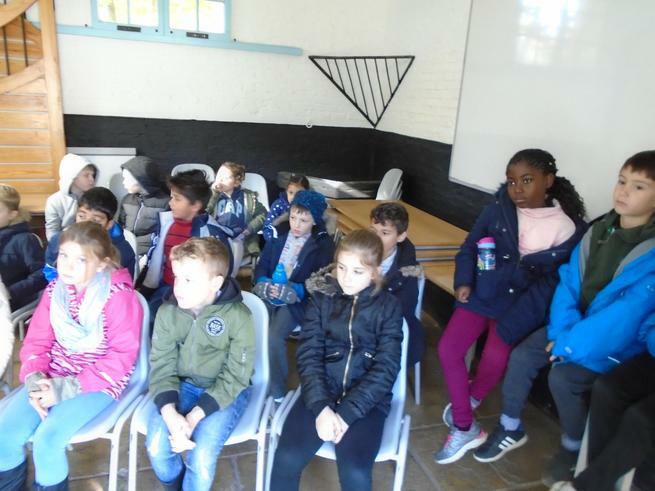 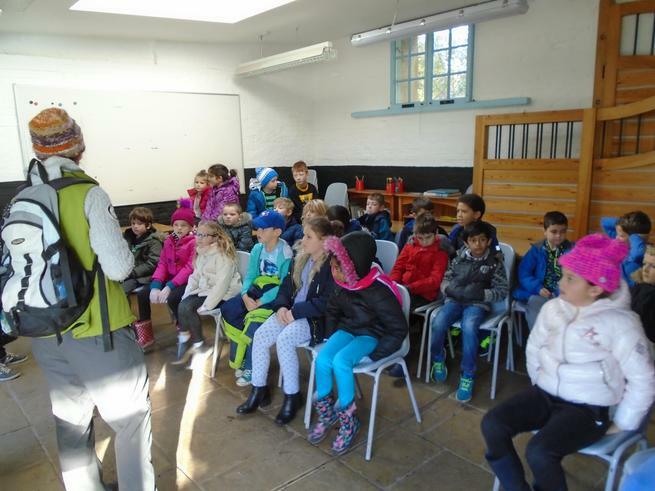 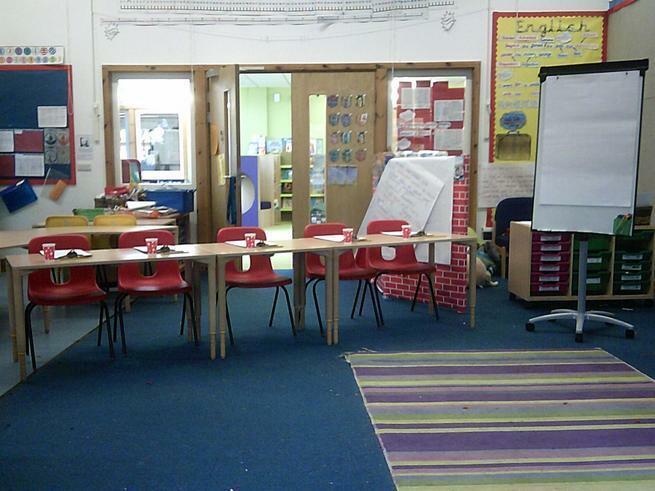 The children were extremely sensible and sensitive during the final part of the day where we discussed what happened to those passengers who did not survive. 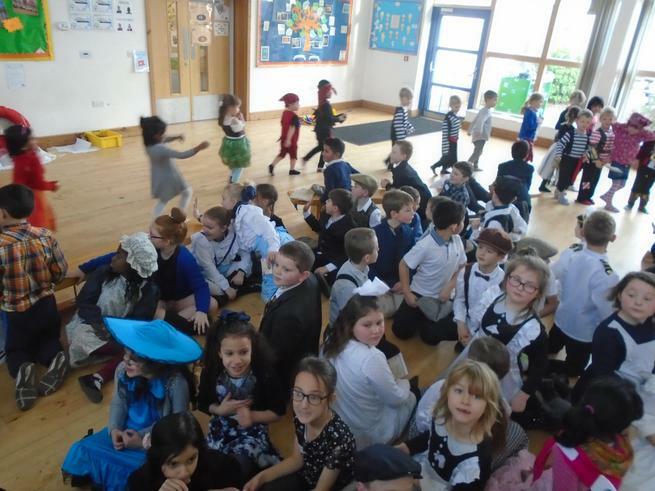 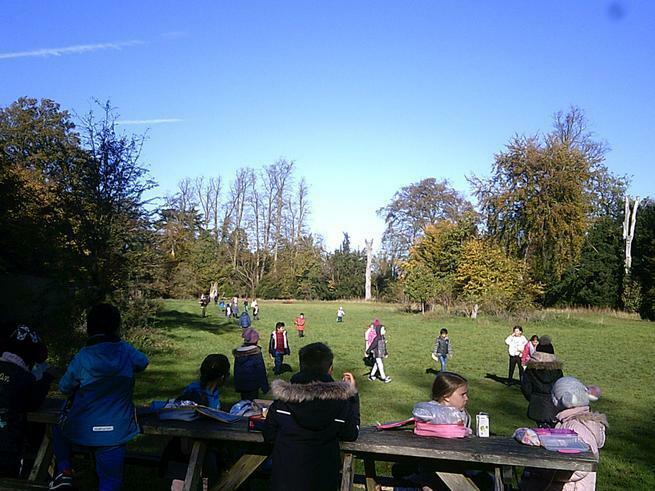 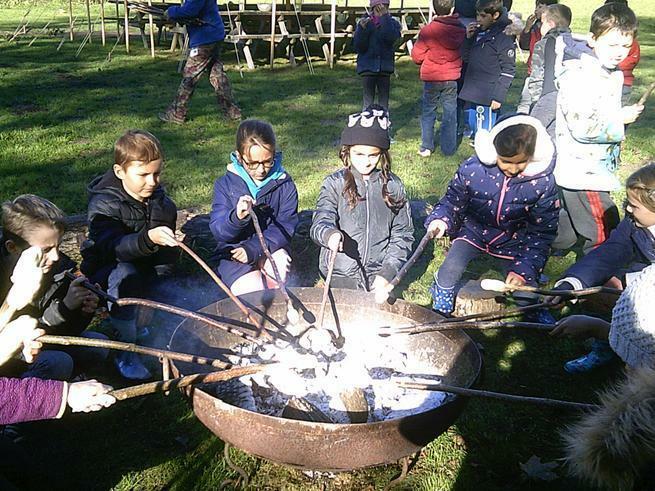 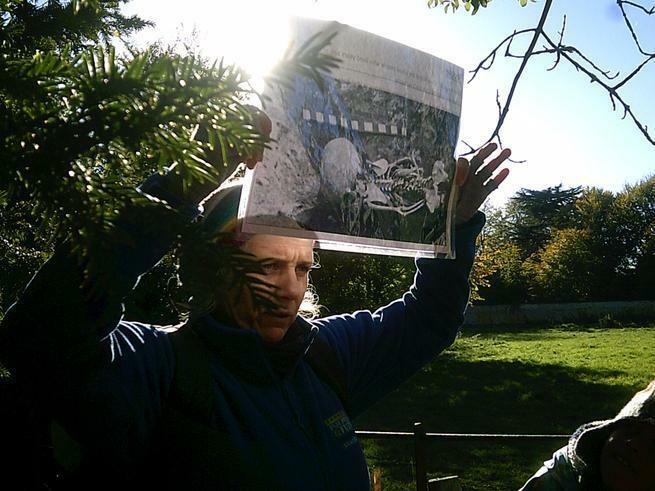 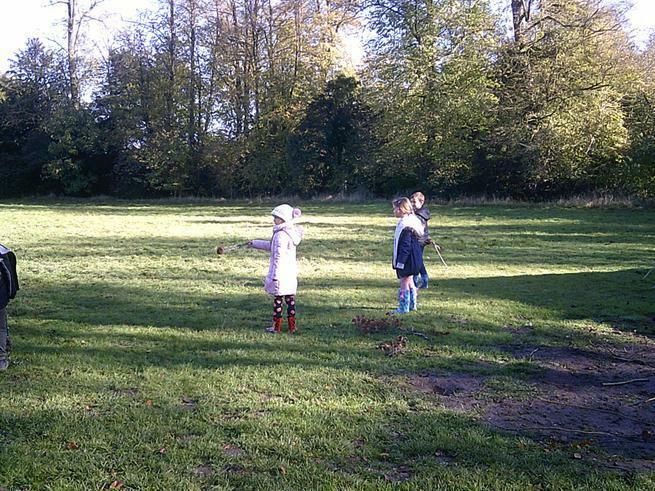 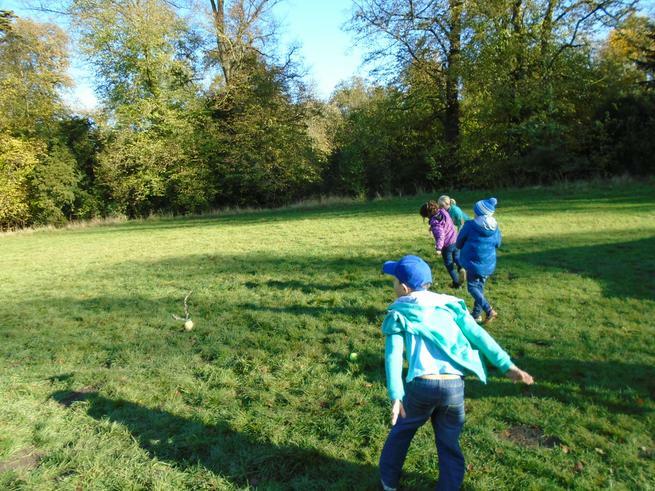 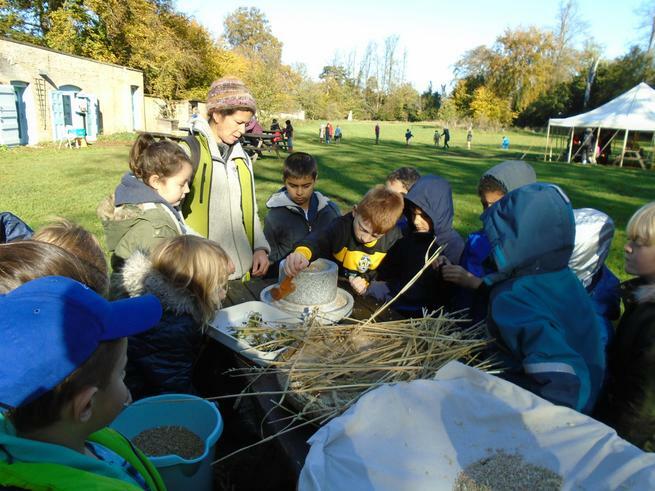 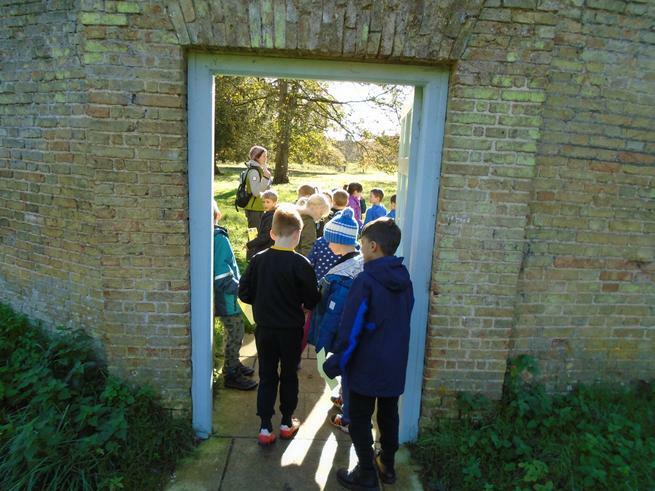 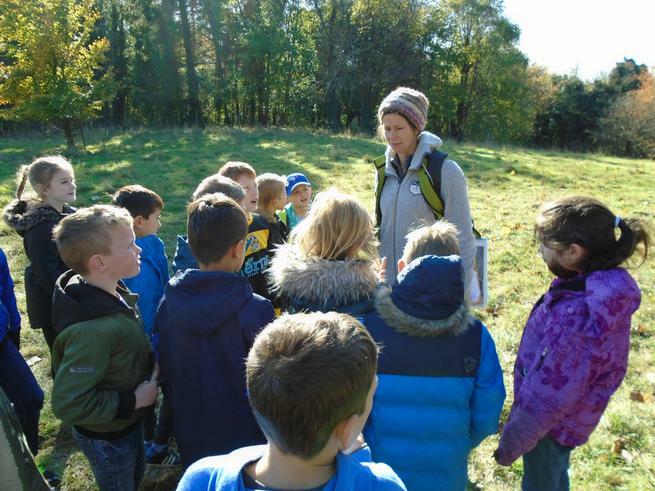 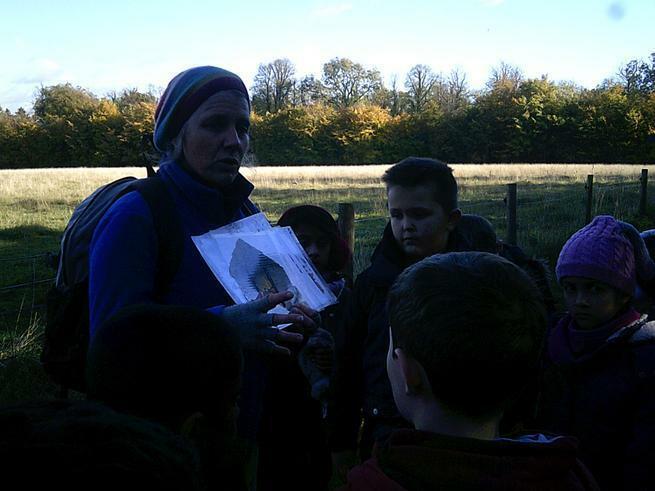 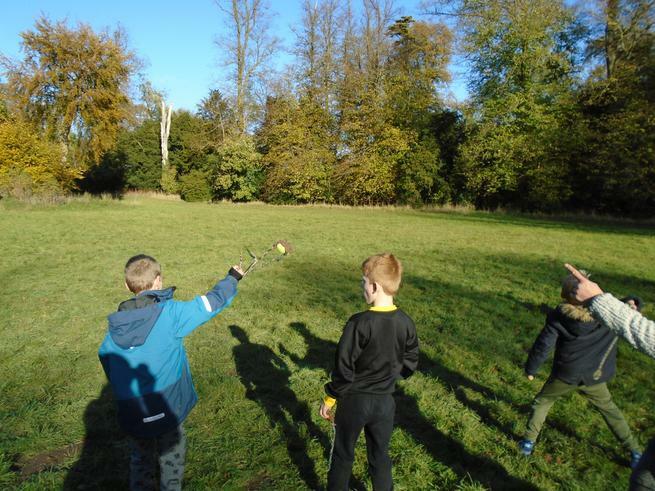 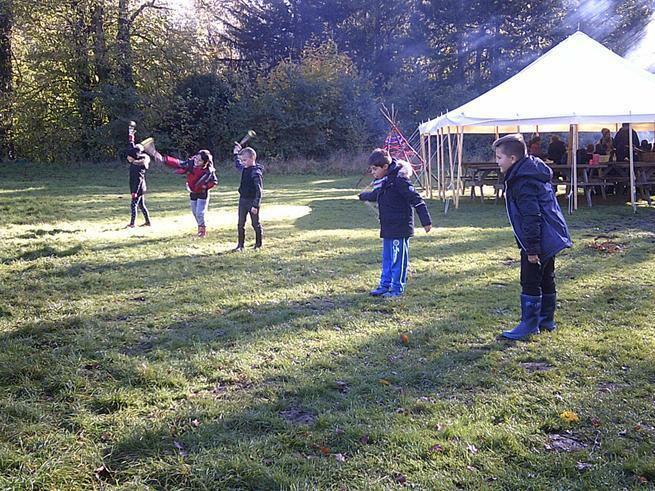 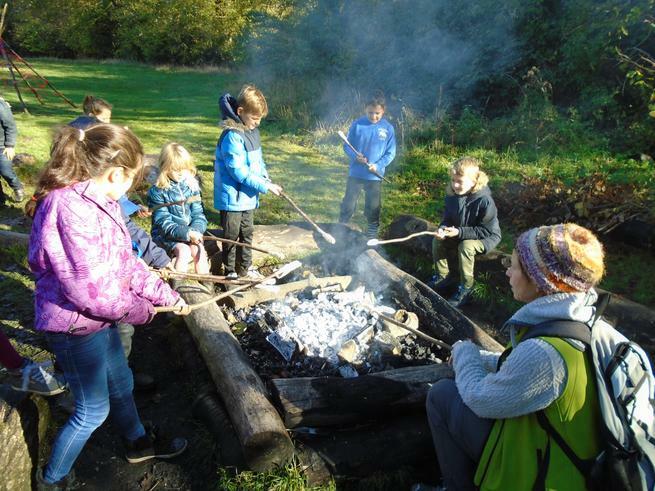 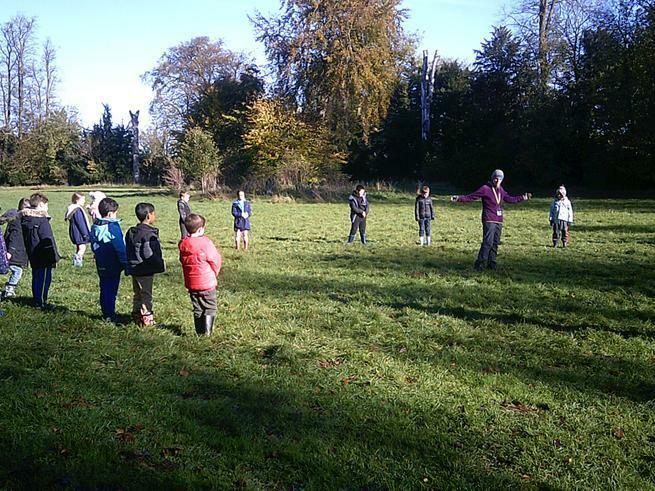 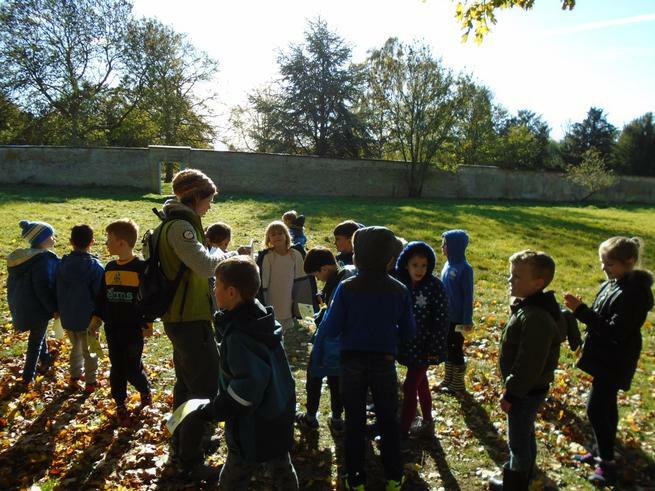 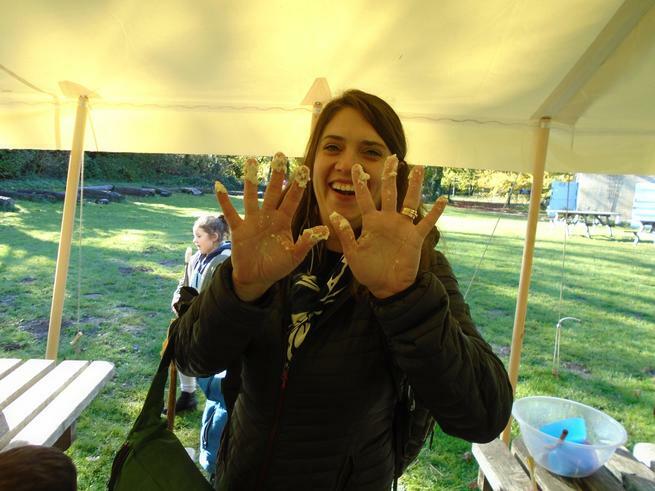 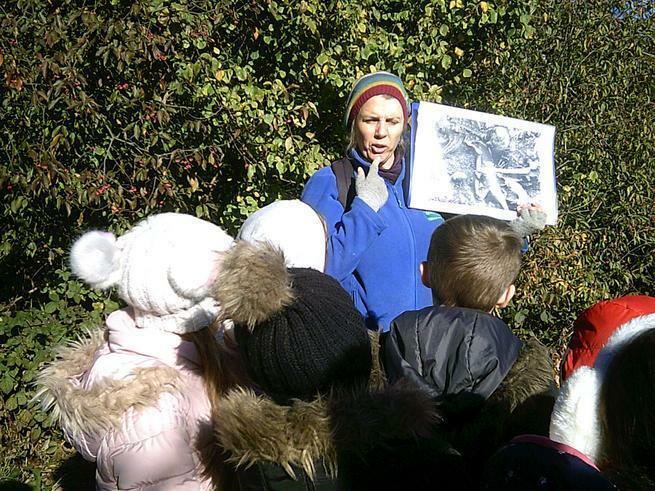 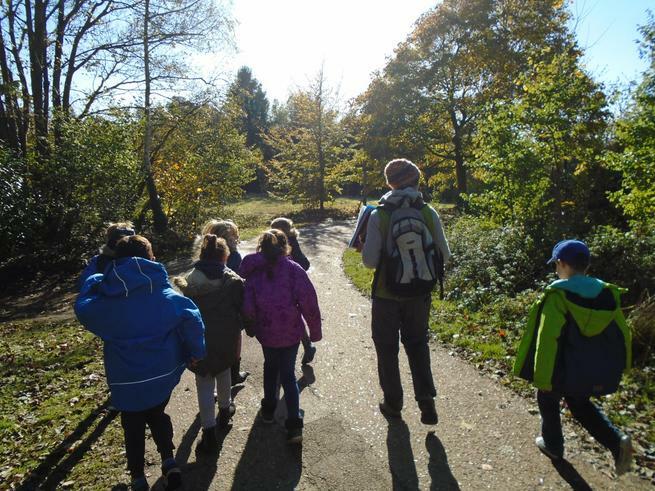 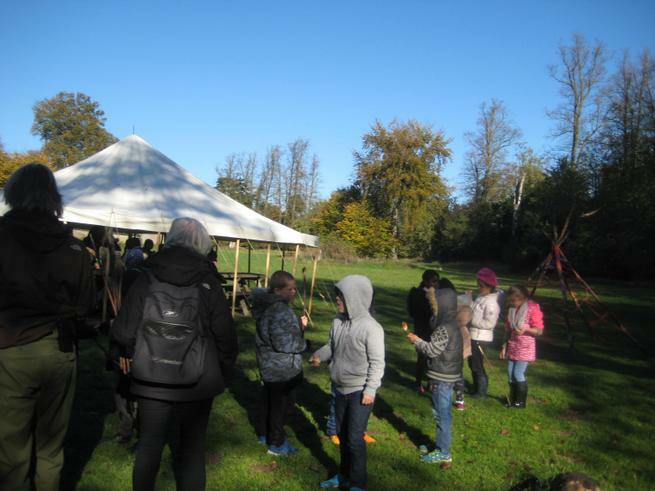 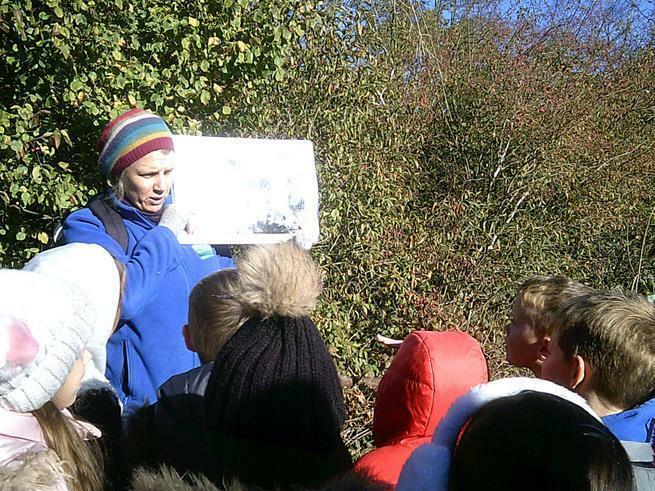 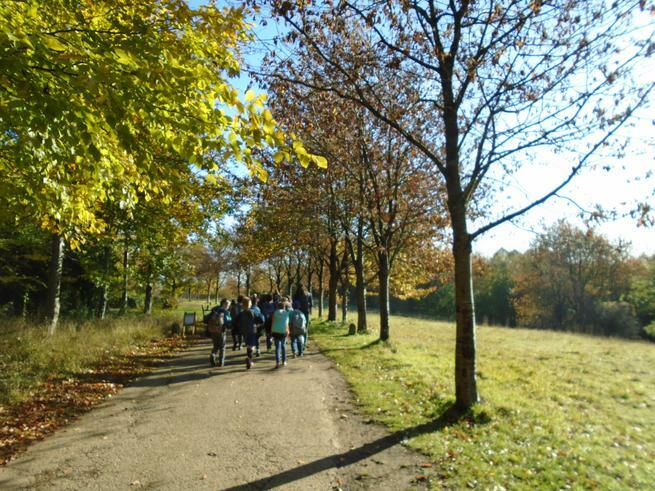 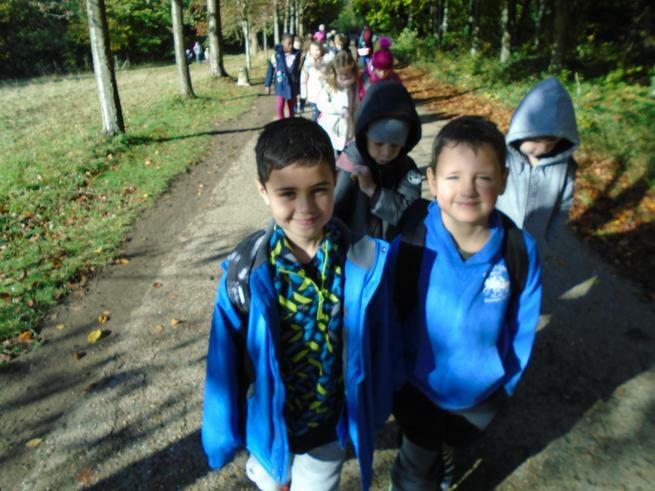 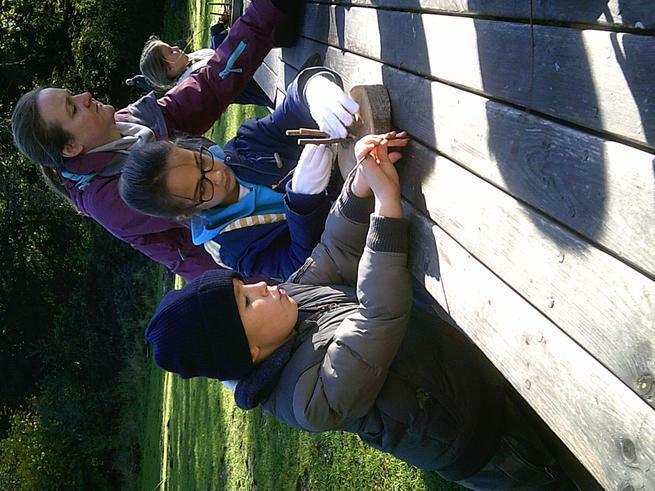 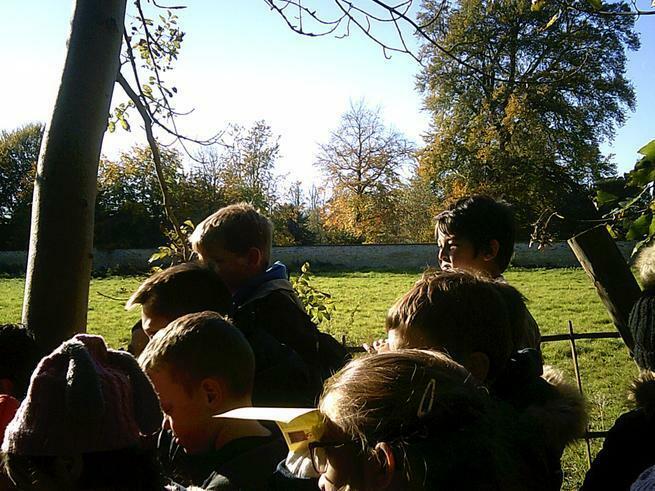 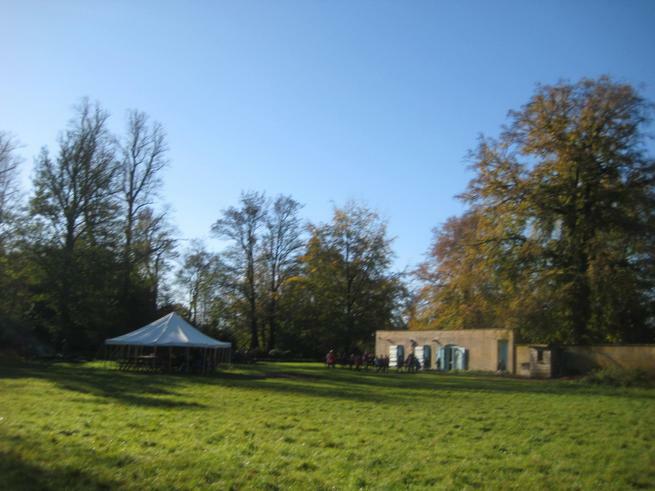 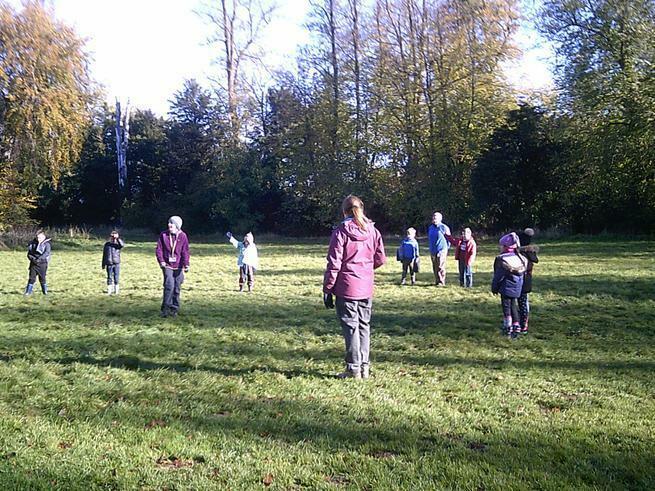 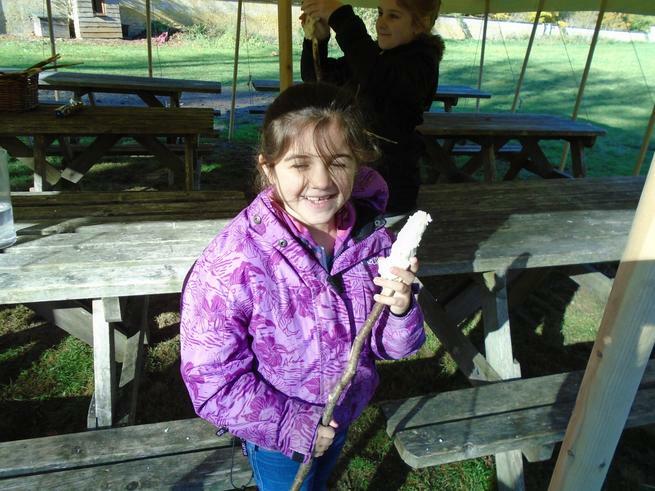 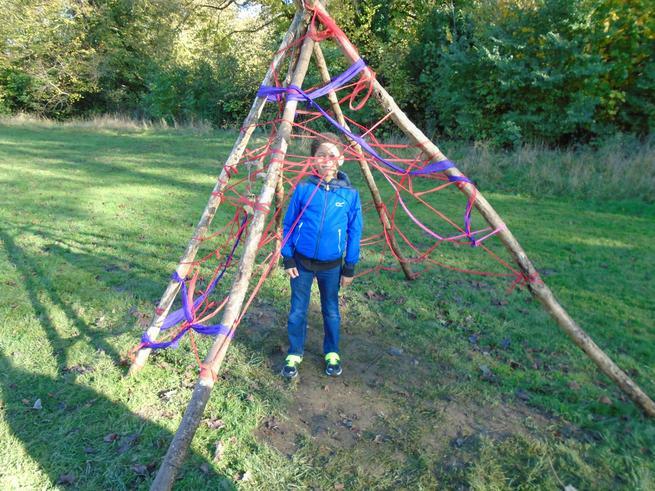 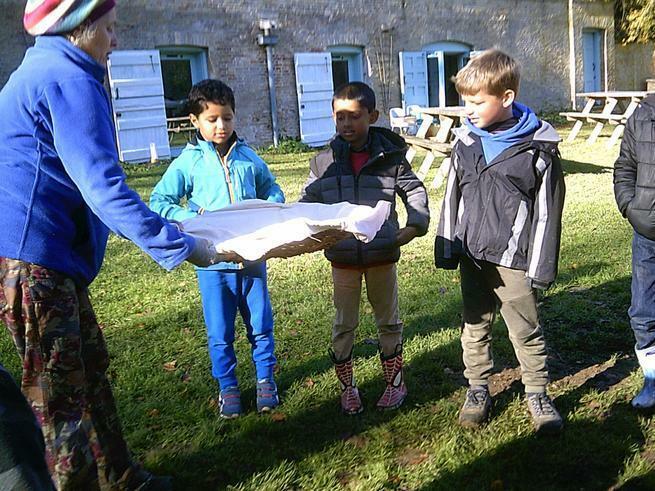 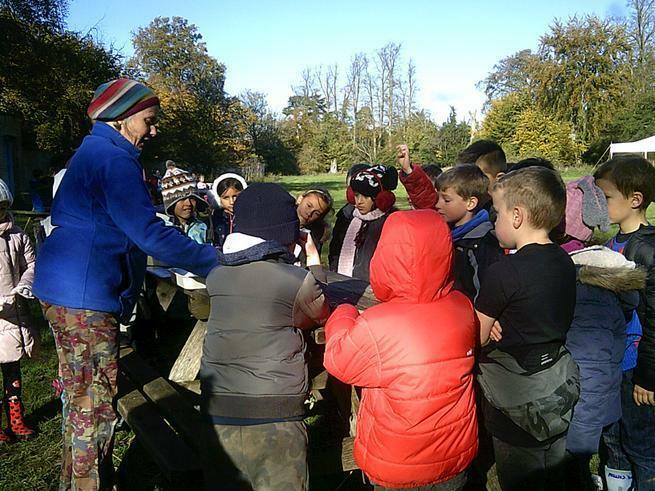 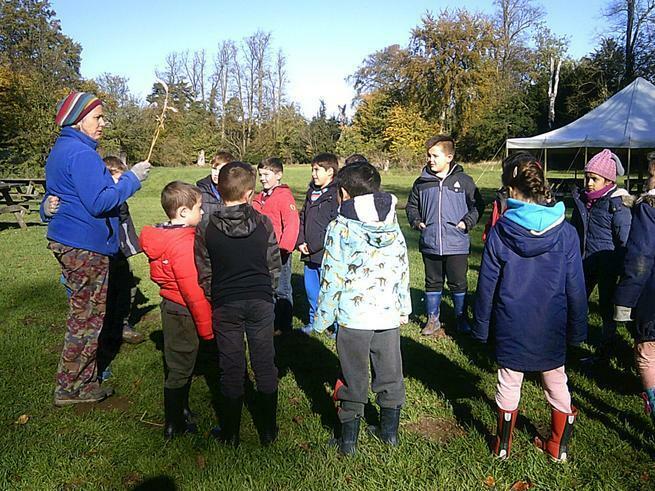 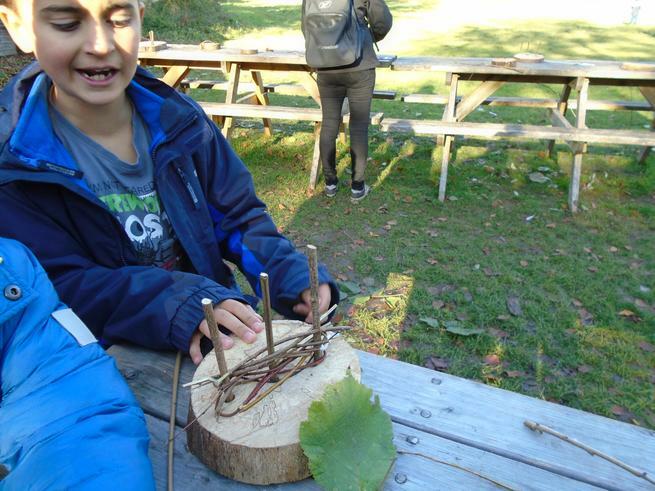 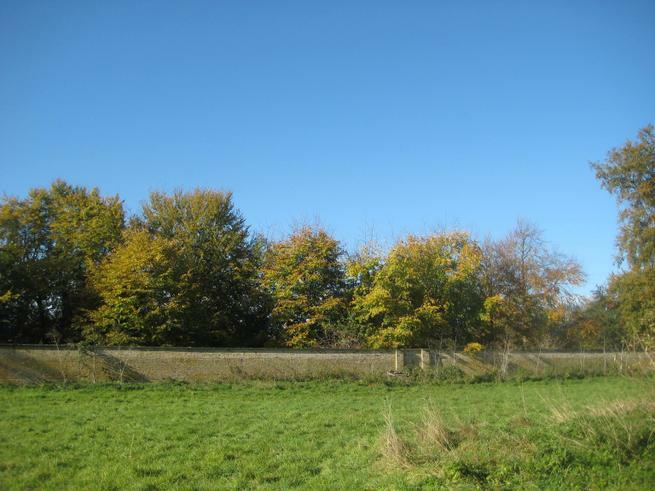 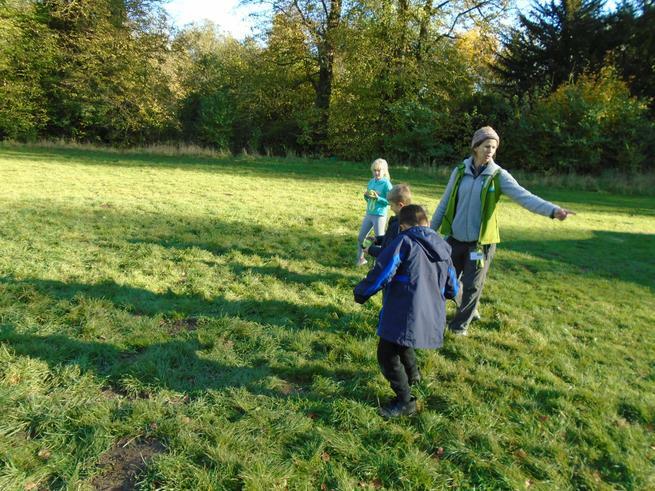 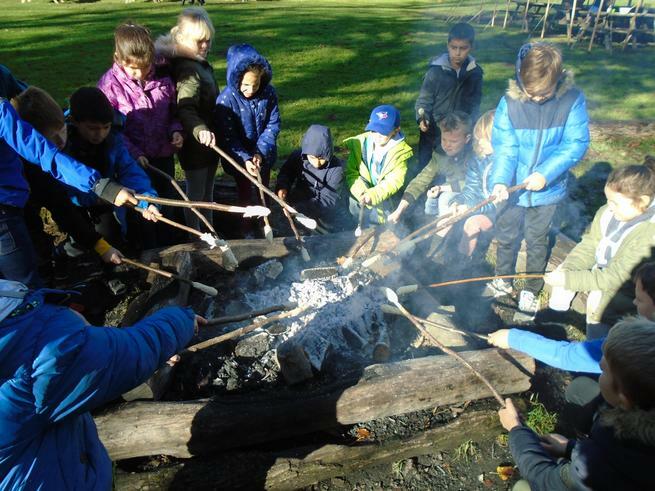 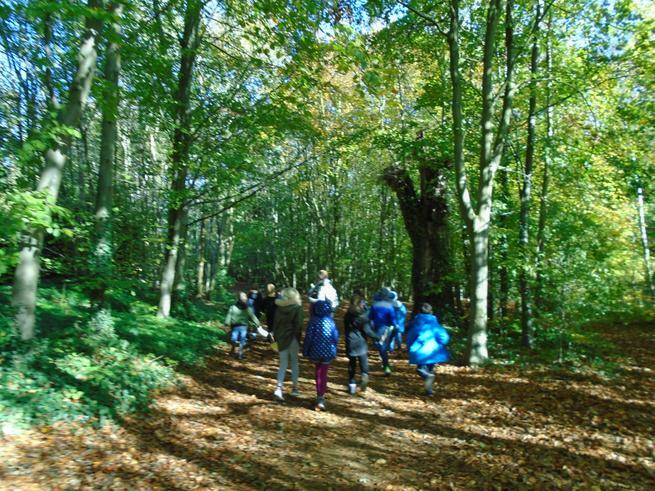 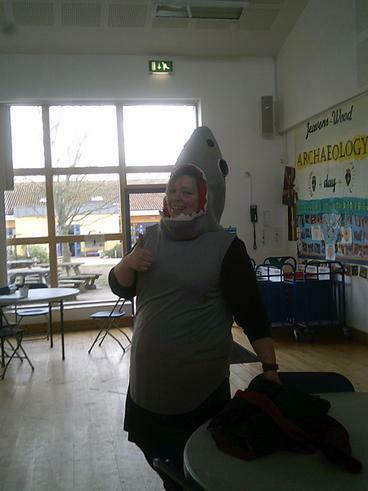 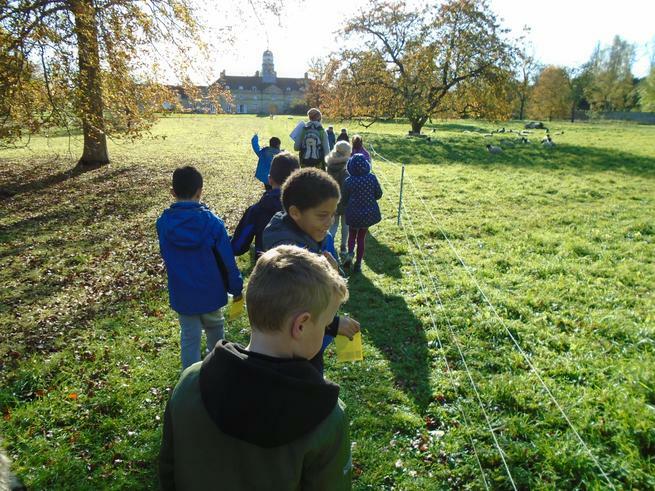 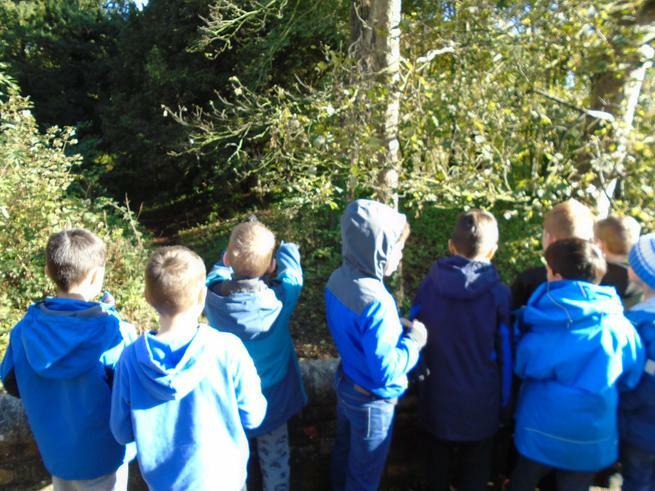 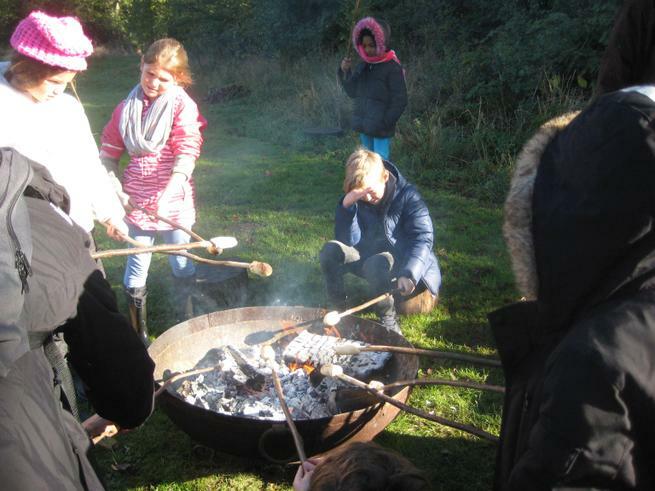 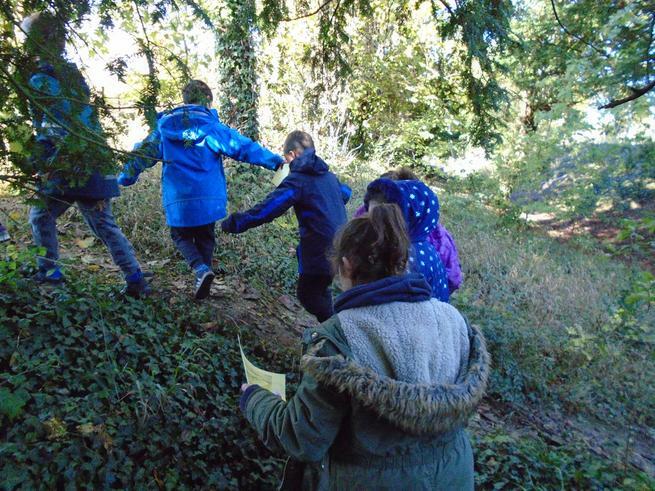 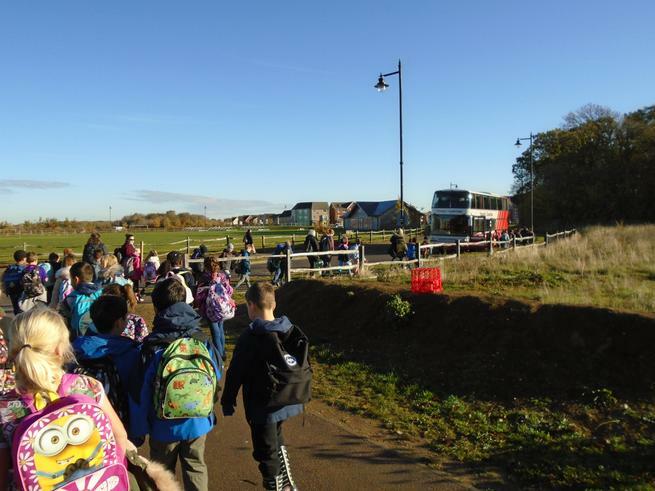 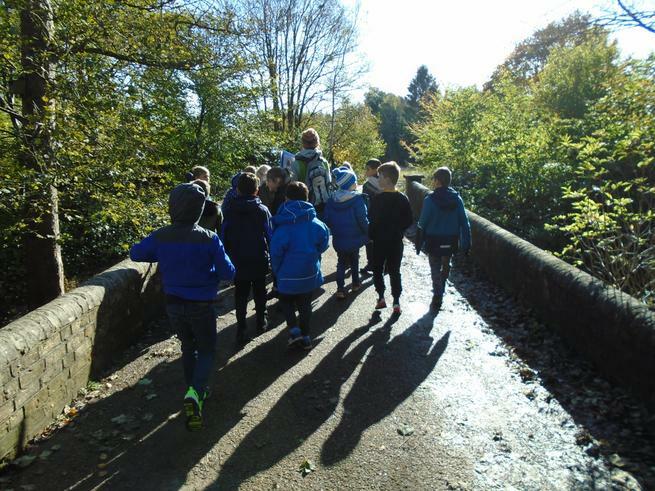 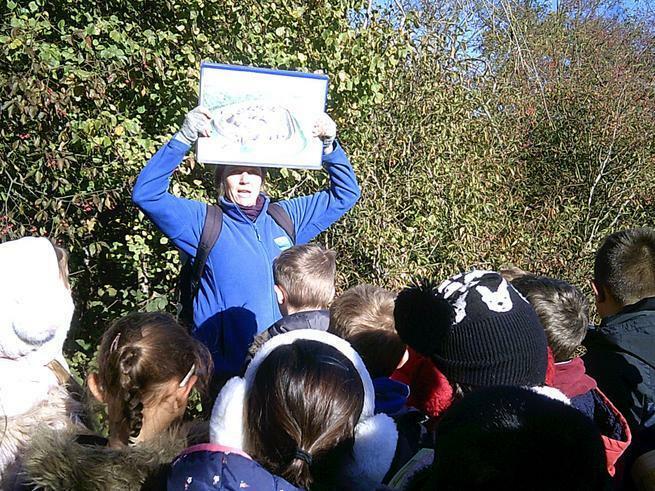 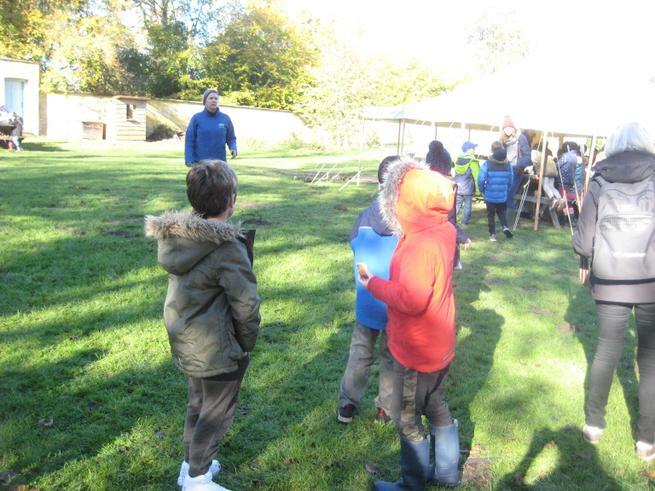 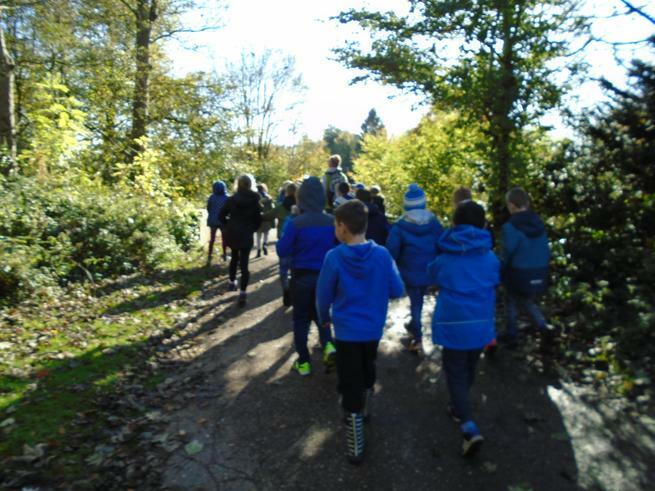 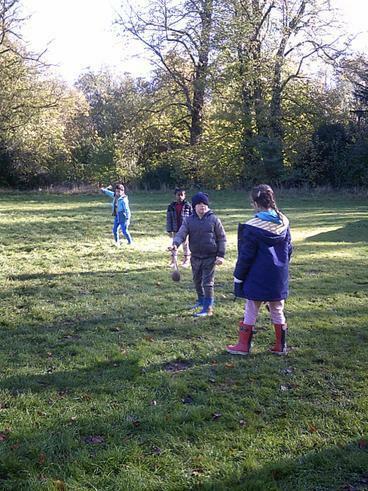 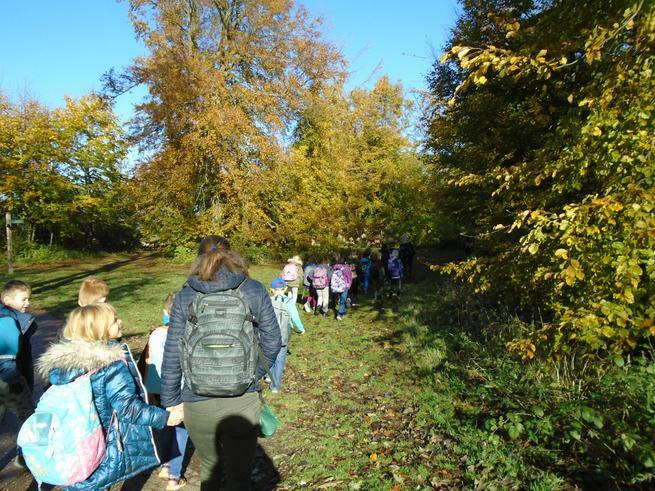 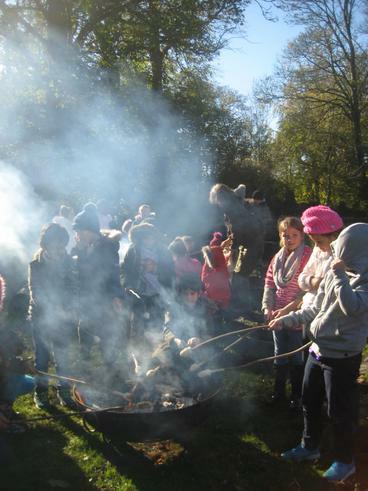 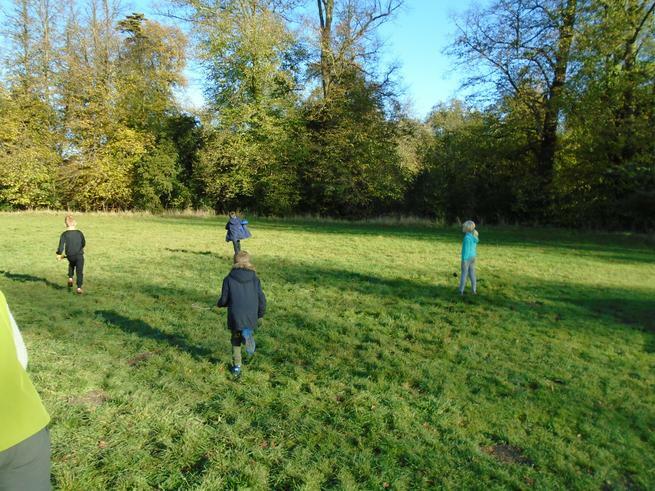 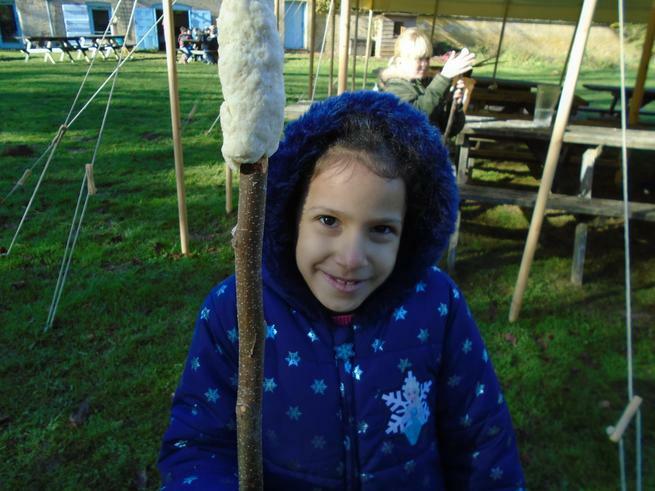 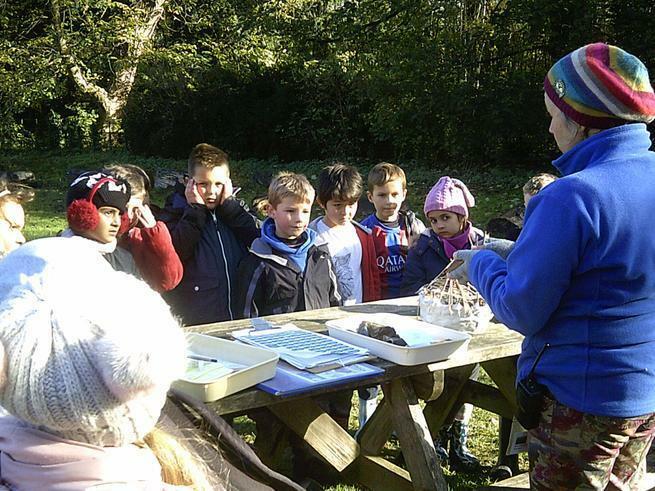 All in all it was a wonderful day and the children had an excellent time! 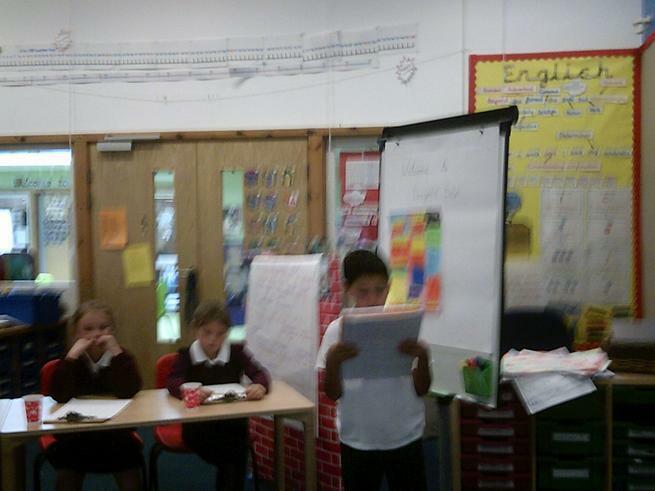 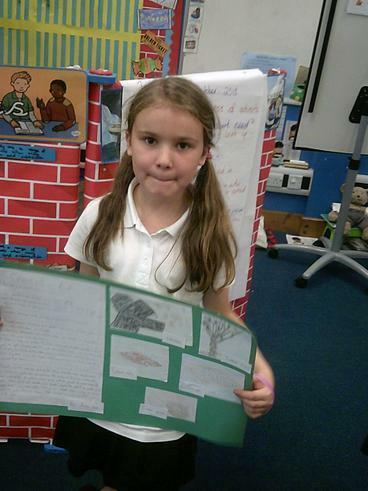 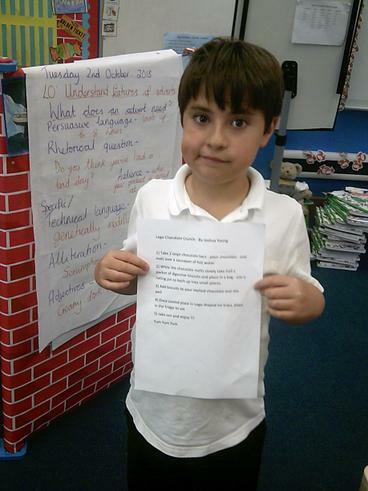 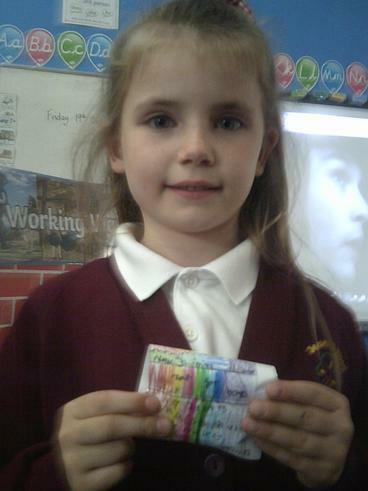 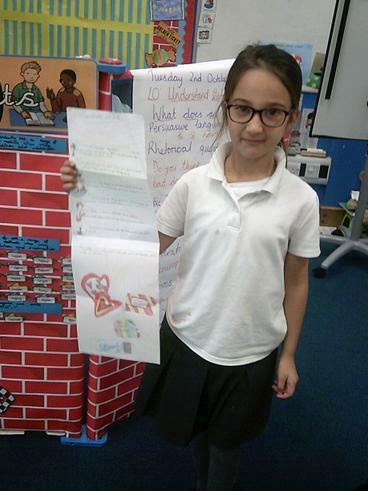 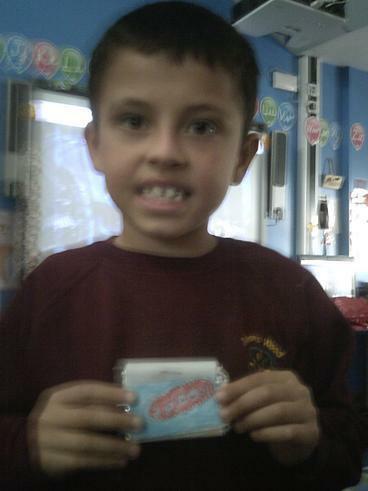 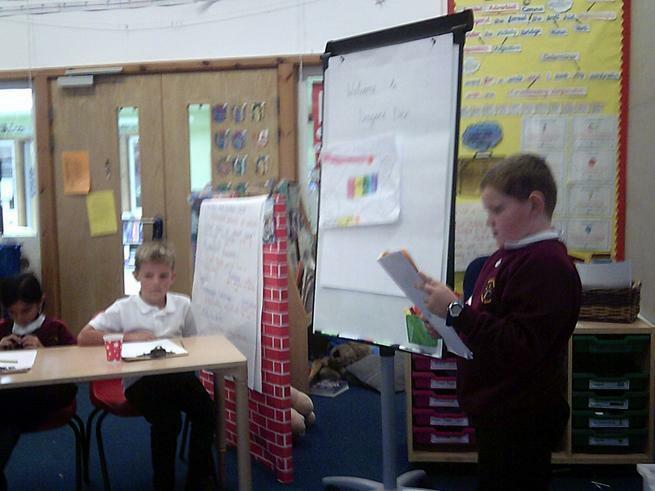 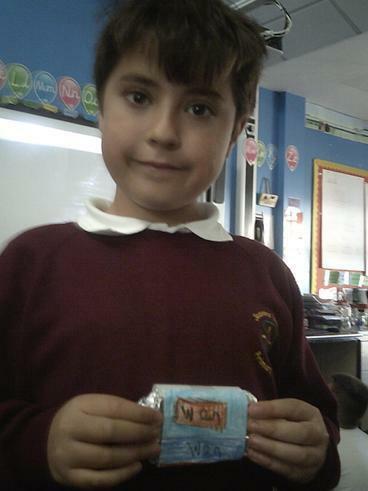 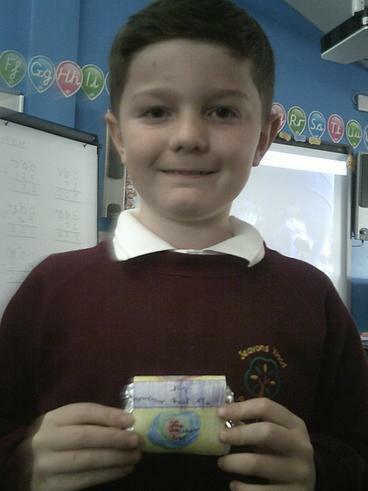 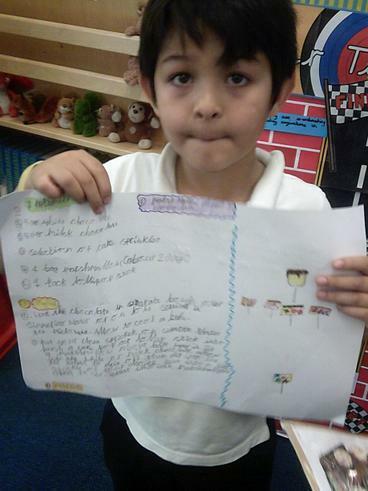 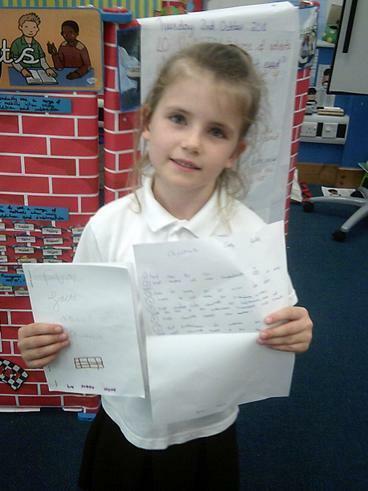 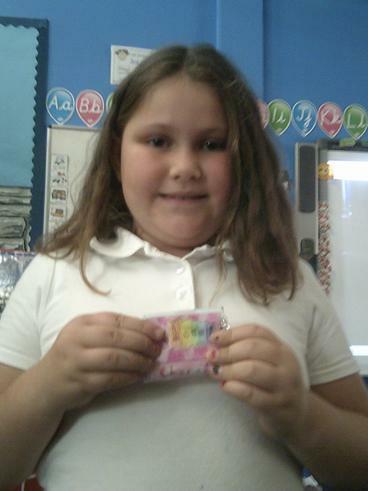 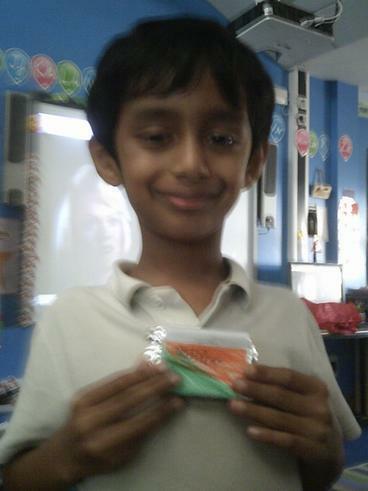 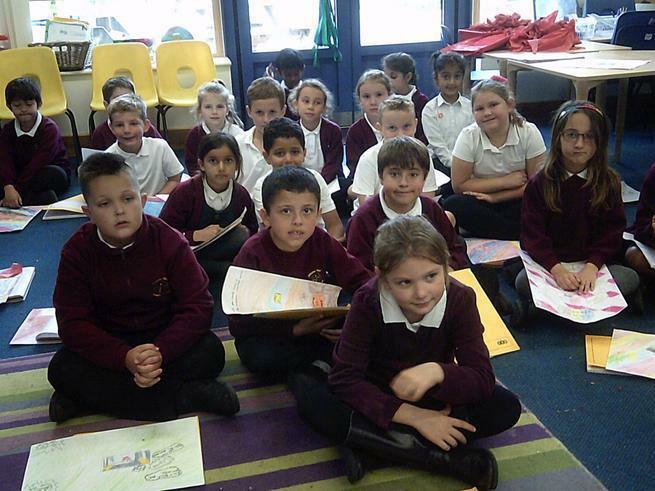 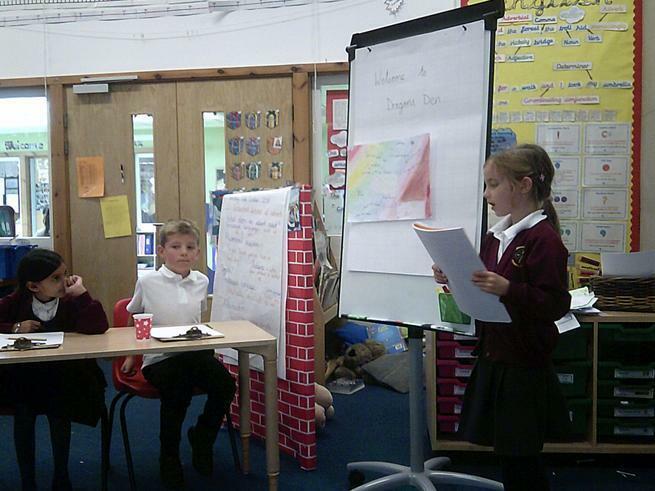 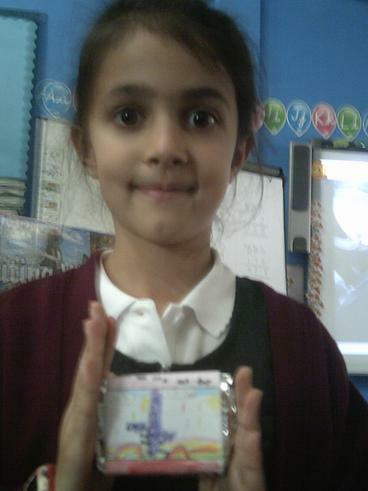 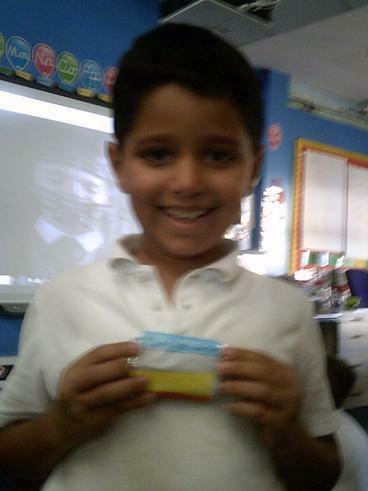 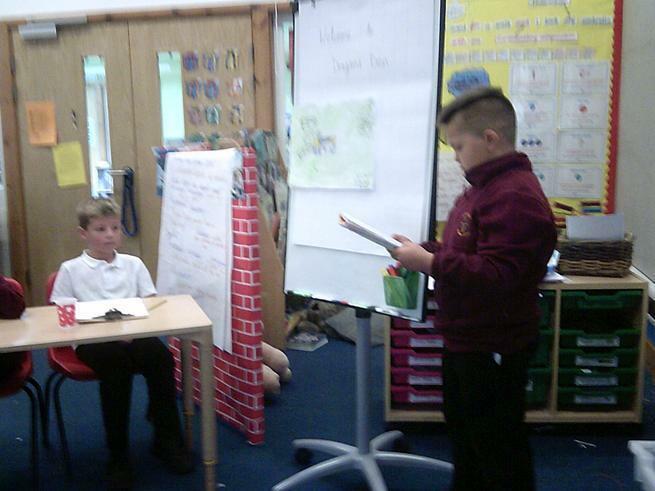 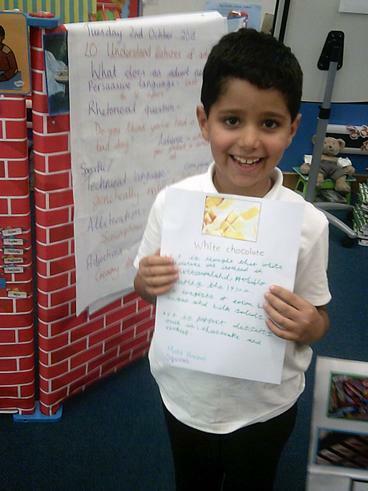 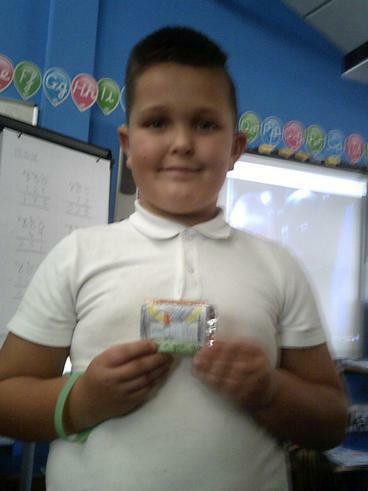 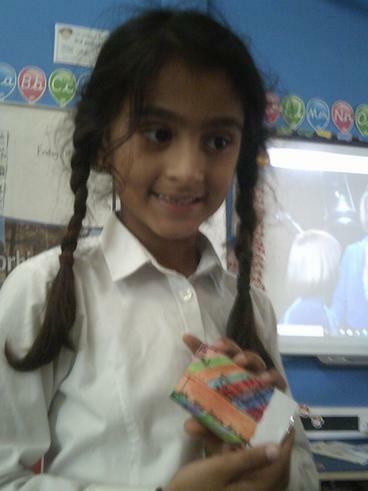 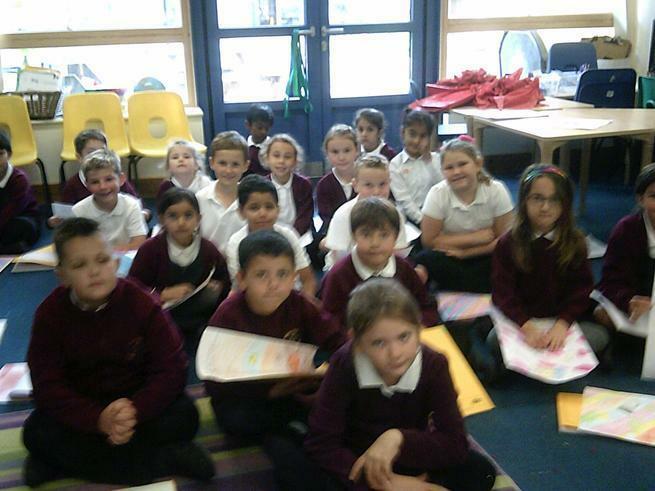 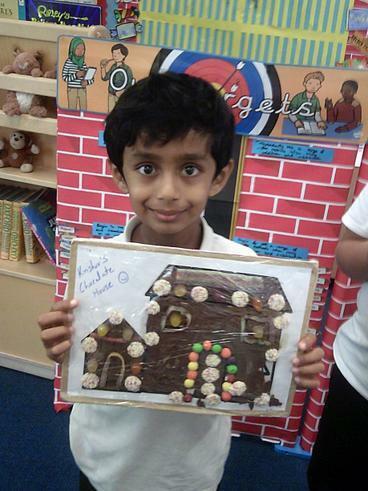 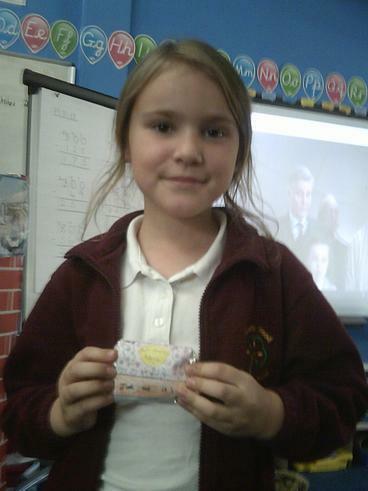 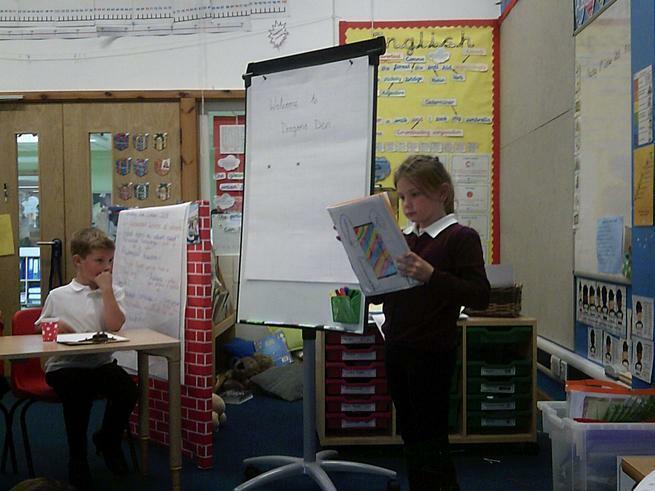 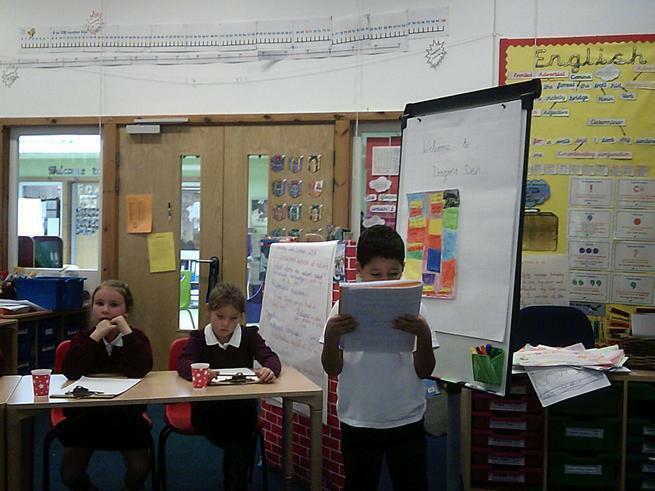 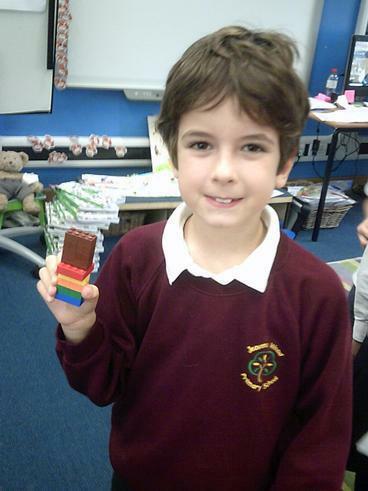 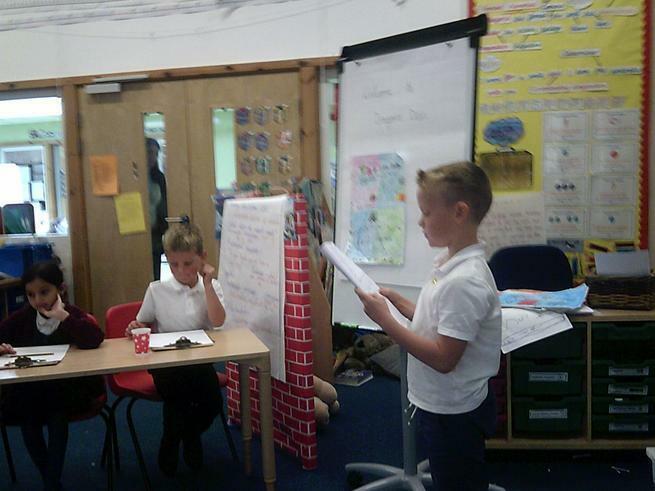 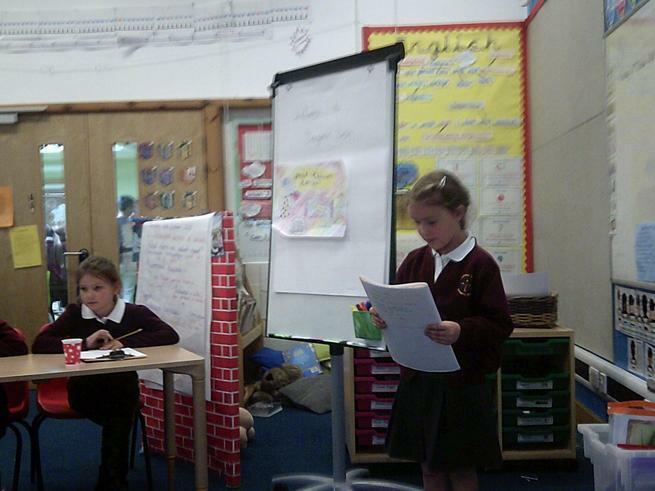 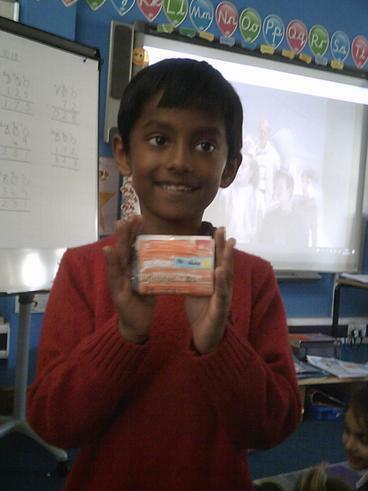 We were so impressed at the number of children that completed their project homework. 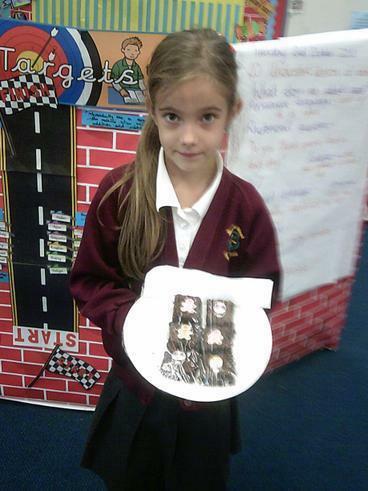 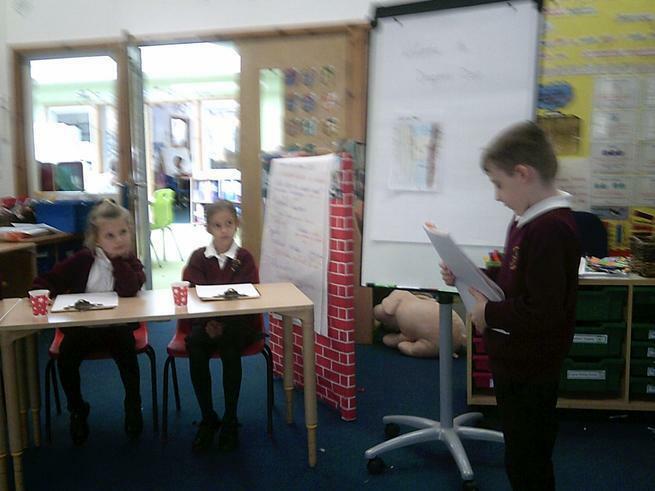 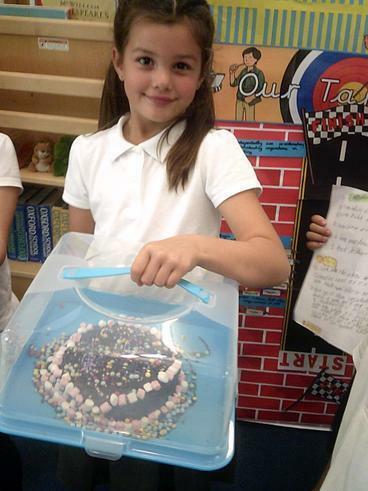 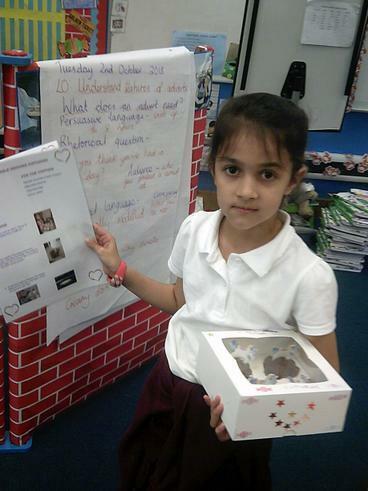 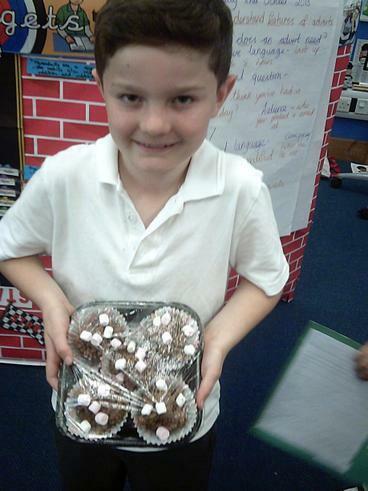 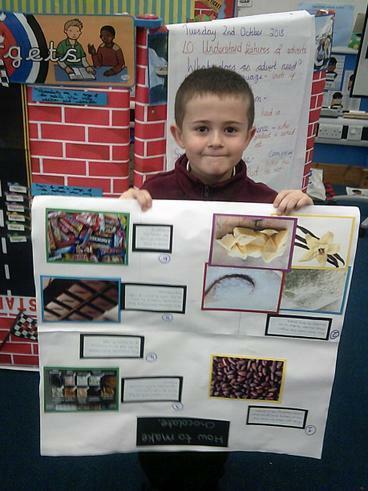 There were some very yummy cakes, super information posters and a few models. 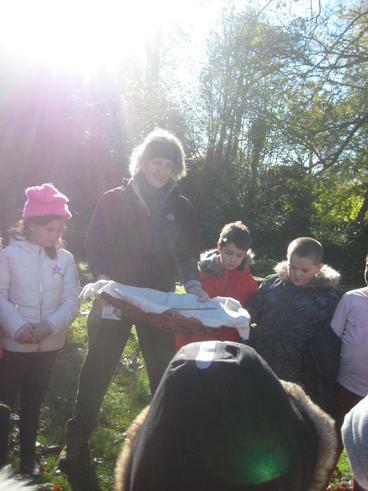 Well done Squirrels!! 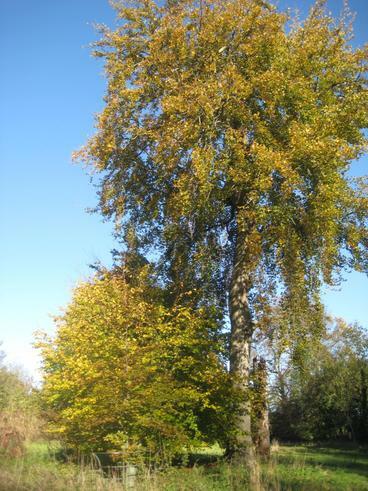 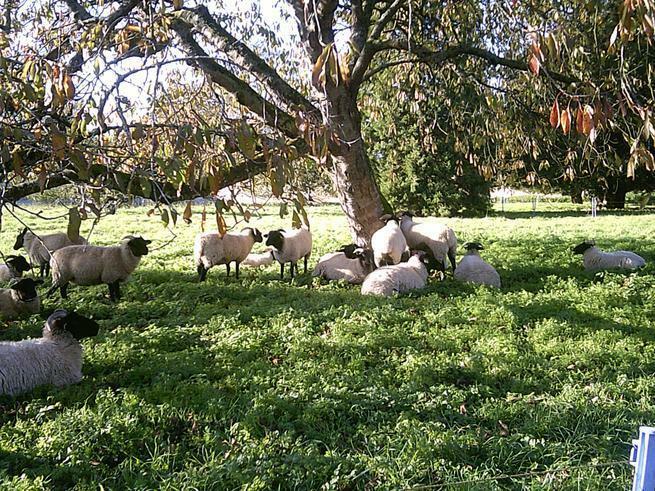 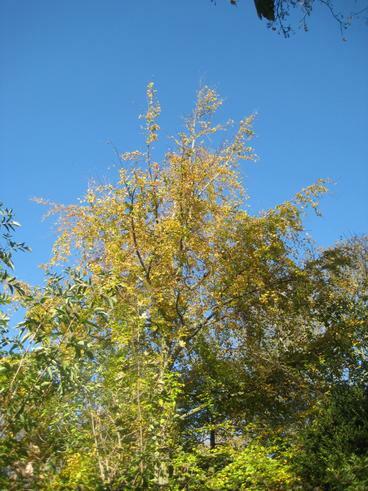 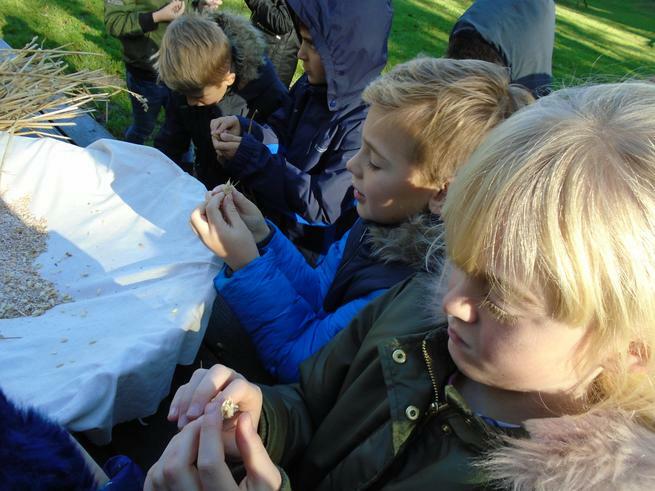 The Squirrels have all settled in to the new term so well and are all working hard. 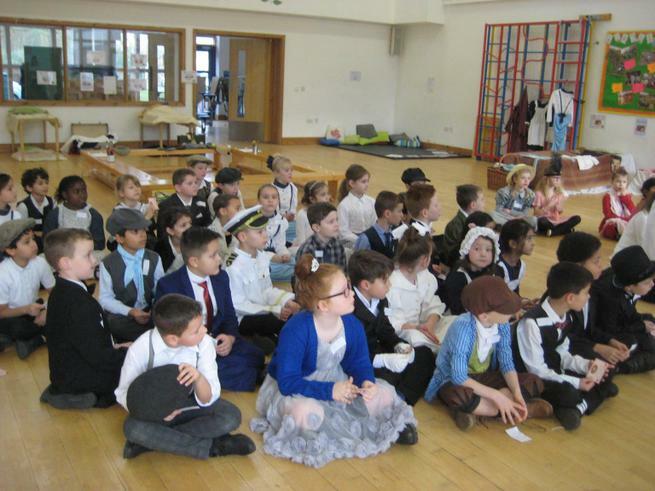 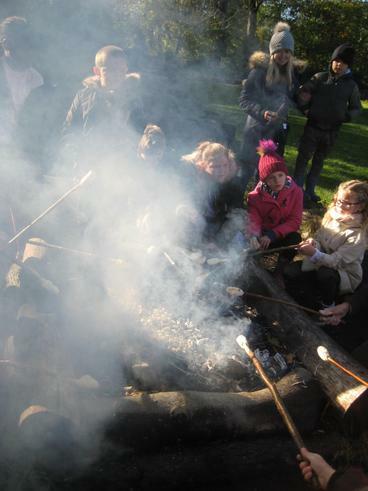 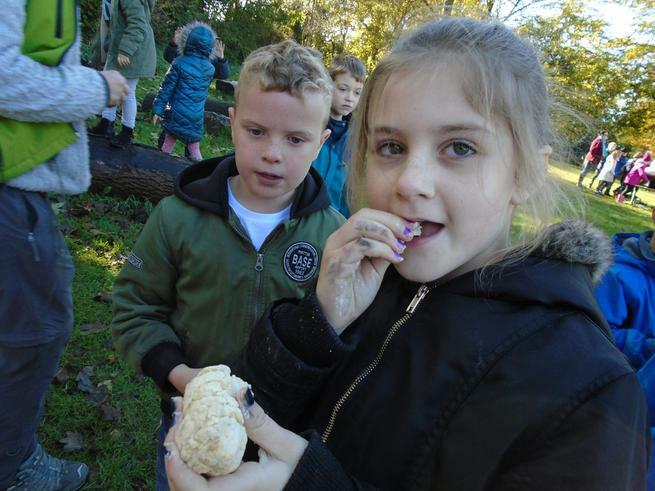 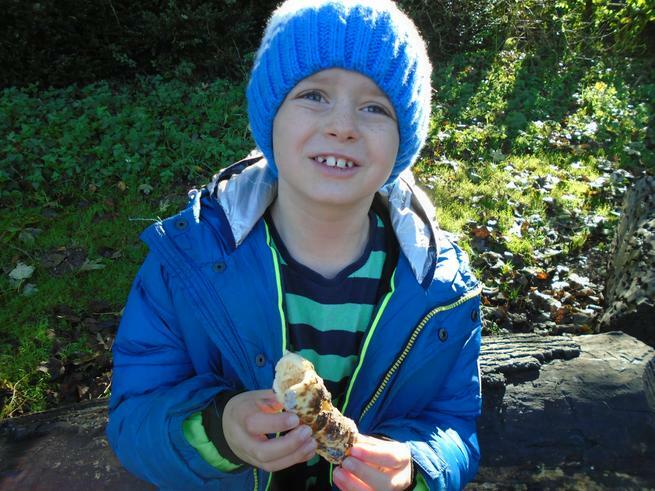 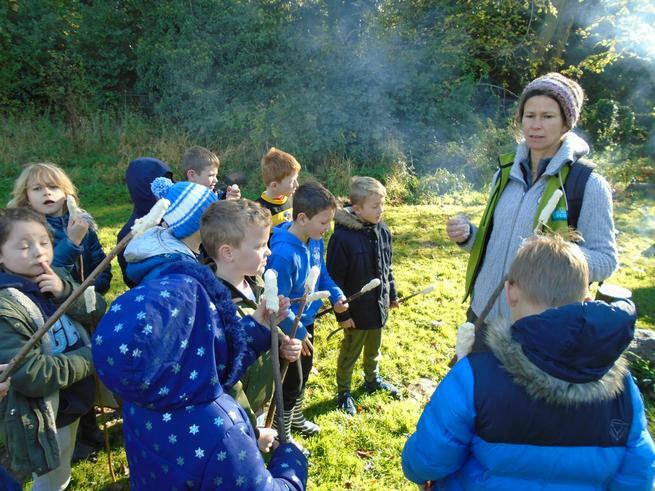 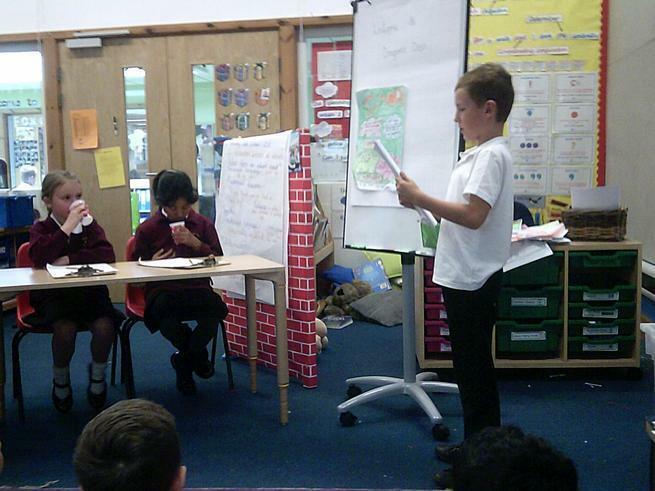 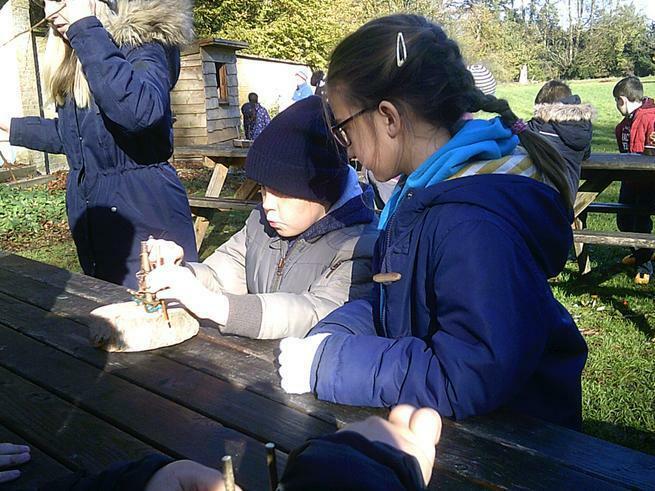 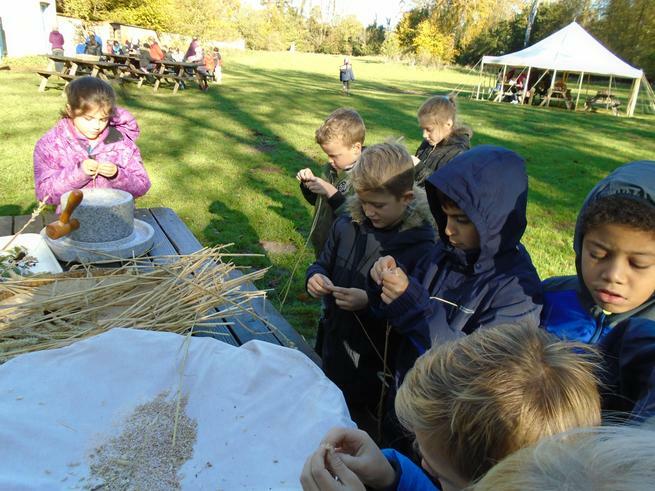 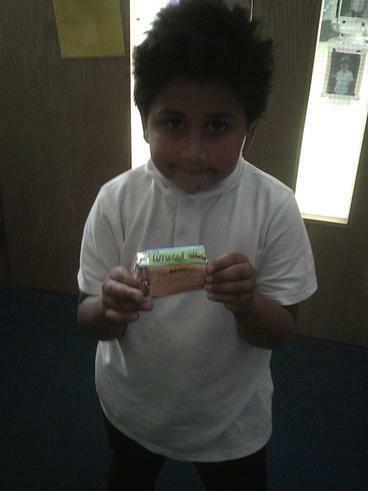 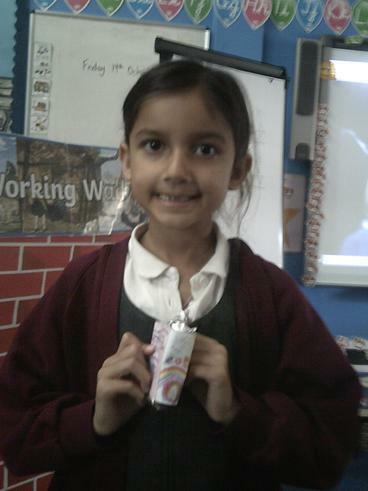 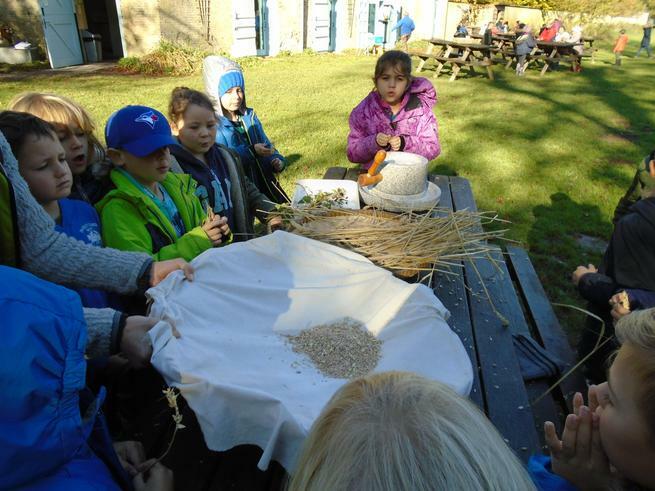 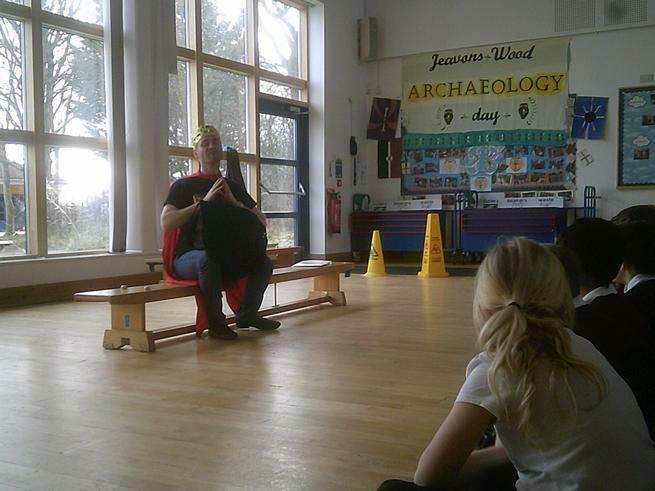 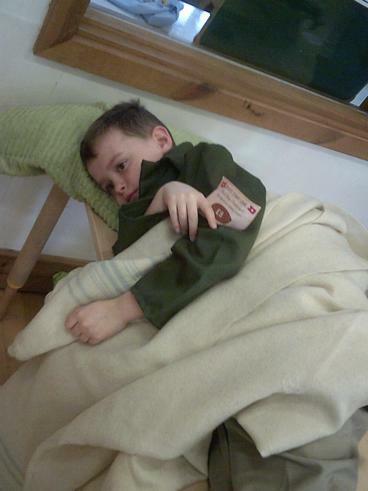 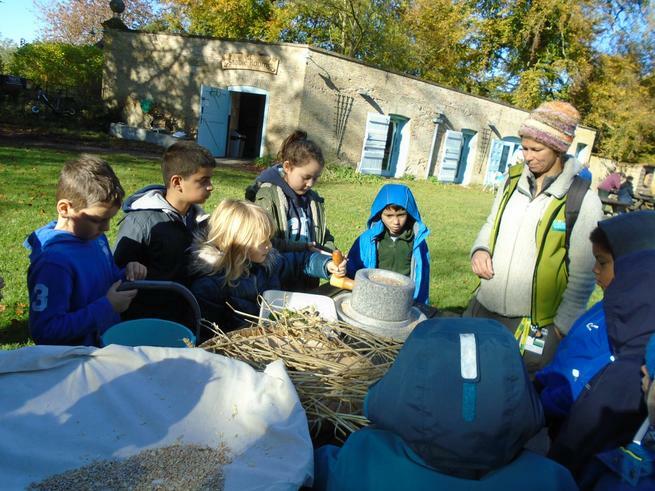 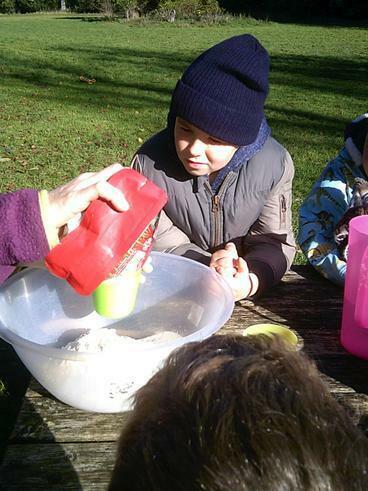 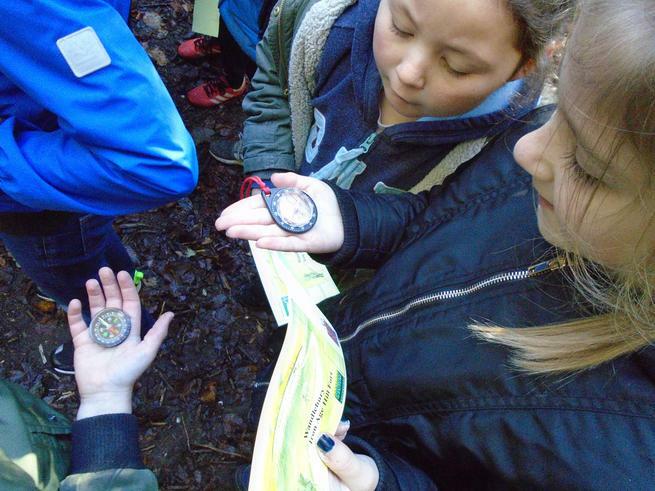 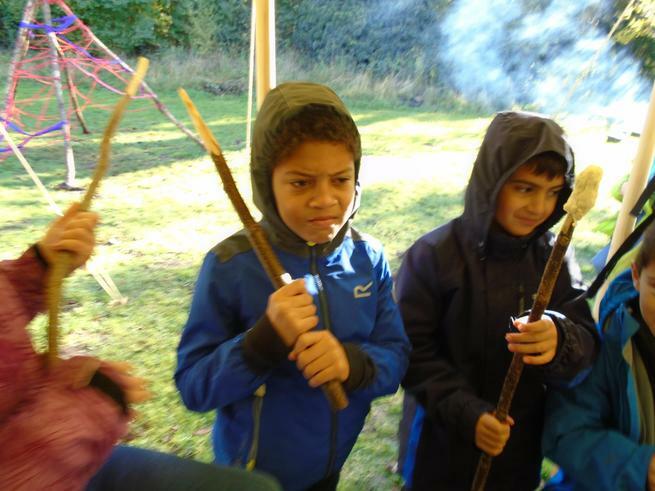 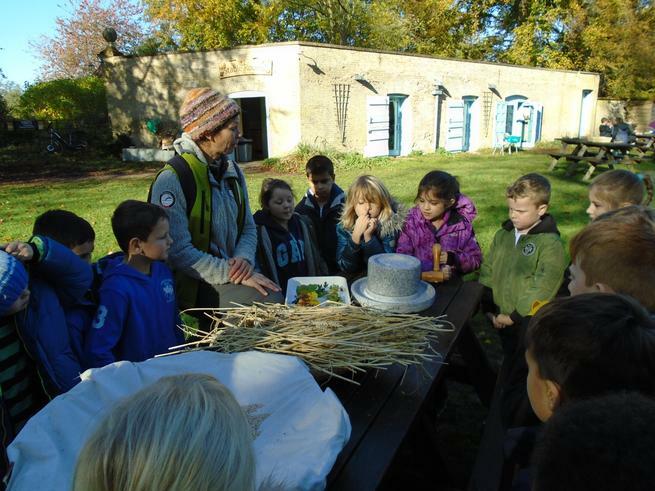 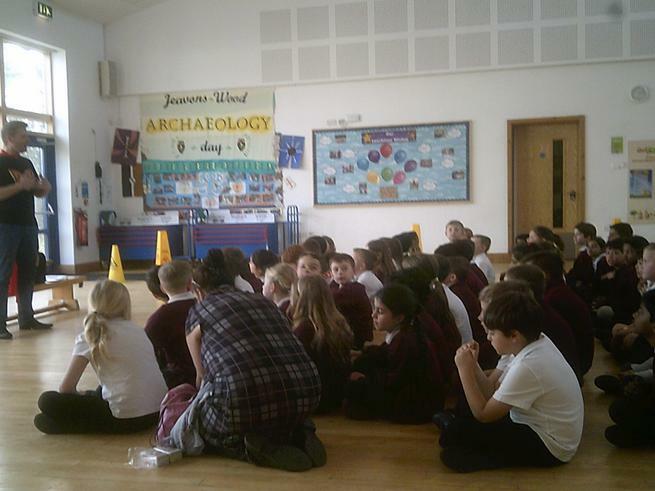 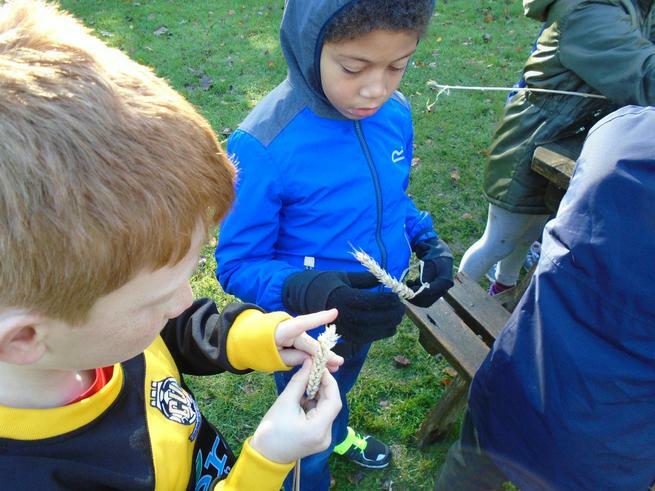 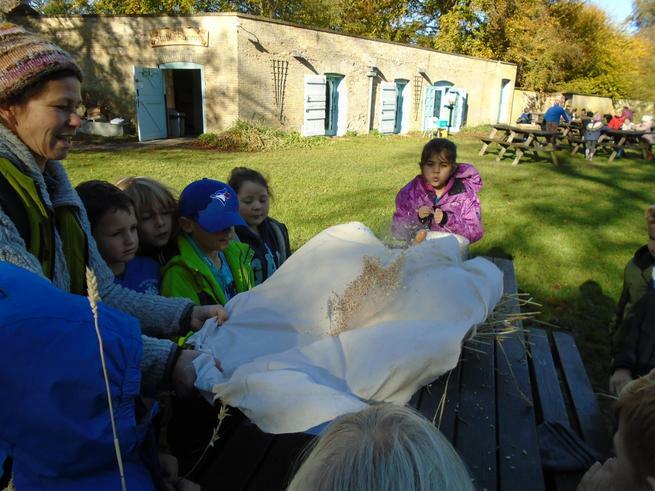 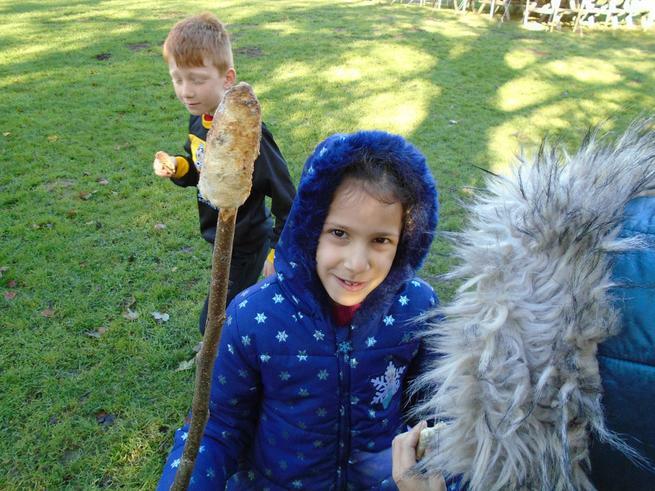 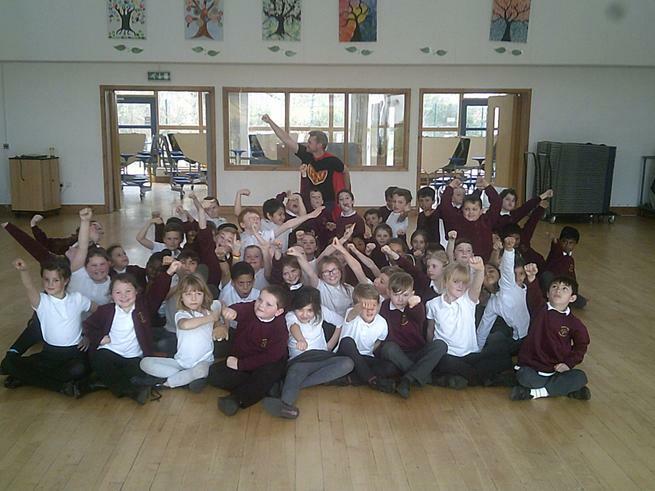 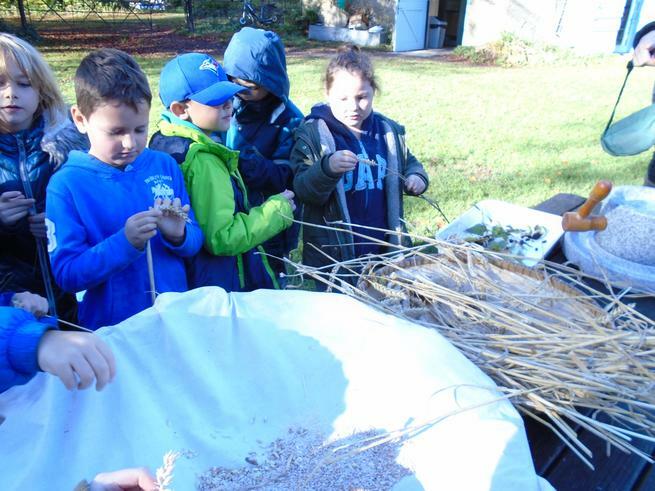 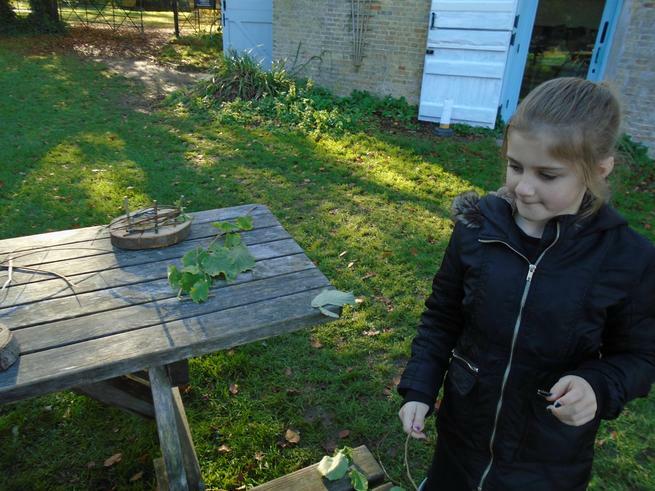 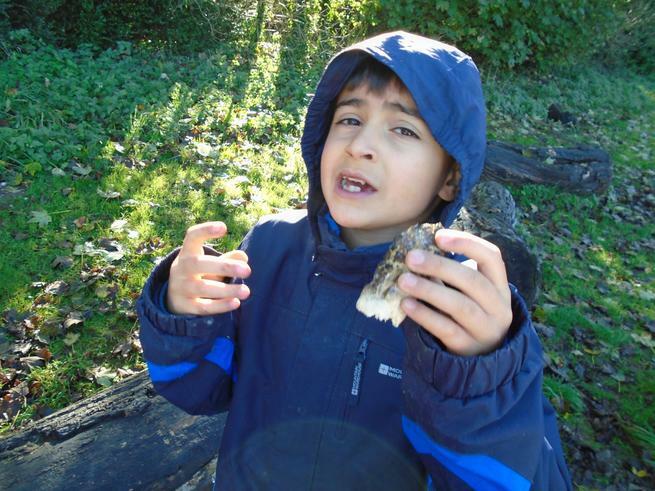 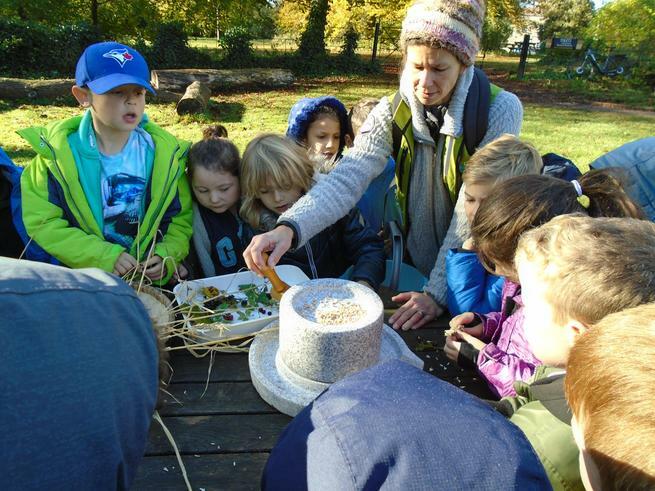 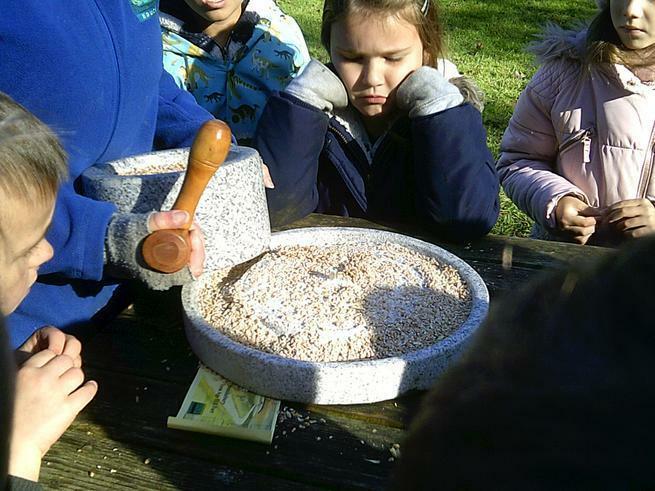 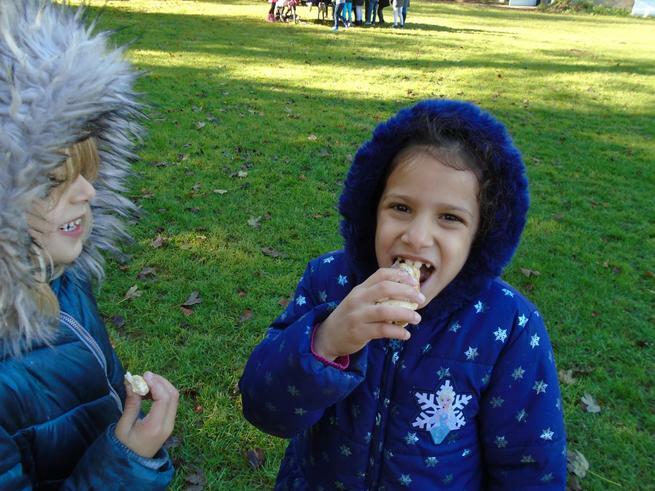 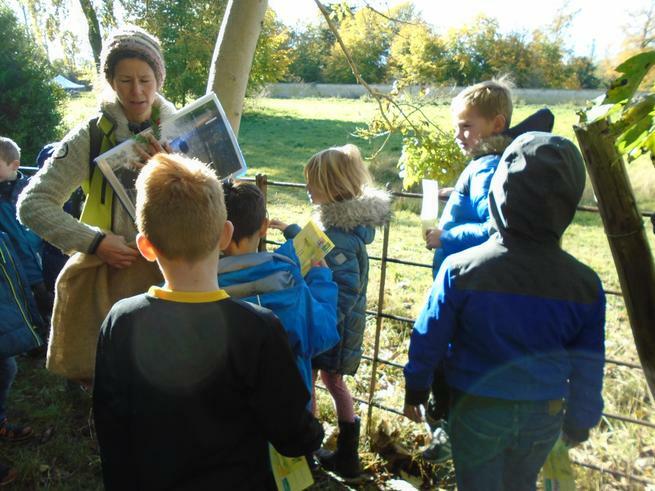 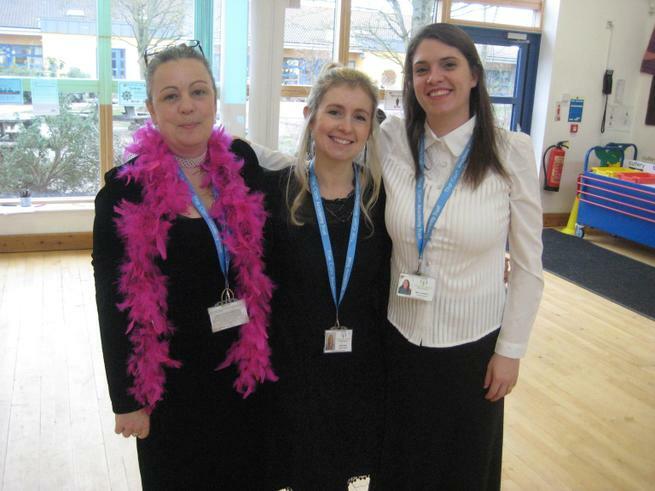 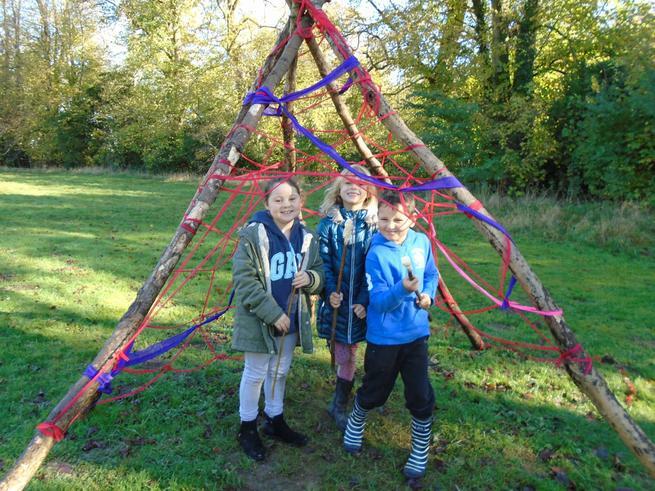 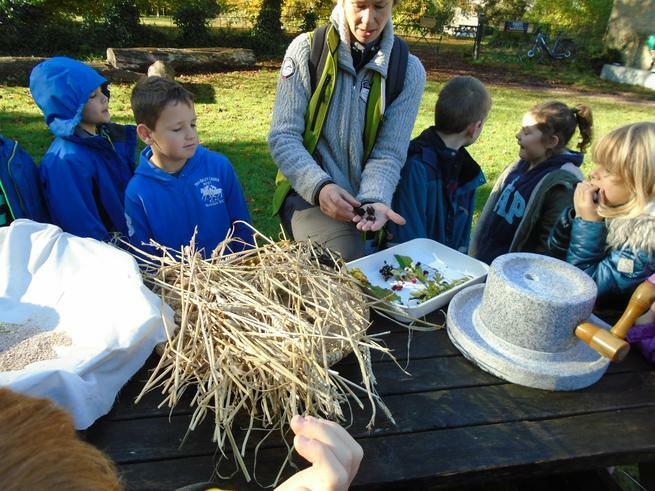 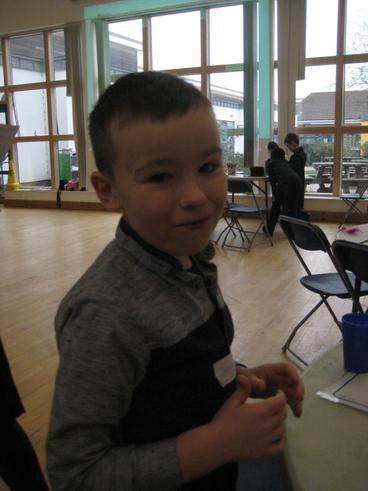 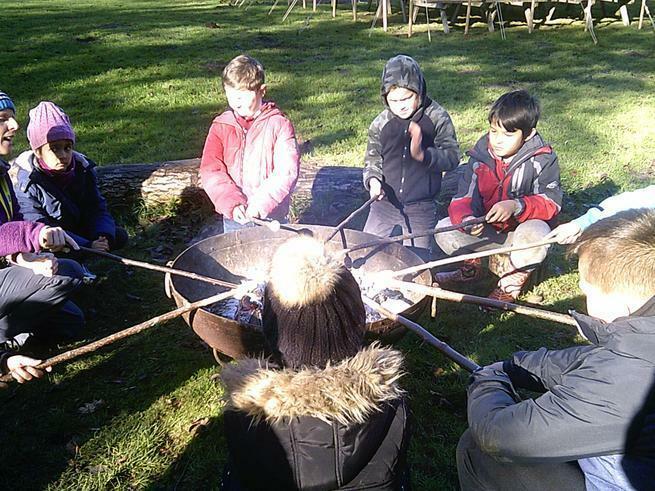 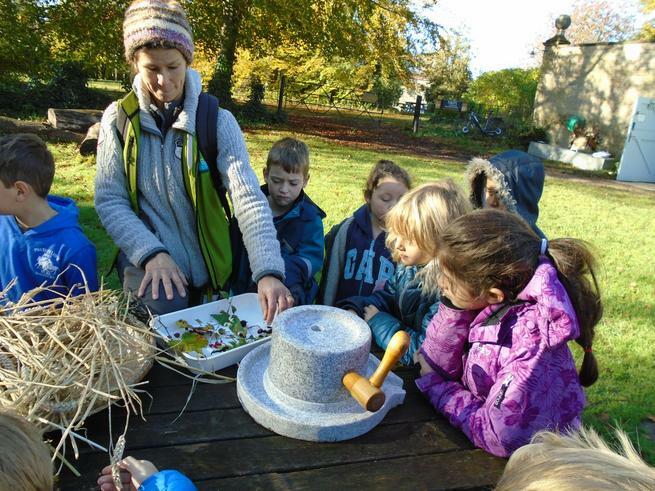 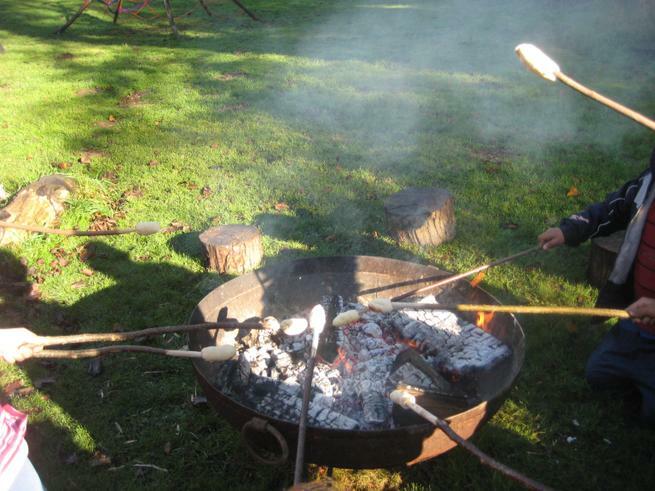 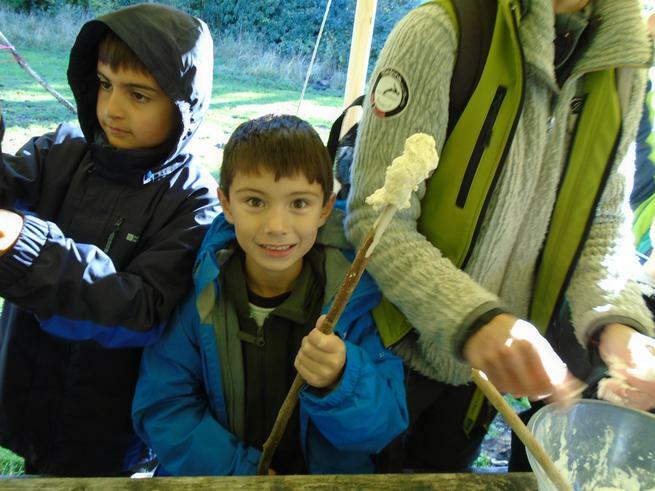 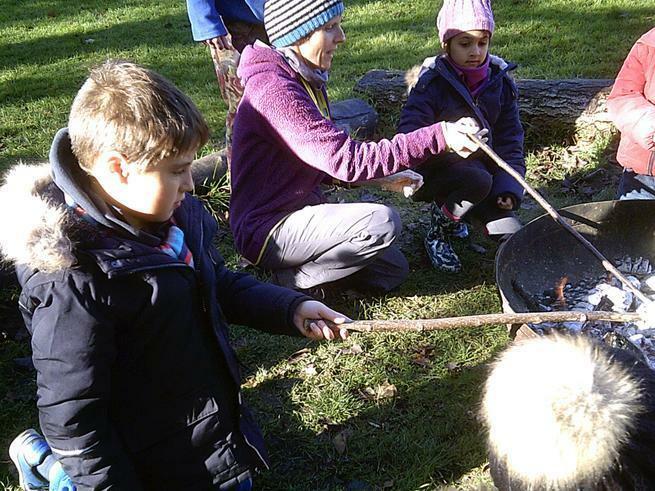 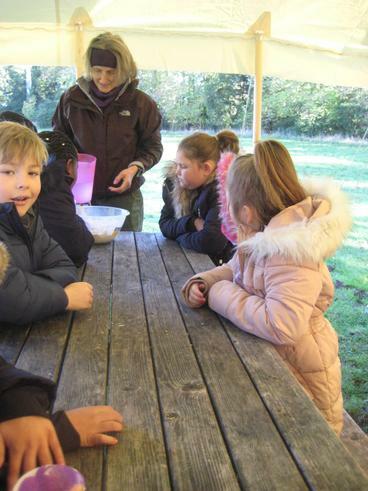 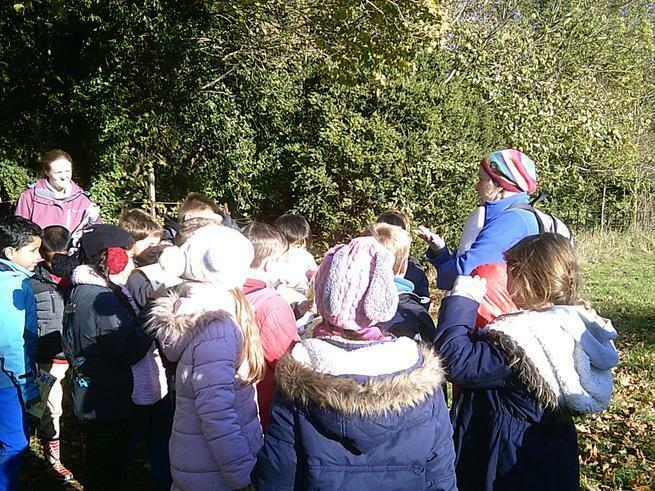 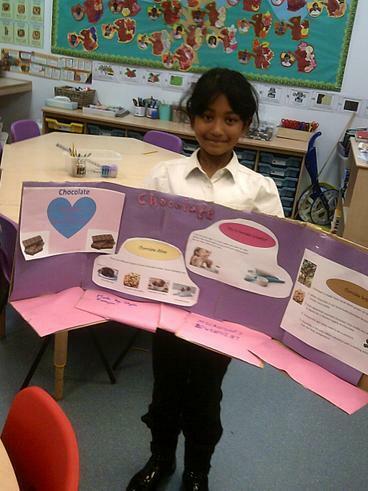 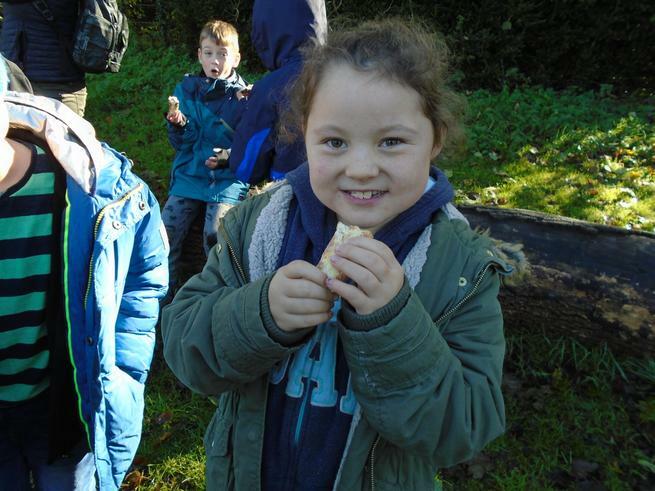 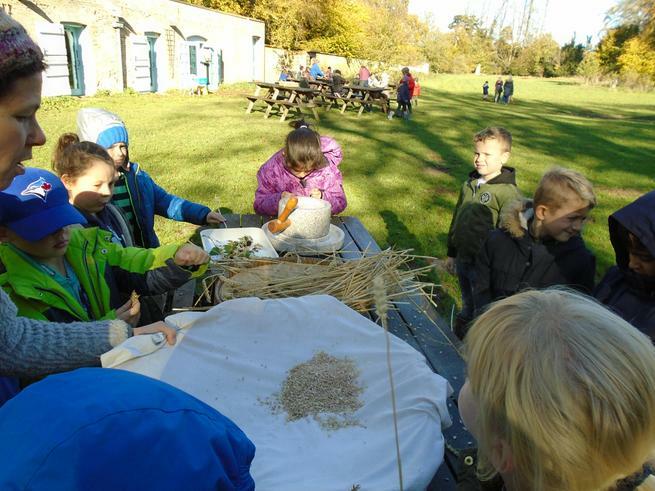 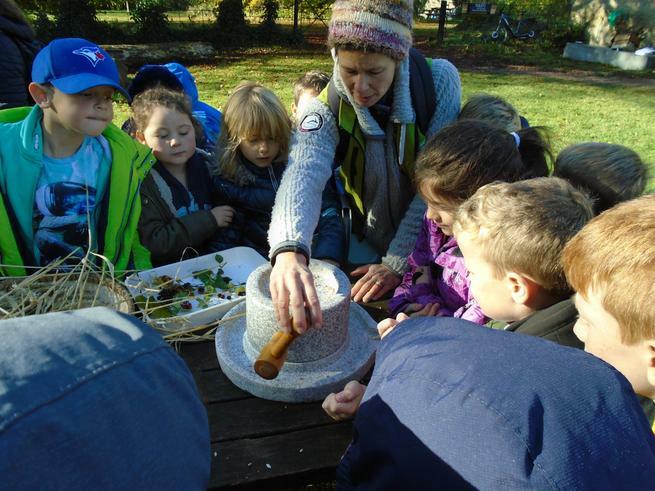 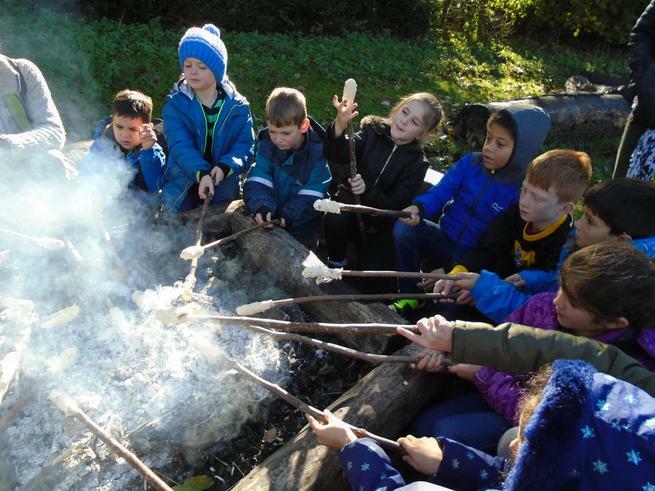 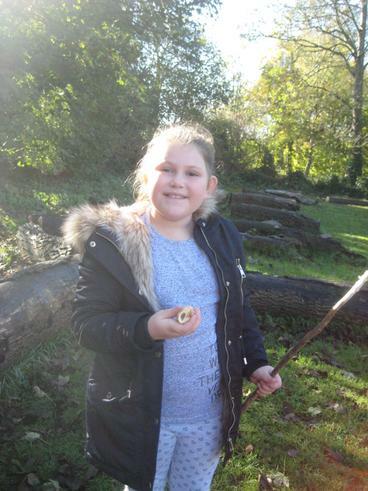 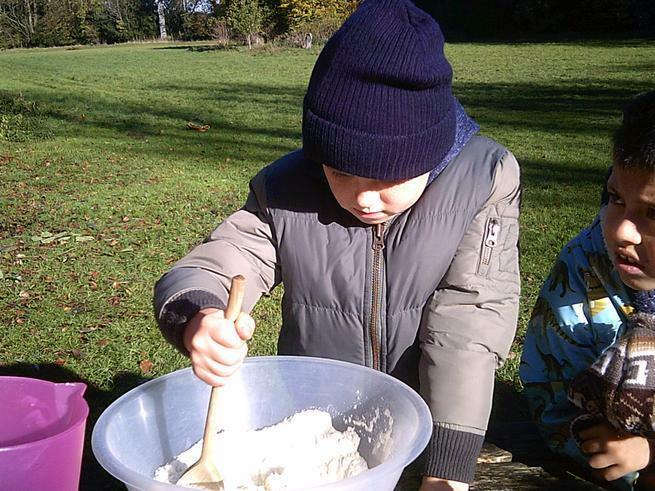 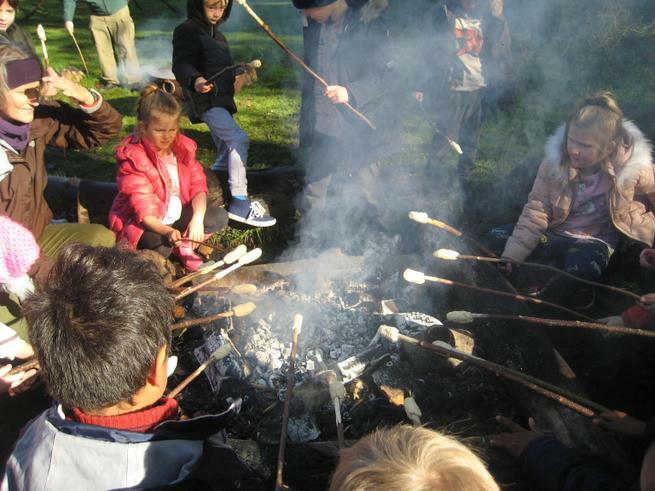 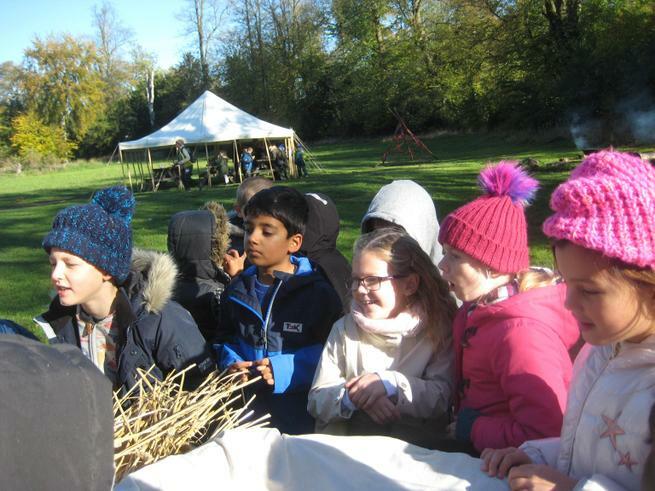 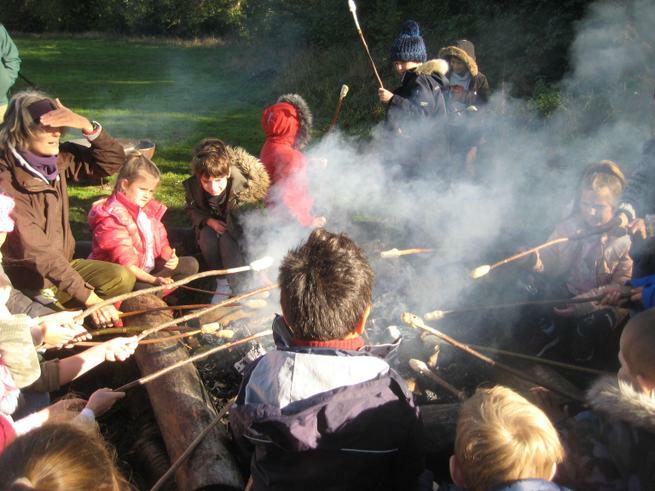 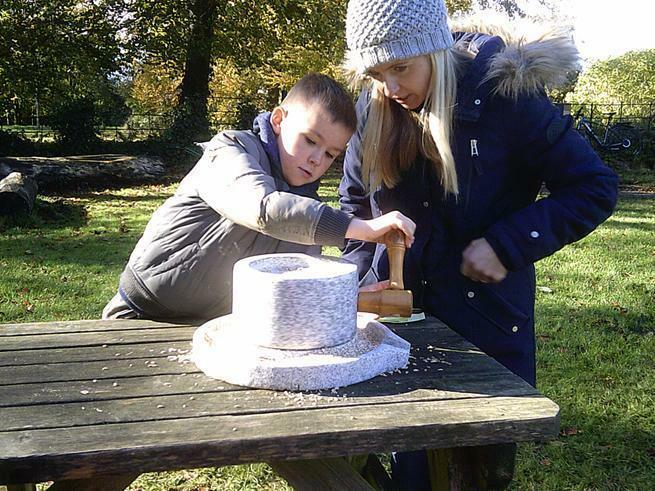 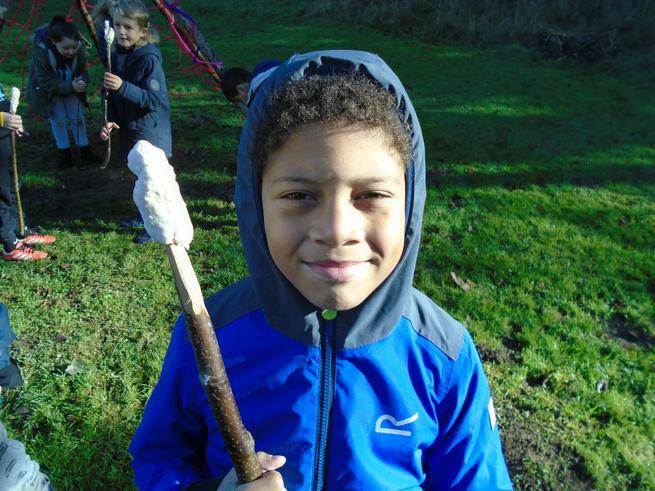 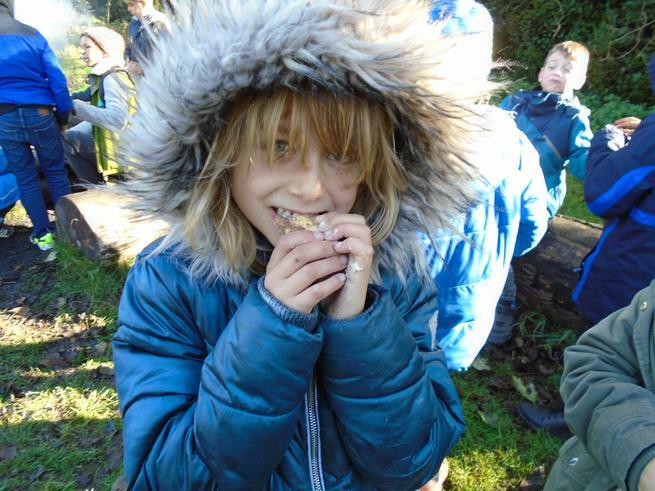 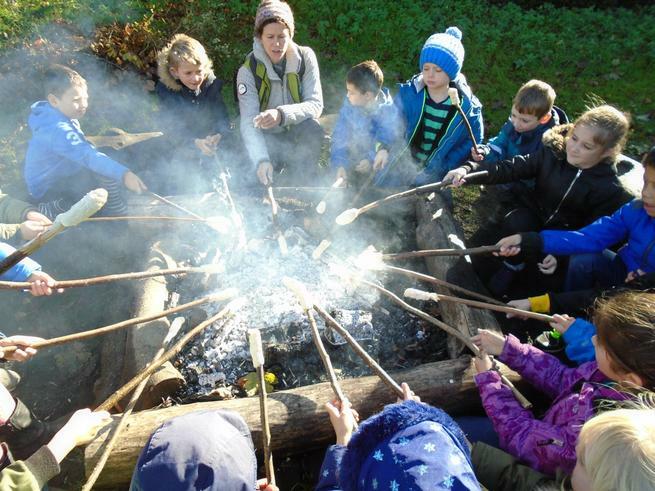 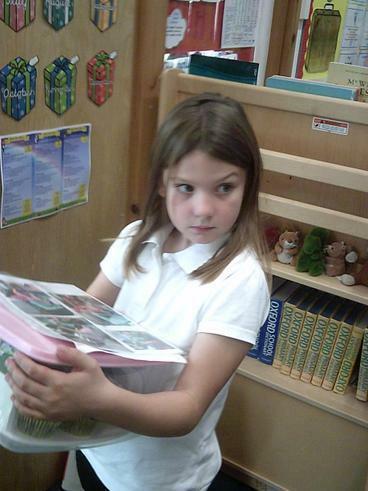 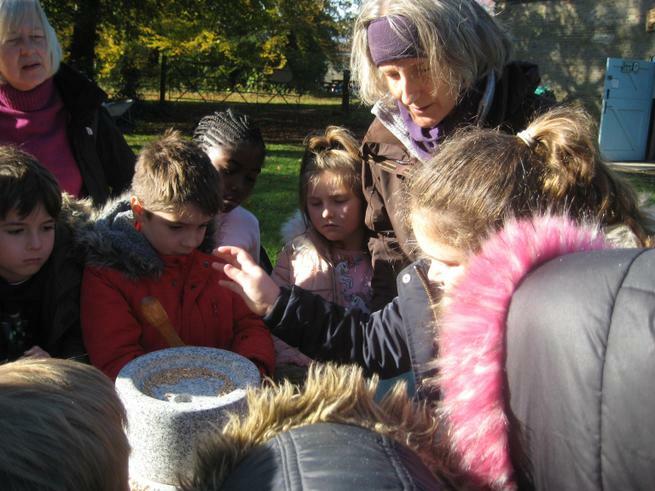 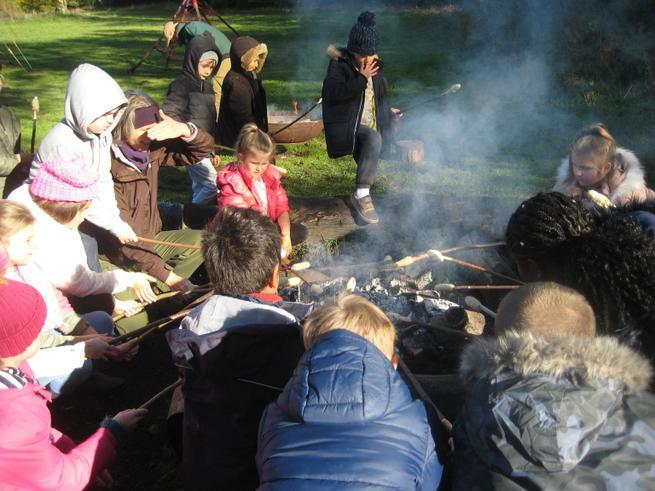 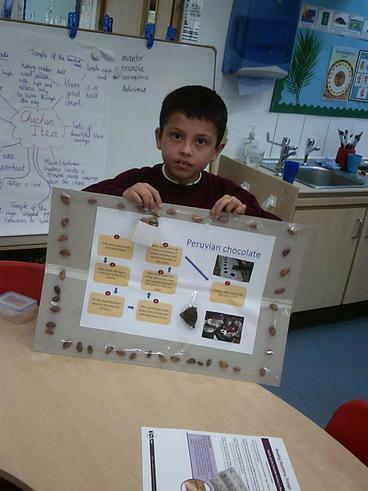 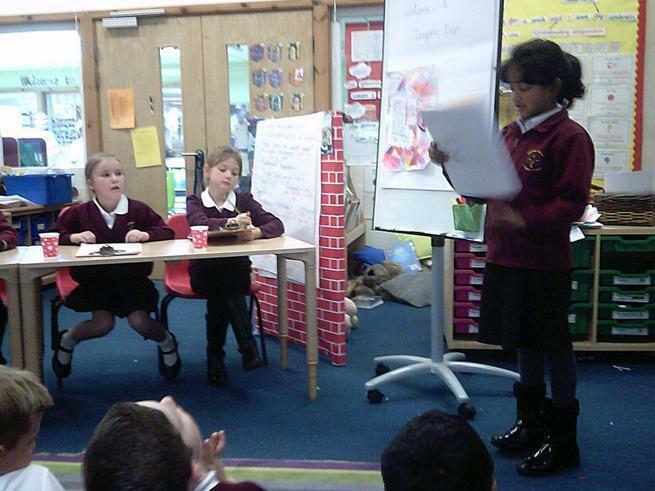 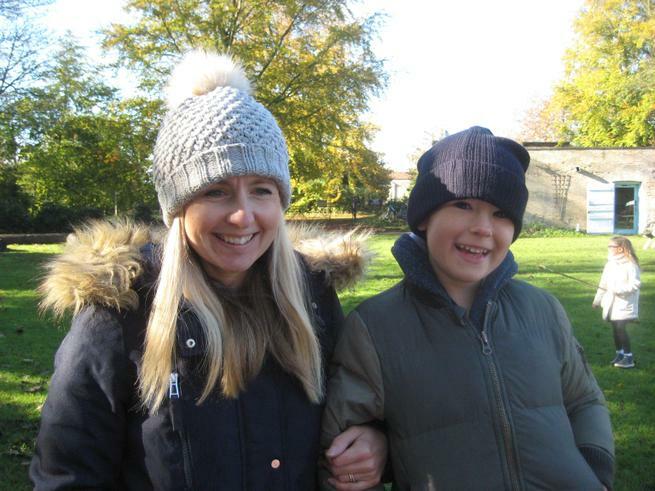 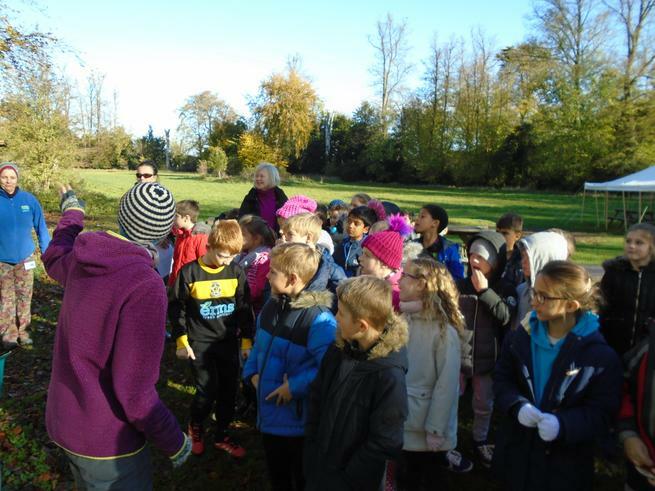 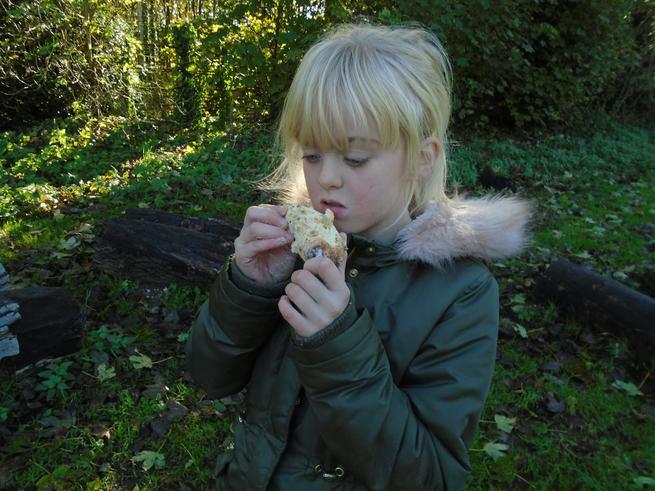 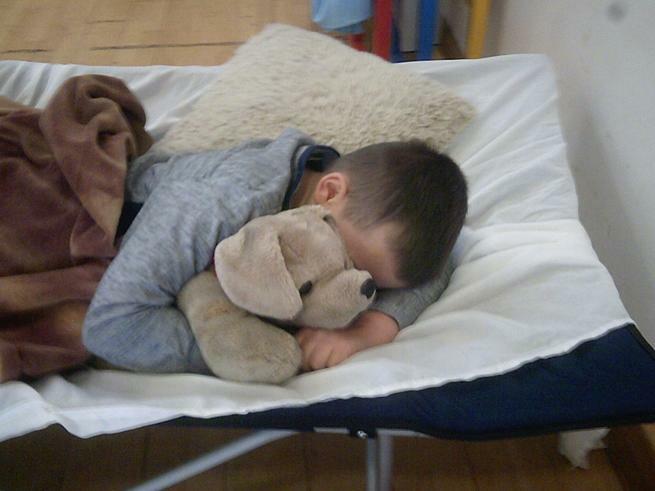 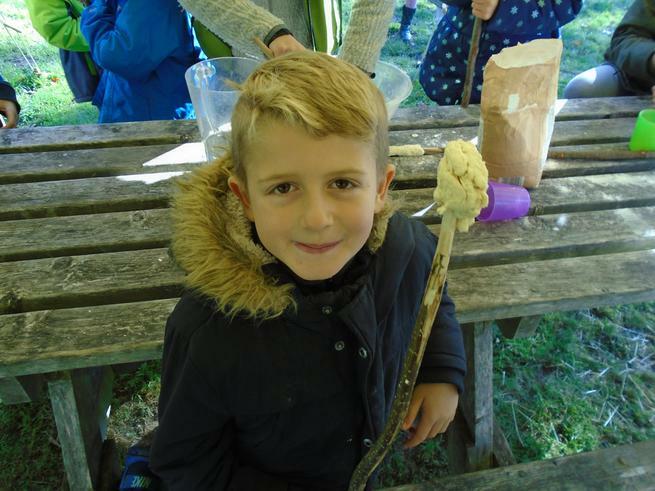 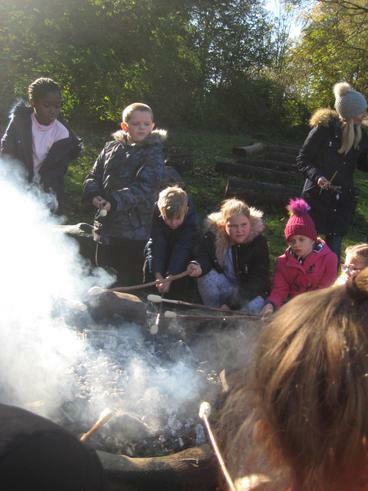 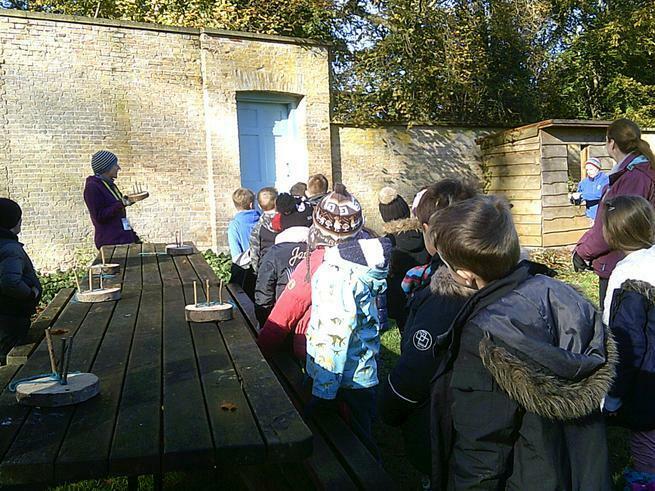 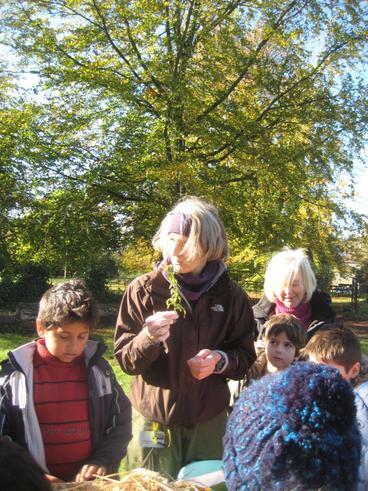 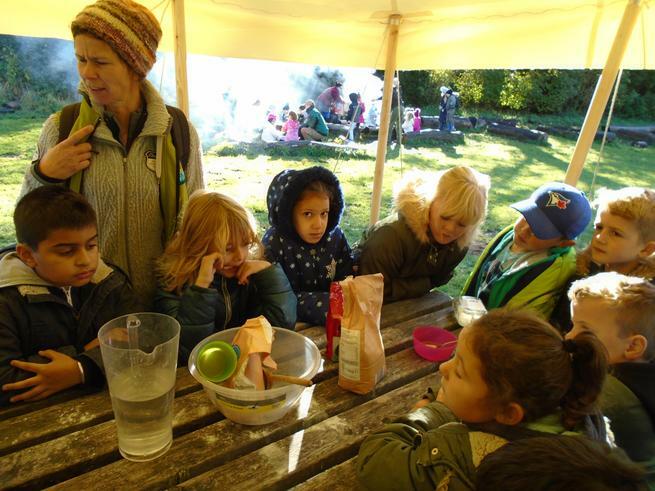 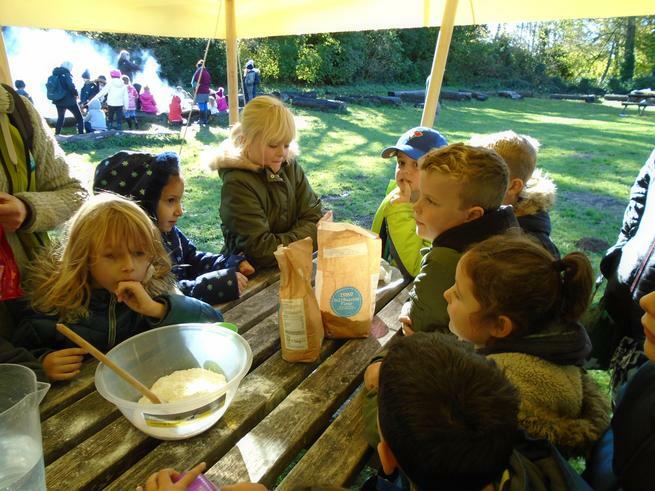 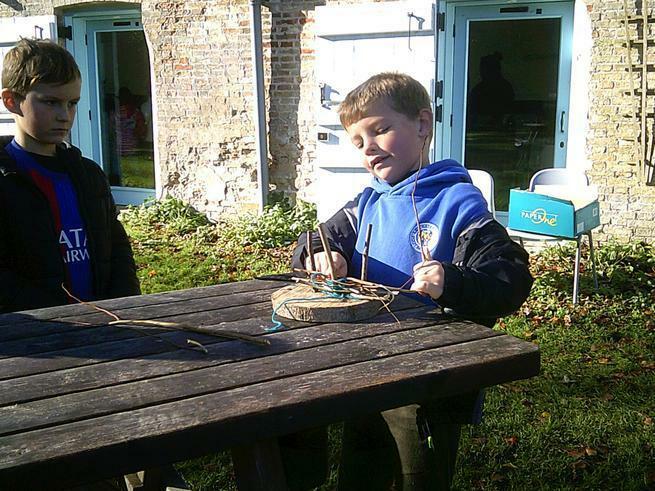 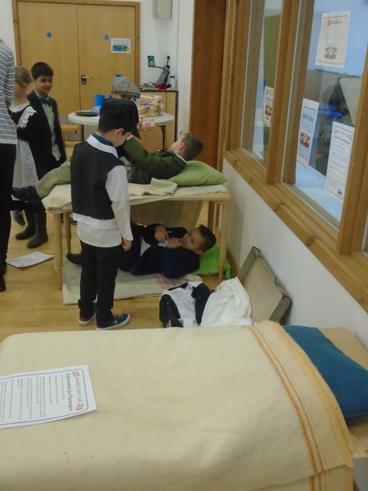 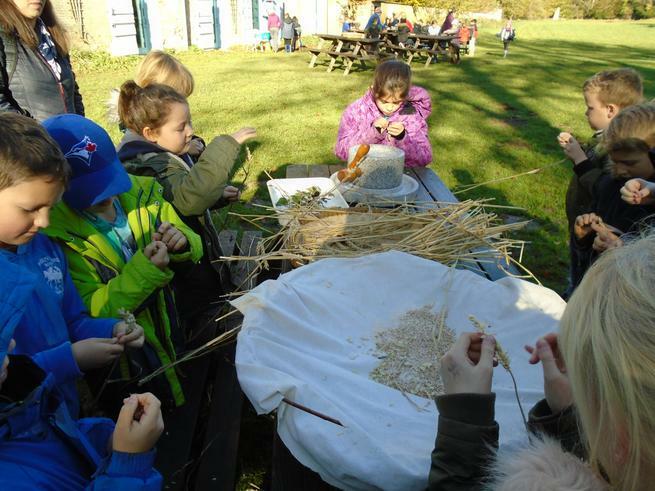 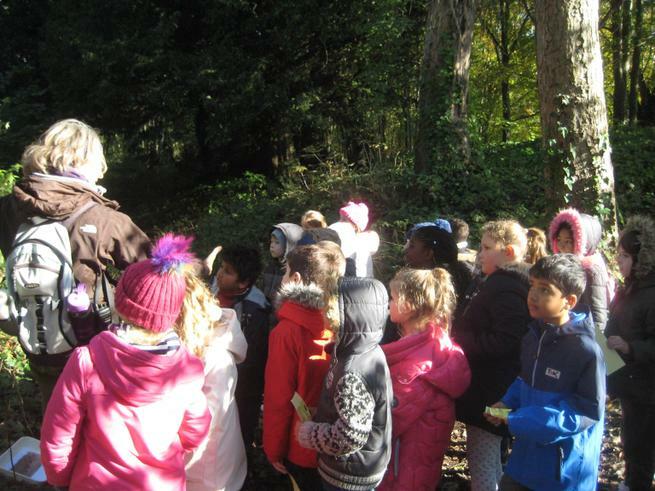 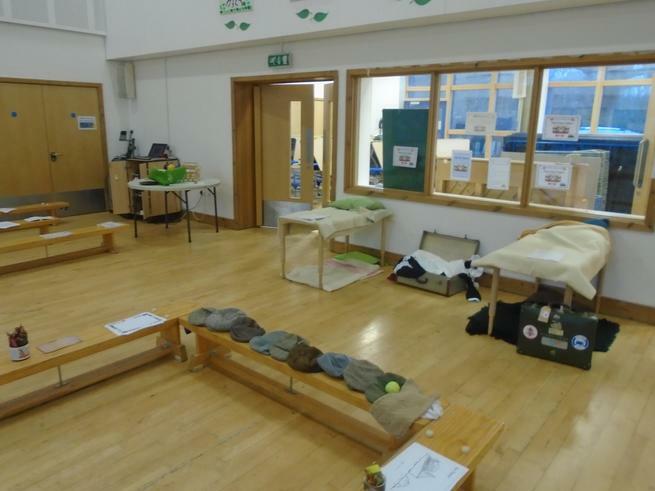 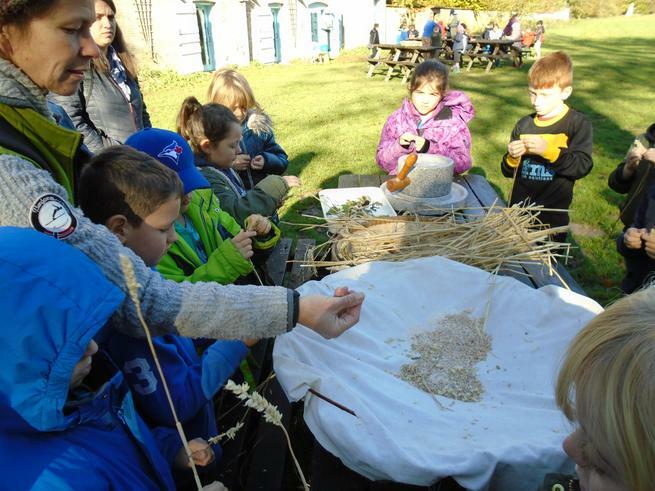 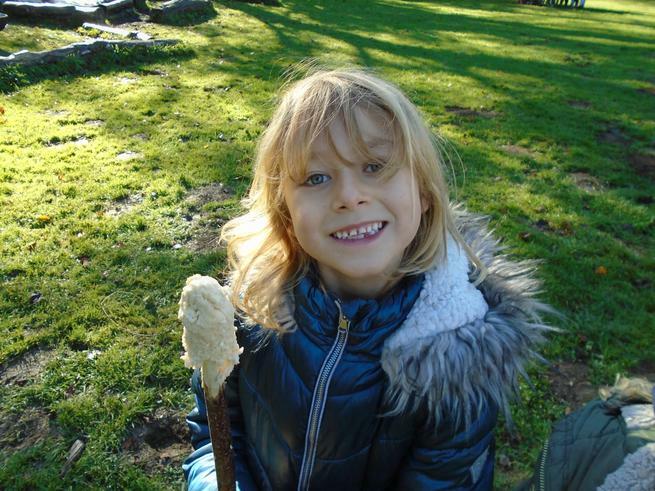 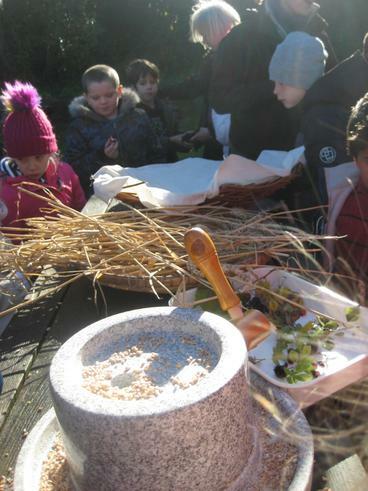 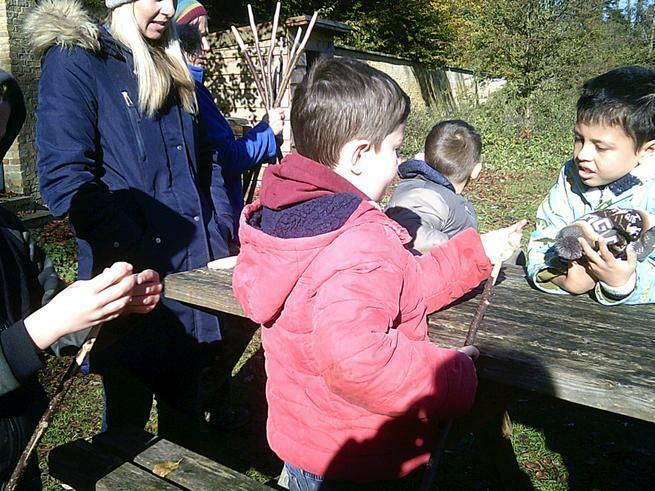 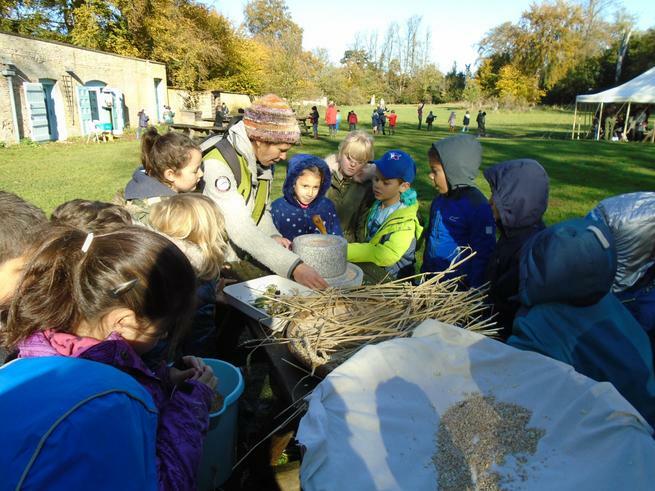 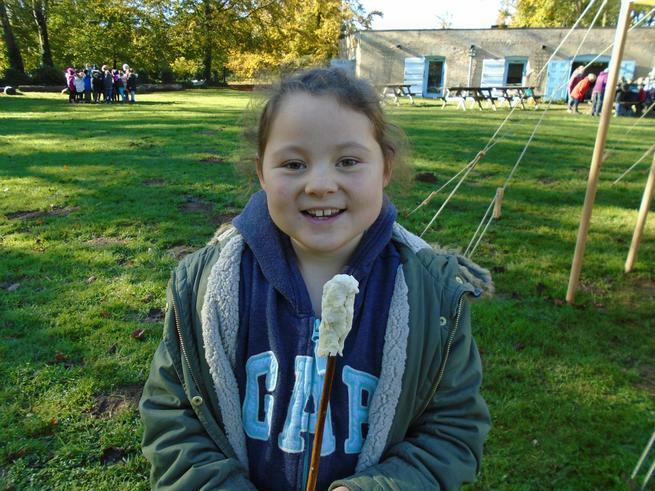 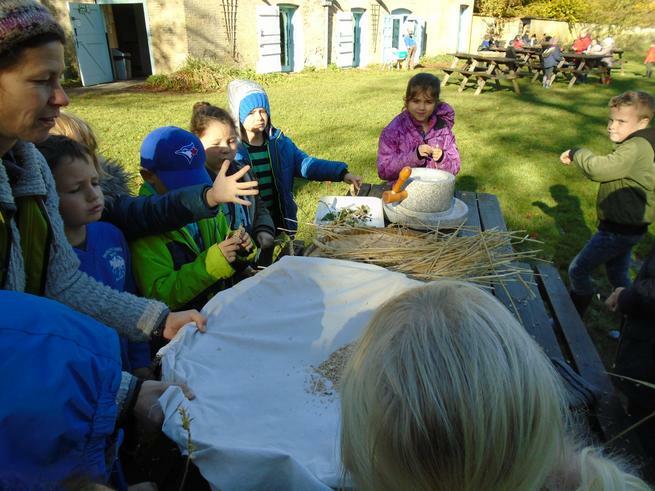 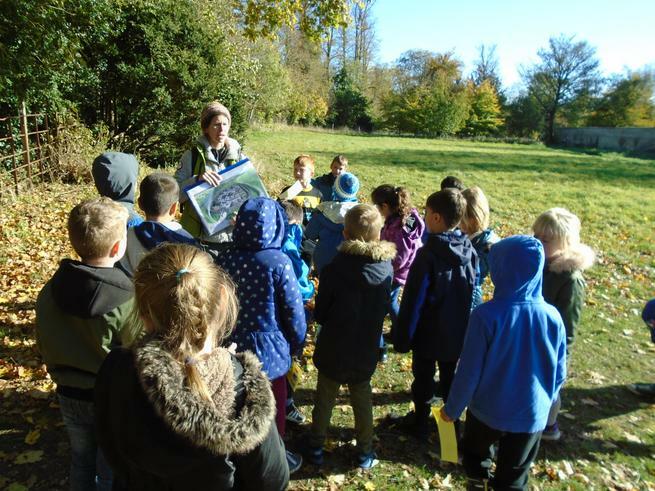 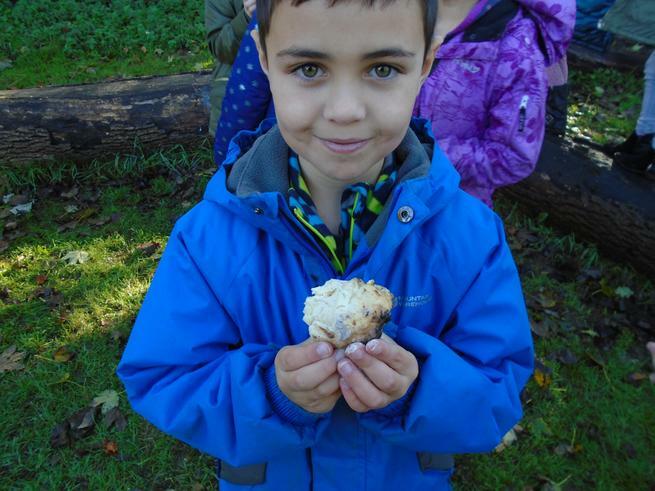 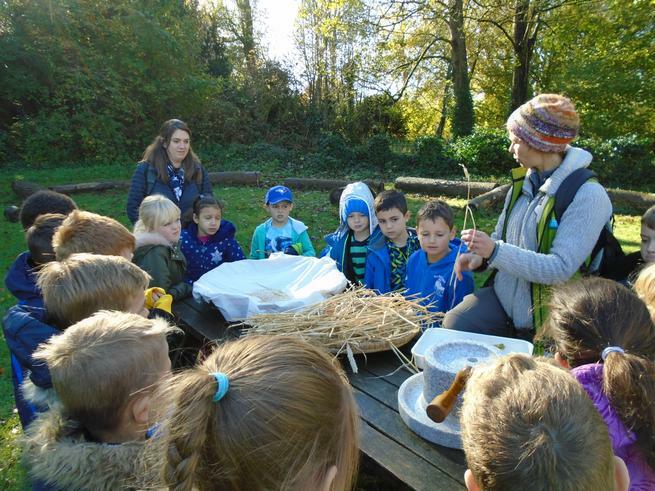 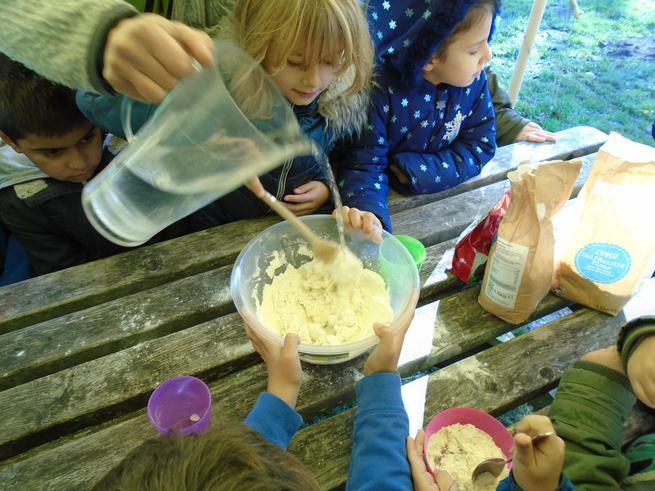 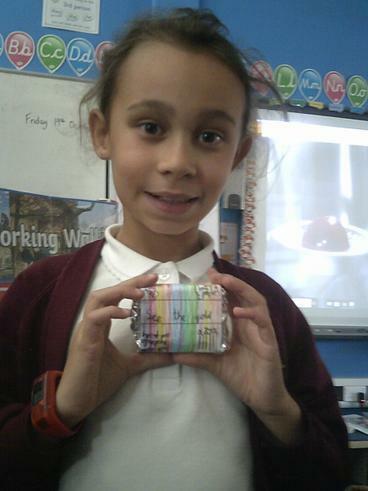 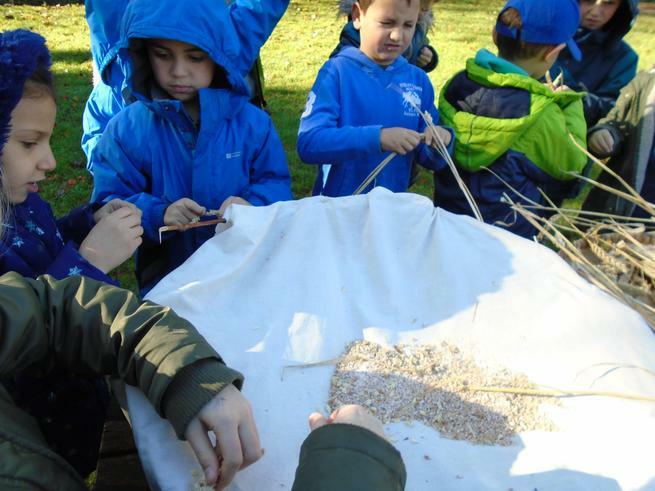 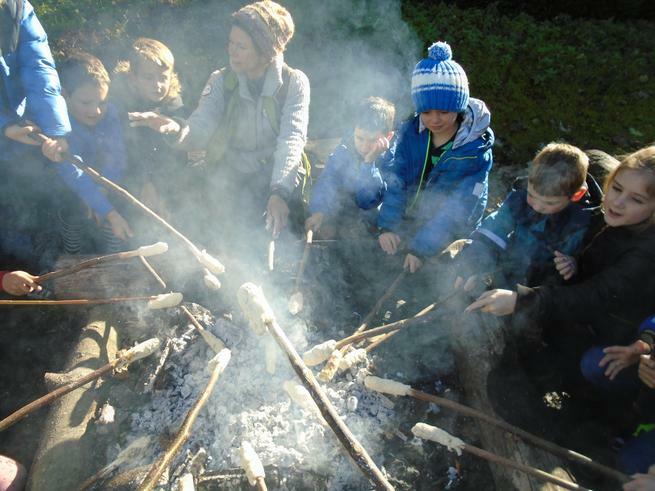 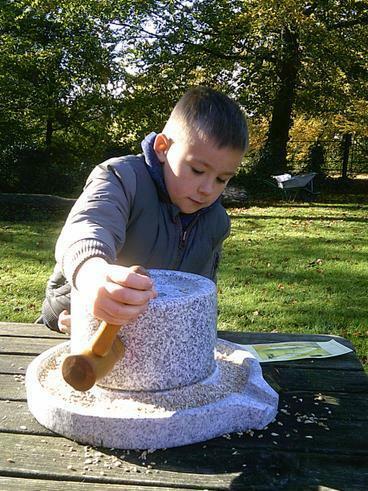 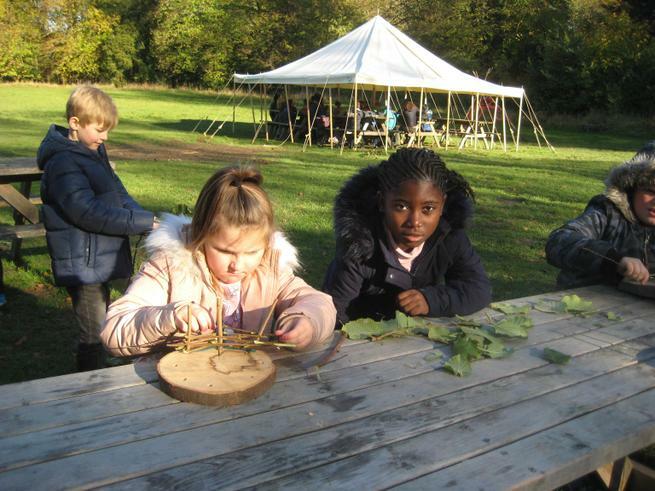 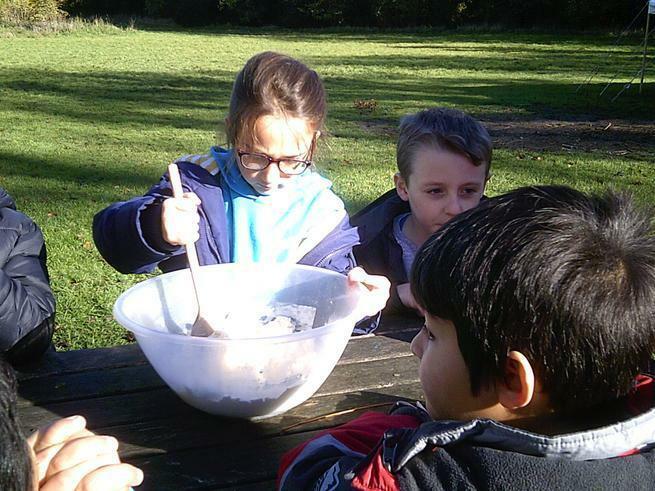 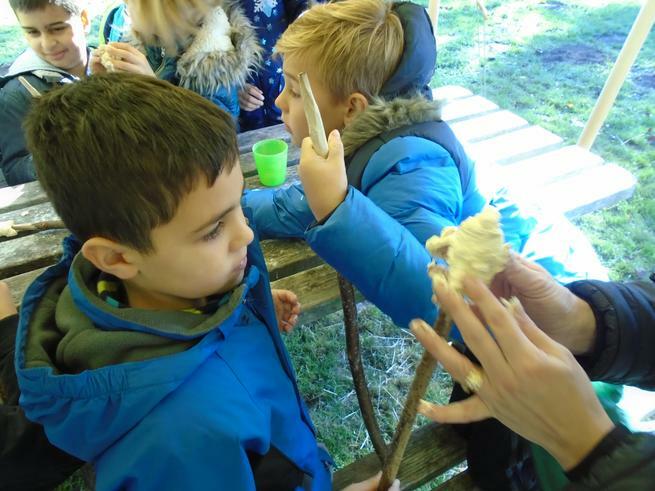 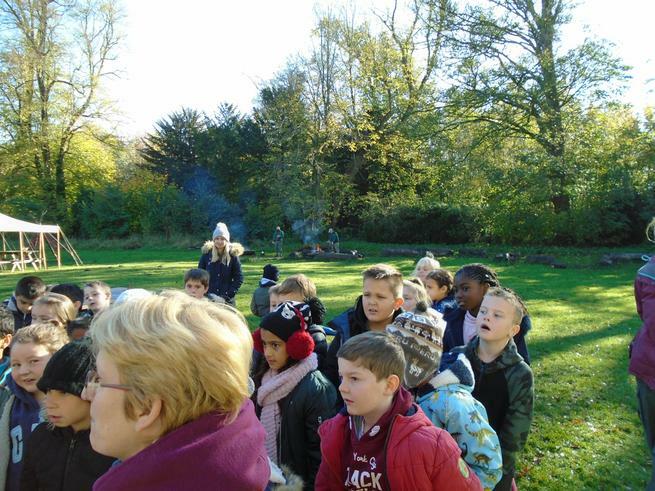 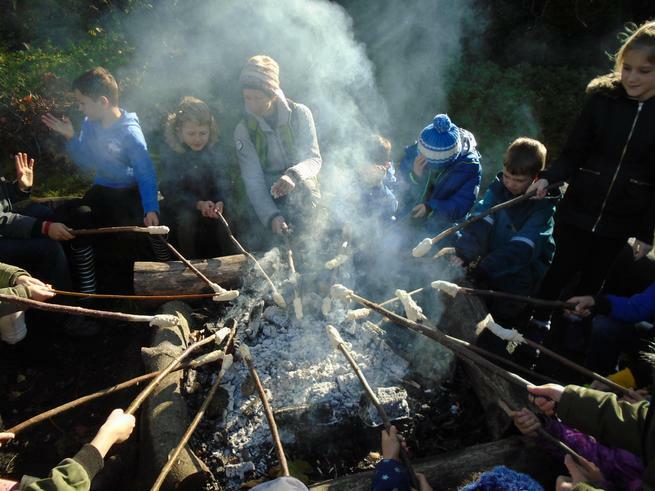 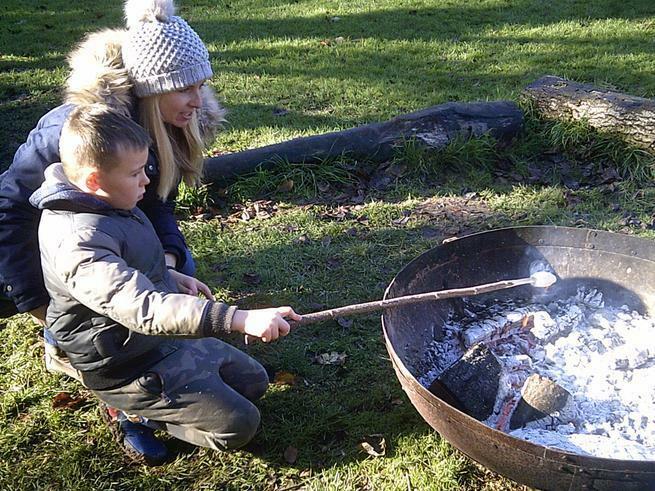 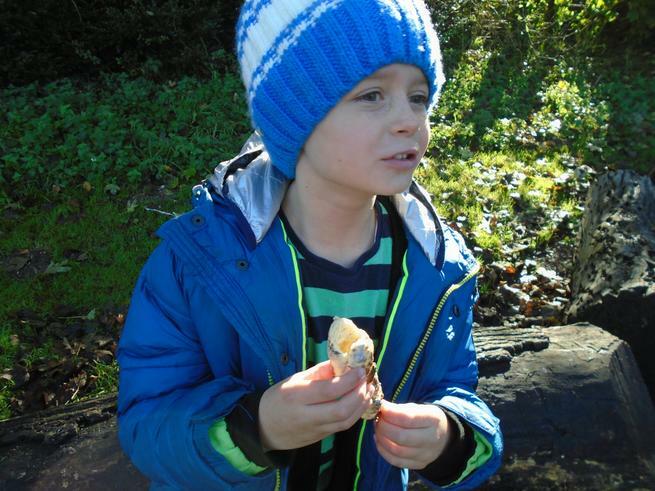 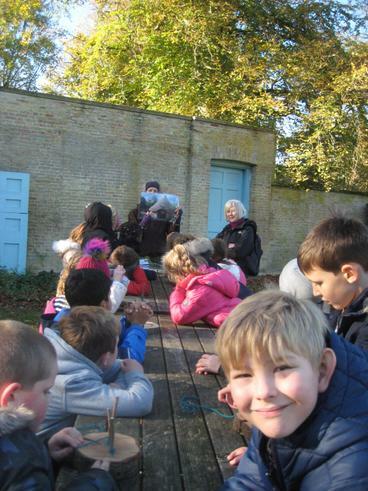 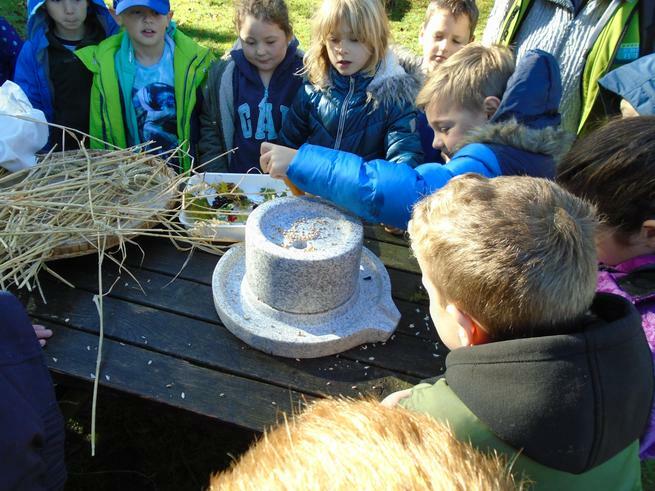 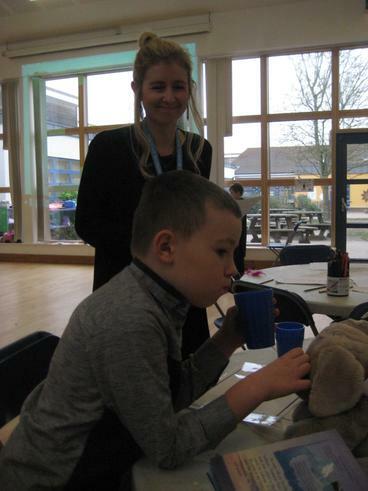 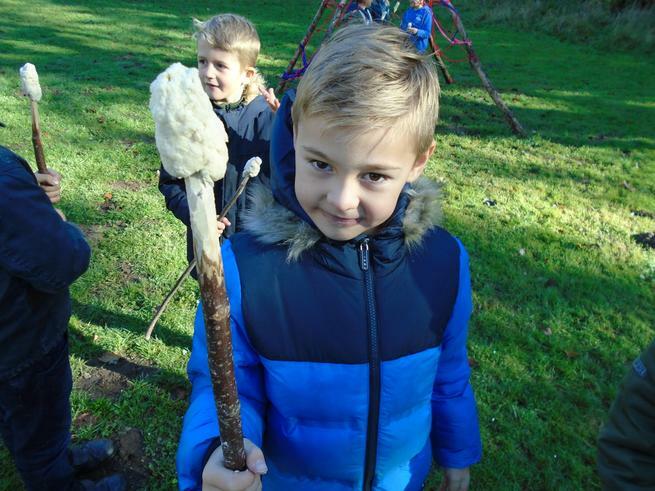 We recently enjoyed our Wow day where the children visited Cocoa Jeavons. 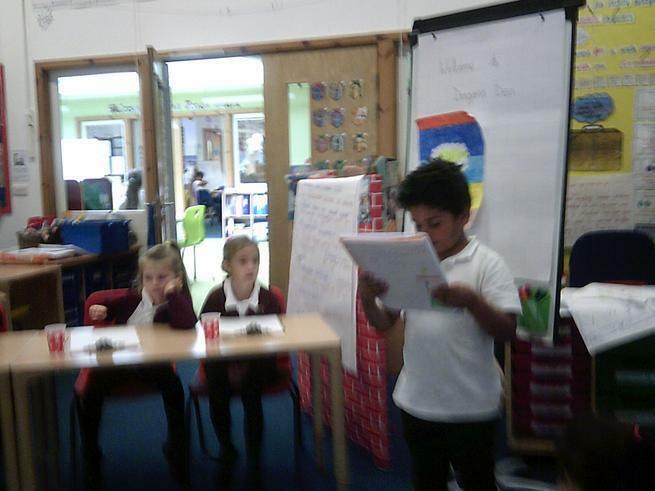 They were able to sample the menu and then review some mystery chocolates. 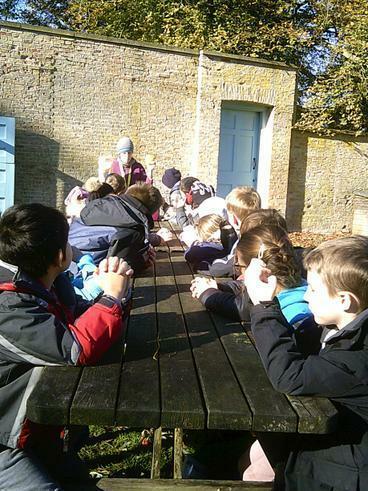 We all had a great afternoon.